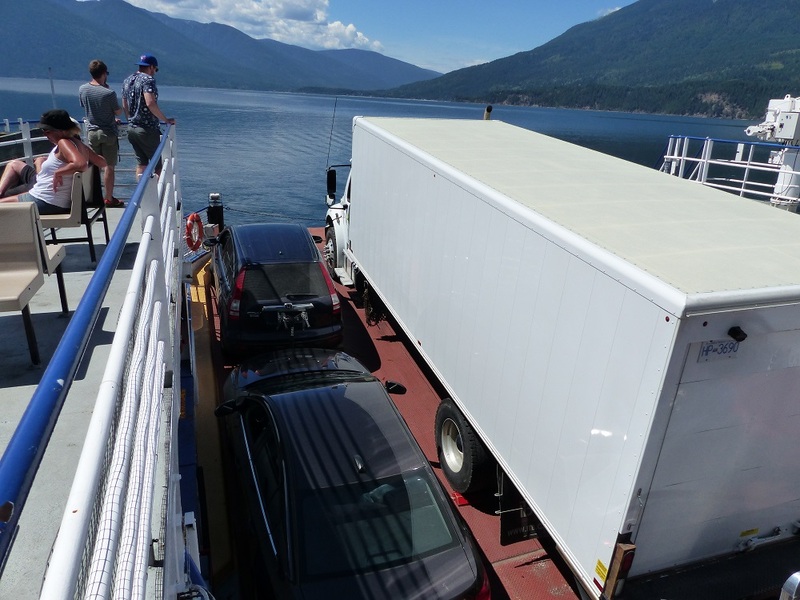 June | 2015 | Frank & Donnis Travel Blog "the more we see the more there is to see"
Another day of warnings about being in bear, cougar, elk and moose country. 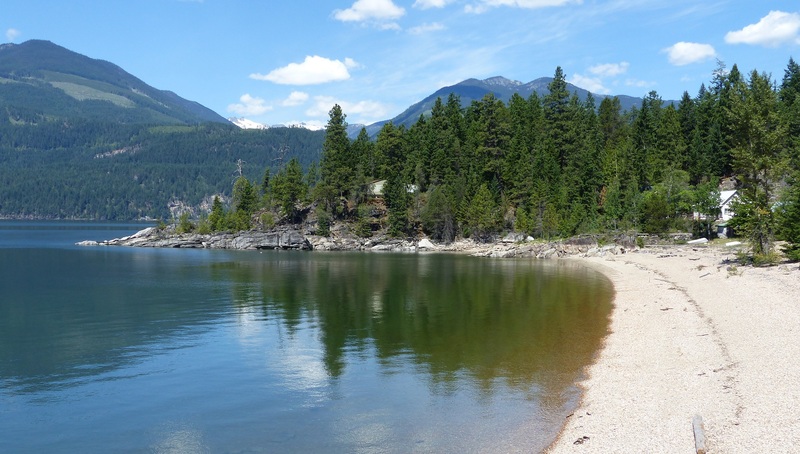 After a breakfast of our wonderful Costco Sultana Bran and the milk I bought last night we had an early morning look around Kaslo before continuing our run north along Kootenay Lake. 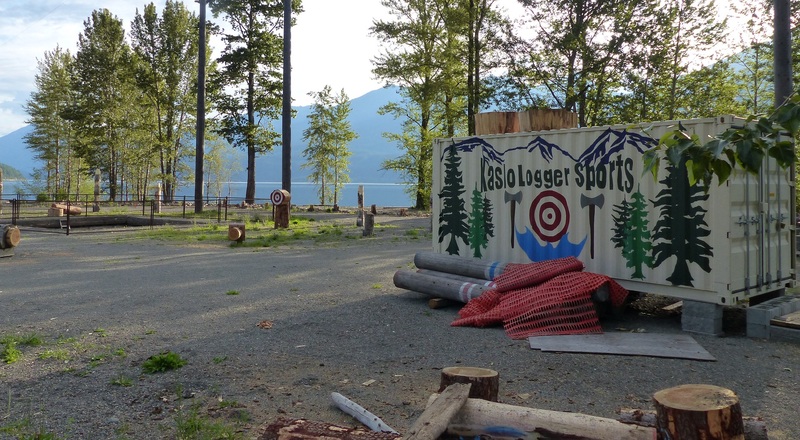 We found the interesting Kaslo Logger Sports Show site. The sports are held mid May each year and include pole climbing, woodchop, log rolling, tree felling and axe throwing. This year the event was M’Ceed by a Kiwi Champion and contestants from Oz. Never heard of it until now. 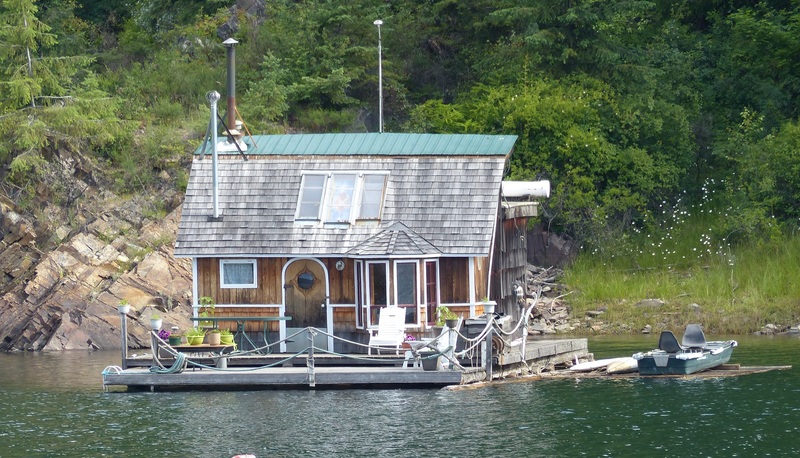 Also another smaller stern wheeler and a couple of boat homes caught our attention. 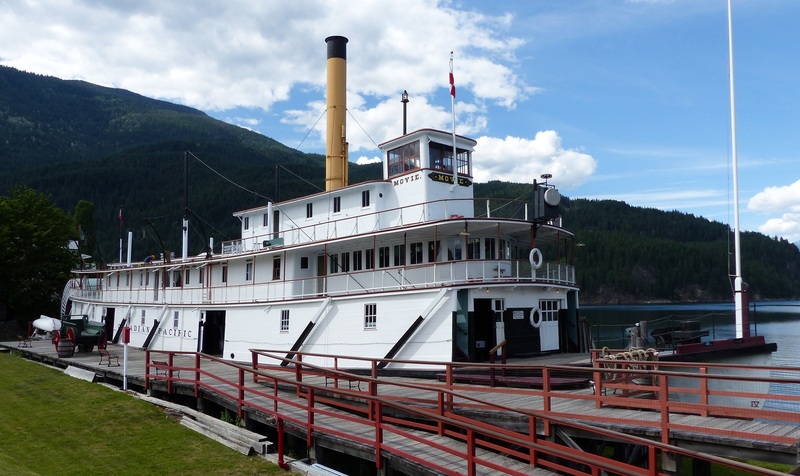 A stern wheeler at Kaslo. We could not find any information on this apparently well maintained relic. 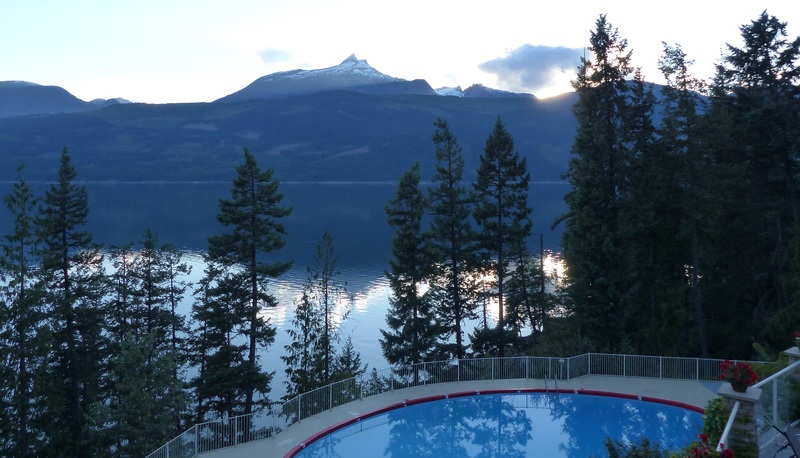 Morning on Upper Arrow Lake at Kaslo. 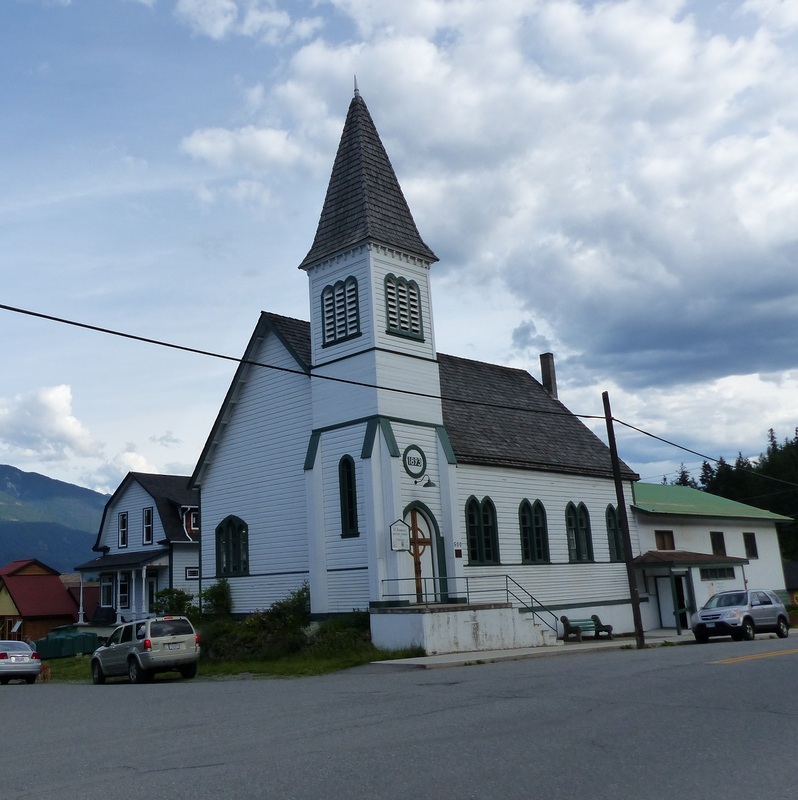 We started off with a beautiful sunny day, our destination was a ghost town, a 14 Klm detour along a winding gravel road off the main highway. 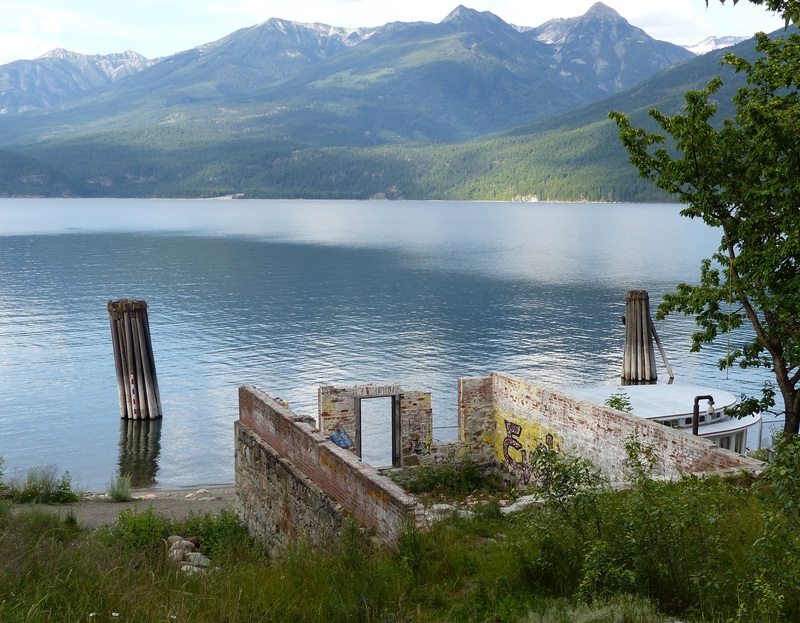 Unknown lake between Kaslo and New Denver. By the time we reached Sandon it began to rain. https://en.wikipedia.org/wiki/Sandon,_British_Columbia Drizzle at first but it became more persistent as the morning wore on. 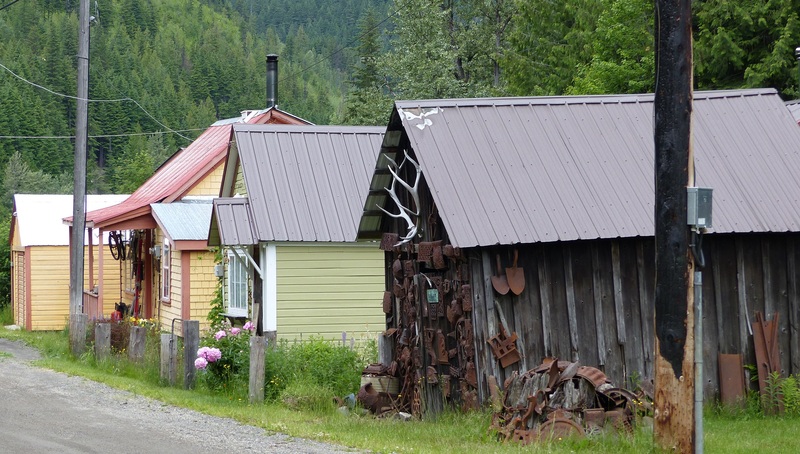 This town became a centre of mining in 1891 when silver, lead and zinc were found. By 1898 the population had grown to 5,000 and it was declared a city. 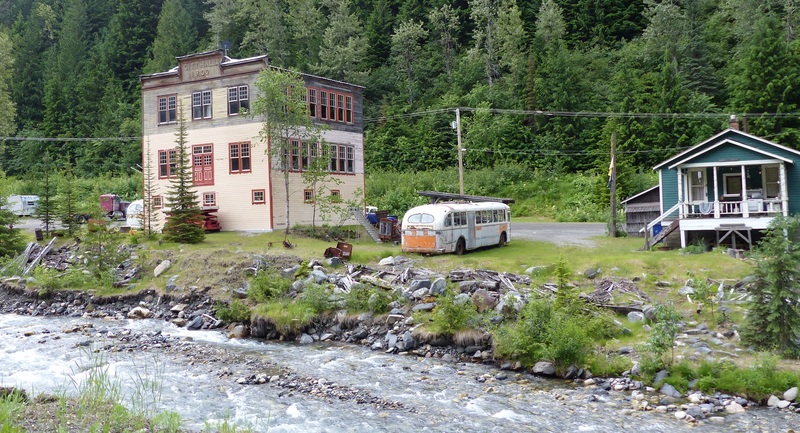 Most houses and commerce buildings were built along the creek. 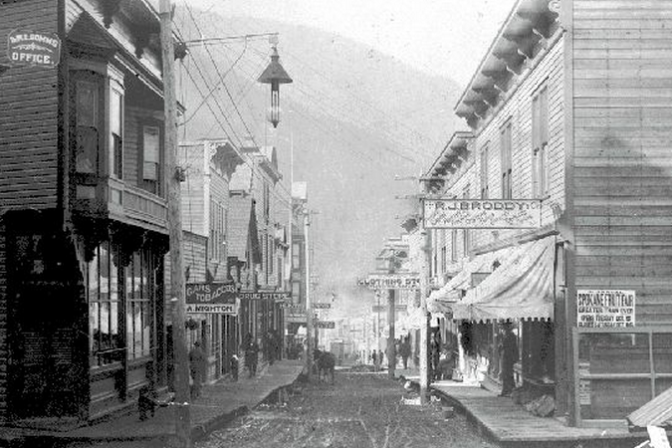 In 1901 much of the town was destroyed by fire. It was rebuilt. Much of the town was destroyed by flood in 1955. By then the town was abandoned anyway so has not been rebuilt. Original Molly Brown brothel at Sandon ghost town. It was one of the first buildings restored. Hmmm! Sandon houses waiting to collapse under their own weight. Whatever is left is now part of an indoor outdoor indoor museum with relics from places other than Sandon. 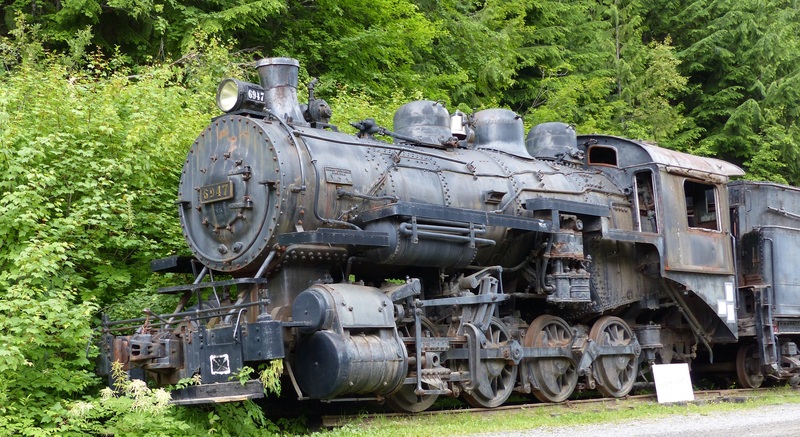 Train engine waiting for restoration. 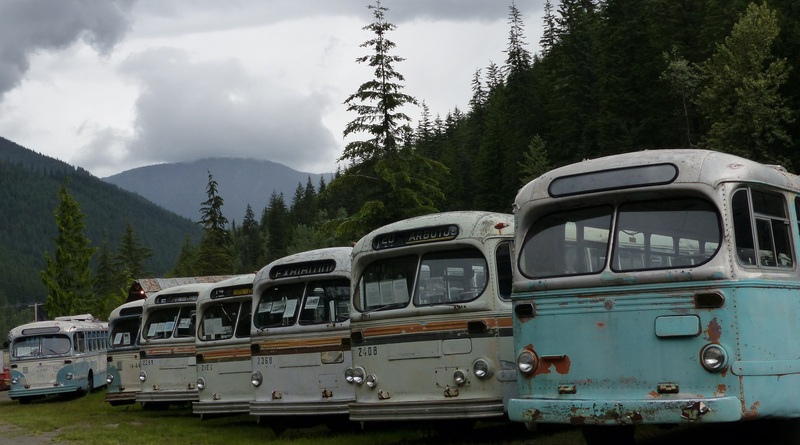 How do you explain trolley buses from Vancouver 700 Klms away? When we arrived the town was lonely and forlorn with no evidence of human habitation but within an hour a car arrived and several buildings had lights turned on. It was cold and the rain convinced us to move on without visiting the museum. From previous reading we knew the town had been turned into a Japanese Canadian Internment camp during WWII. https://en.wikipedia.org/wiki/Japanese_Canadian_internment The internment stripped all Japanese Canadians of their jobs, homes, businesses, properties and status. During this time and afterwards they were sent to work at jobs nobody else would take on. On reflection even the Canadian Government of the time realised it was a purely racist decision and a dark chapter in Canadian history one which has been kept quiet. 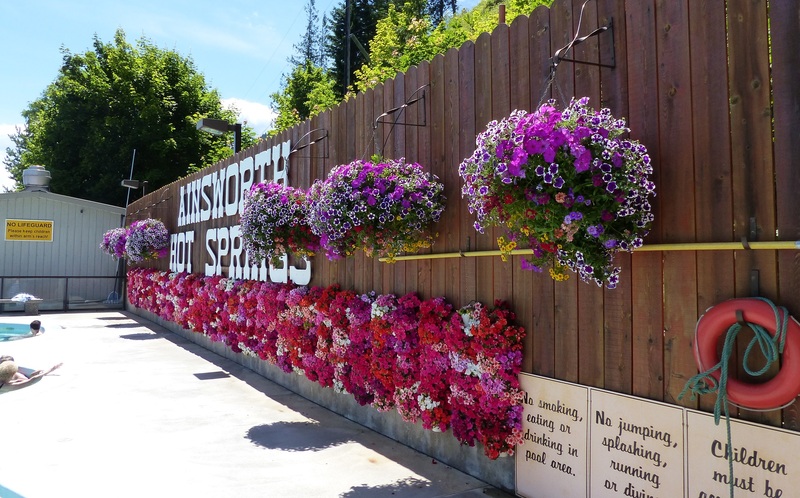 From our wanderings we saw no mention of the internment camp use in the town. The drive back down the isolated gravel range road to the main highway was driven with extra care given the wet & slippery conditions. Still operational mine on the creek below the ghost town of Sandon. 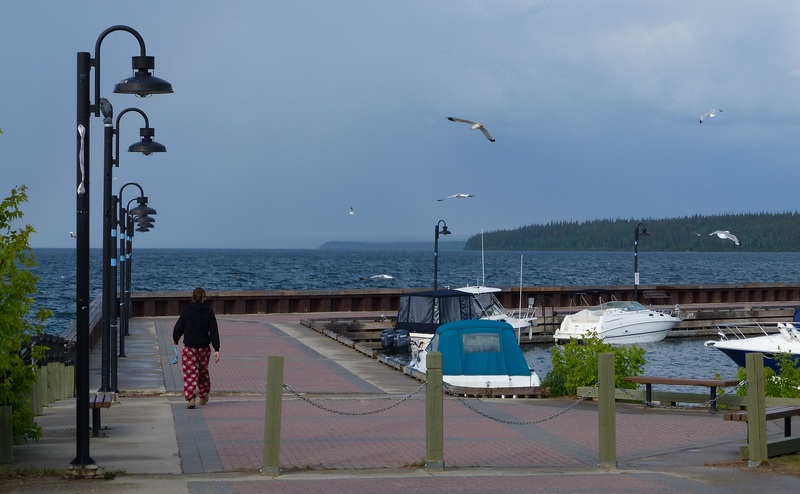 Next town was New Denver but we could not explore as it was raining heavily but we did stop for coffee and of all things, a sausage roll, unheard of so far in Canada. Given the rain and expectation that it would continue for a few days as it headed south, we changed our plans. Instead we decided narrow mountain roads in these conditions were not for us so the decision was made to head north. 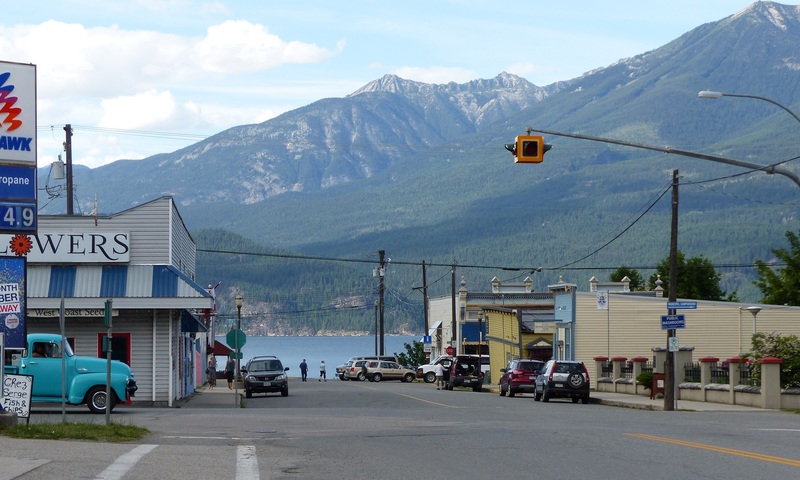 Next stop was the town of Nakusp on the Upper Arrow Lake. 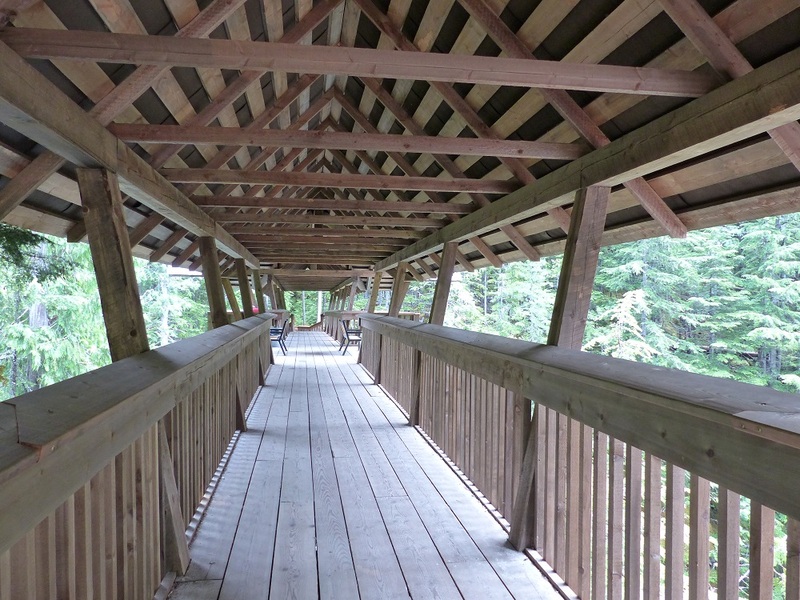 Covered Timber footbridge over Kuskanax Creek near Nakusp Mineral Springs. 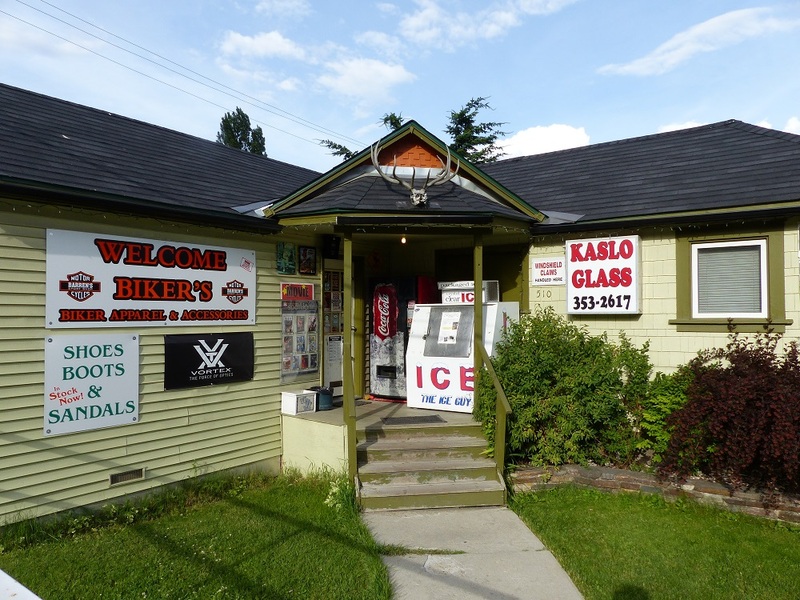 We decided not to stay in Nakusp overnight but to push on to the Halcyon Hot Springs further along the road bordering the Upper Arrow Lake. Given the location and almost exclusive nature of the resort, the prices were reasonable so we elected to stay the night and were given the Poolside Cottage. Inside our timber lines Poolside Cottage. The usual bear and cougar warnings prevailed. 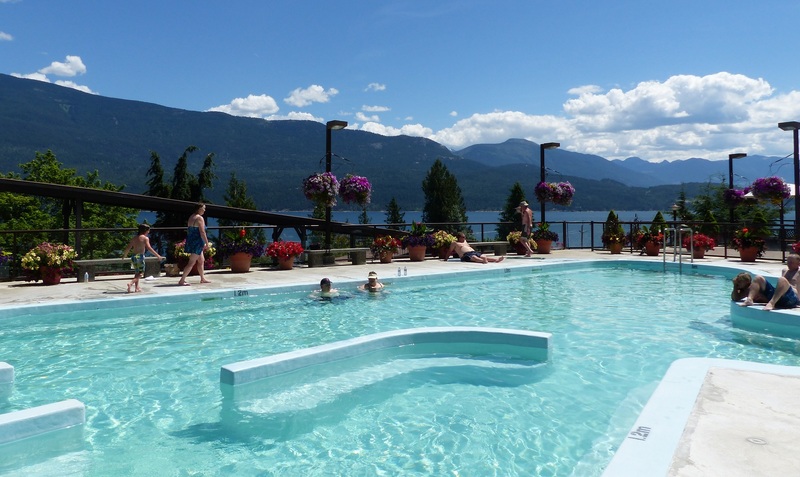 The hot pools and views across the lake were stunning and by now full sunlight with attendant heat had arrived. Halcyon Mineral Springs with our poolside cottage. Halcyon view over the lake. What a lovely spot. 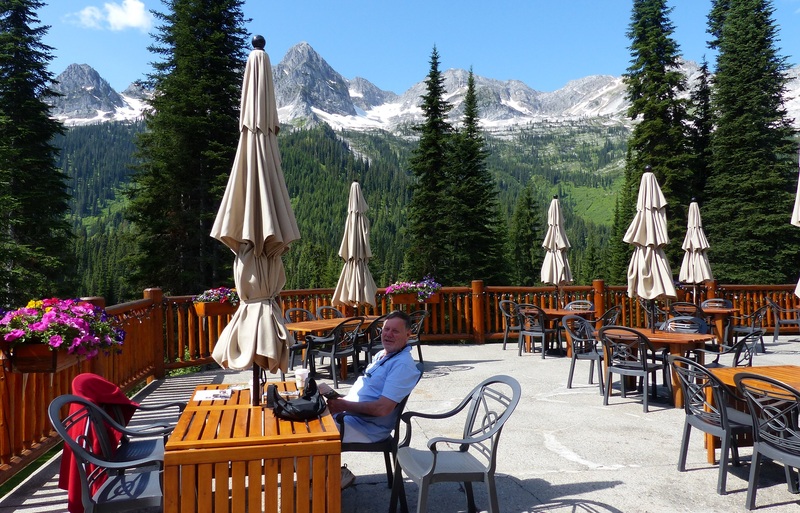 Dinner with a couple of draught Kootenee ales cost only a little more than dinner at a Boston Pizza. 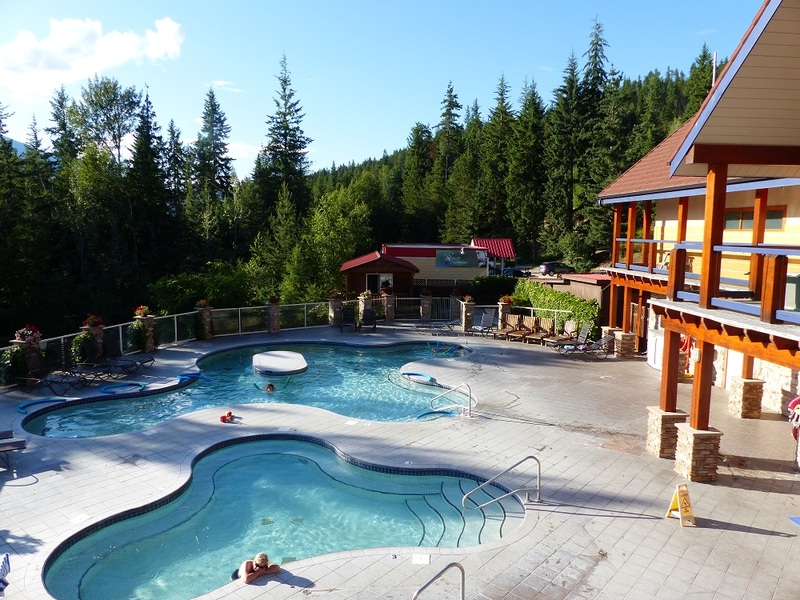 Evening at Halcyon Hot Springs. Luckily we bought a half litre of milk from the small local supermarket yesterday evening. We have carried some Sultana Bran with us and had packed the milk in ice overnight. That was breakfast. After checking out of Bear Mountain Motel we drove out of town to Cameron Lake. Accumulated snow at the end of Camerons Lake. Ranger advise kayakers not to approach that end of the lake. The snow is top heavy and ready to fall into the lake. This is another delightful lake surrounded by snow and ice covered mountain. Oh, yes, notices are plastered all over the ranger station warning of bear and cougar activity. We walked along a path which followed the lake for about a half Klm but once the path started to lead up away from the lake we decided we had no time to continue the hike. 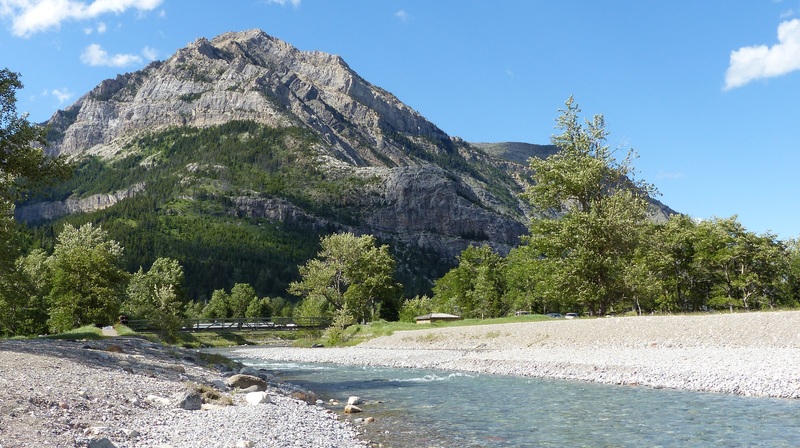 Camerosns Creek high in the hills above Waterton. The drop tro the water is steep. 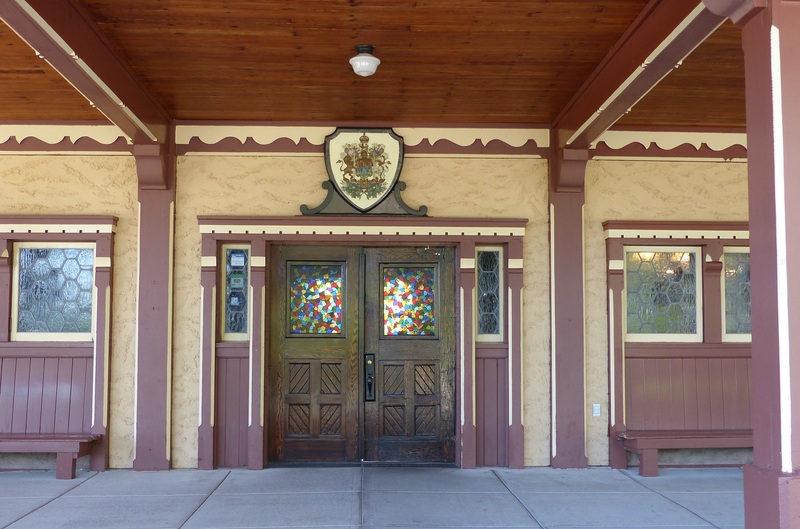 From the lake we drove back to Waterton Lake to visit Prince of Wales Hotel The beautiful carved beams adorning the exterior and interior indicates just how much care and attention went into building the hotel. The huge floor to ceiling windows gives a view of the town and lake. View from foyer and waiting room at Prince of Wales. Fabulous. 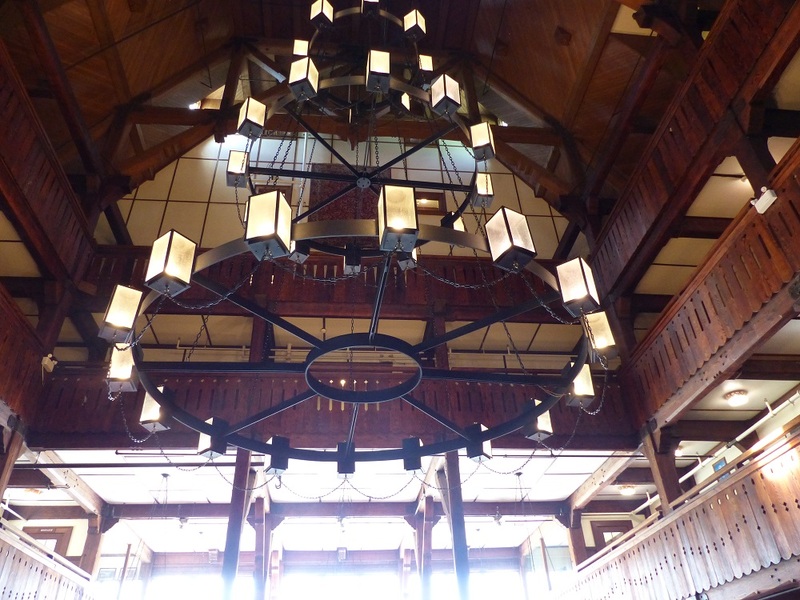 In the main foyer and waiting room is a giant chandelier hanging from three stories above the floor. The hotel has a printed information sheet which contains two hotel ghost stories. Look carefully and enlarge the photo. 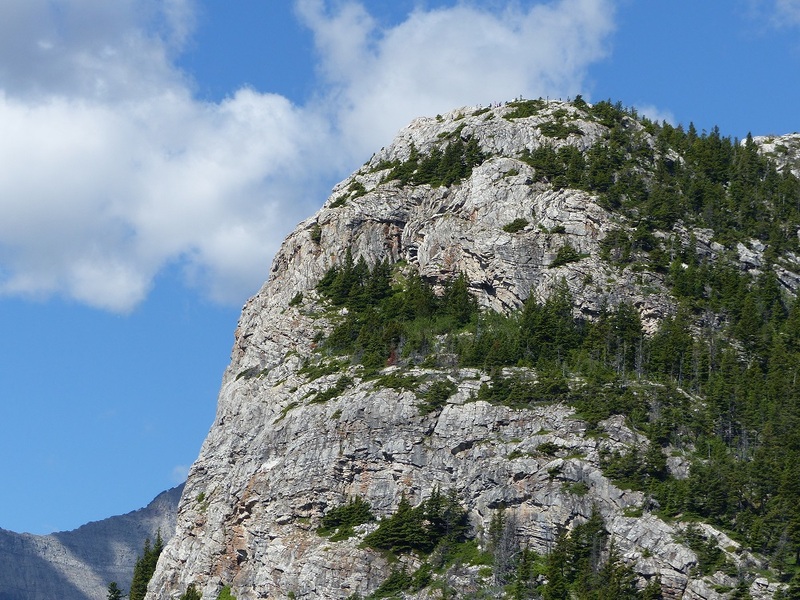 You can see a group of people having climbed the face of what I believe is Bears Hump. 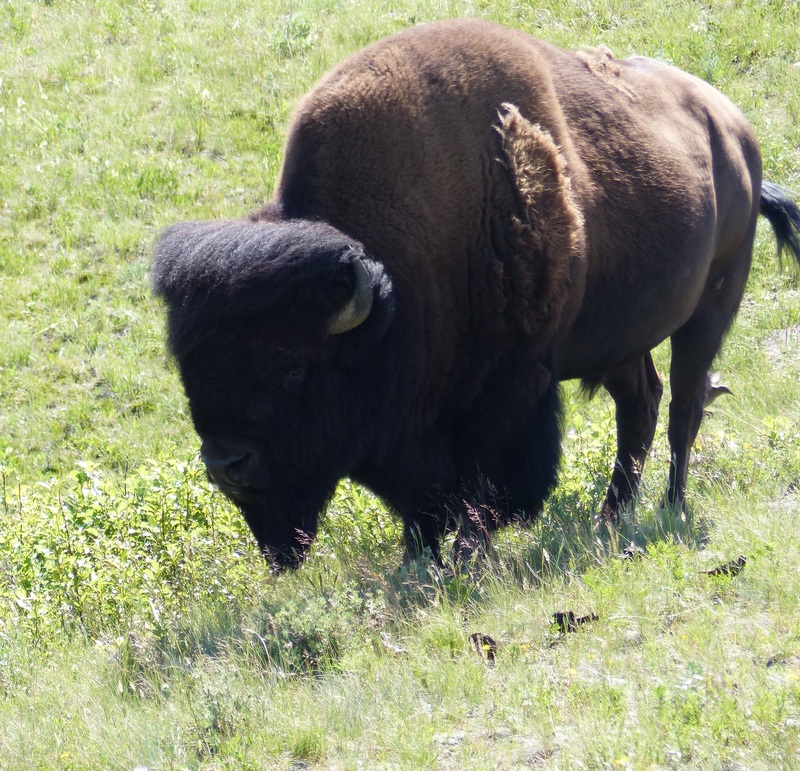 We then retraced our steps on the road to Pincher Creek but stopped at a Bison enclosure between Waterton and Pincher Creek. This one lane road winds backwards and forwards through the Bison enclosure. This enclosure encompasses around 40 acres and is supposedly Bison proof. You can only access the park in a car and are warned Bisons can be dangerous and to stay in your car. We saw a dozen or so Bison doing what Bison do when in a happy mood. Several cars ahead and a couple of motorhomes following were all parked on the tiny road verge taking photos by the score. A small herd of bison. Our first sight of a Bison. Ugly isn’t he? 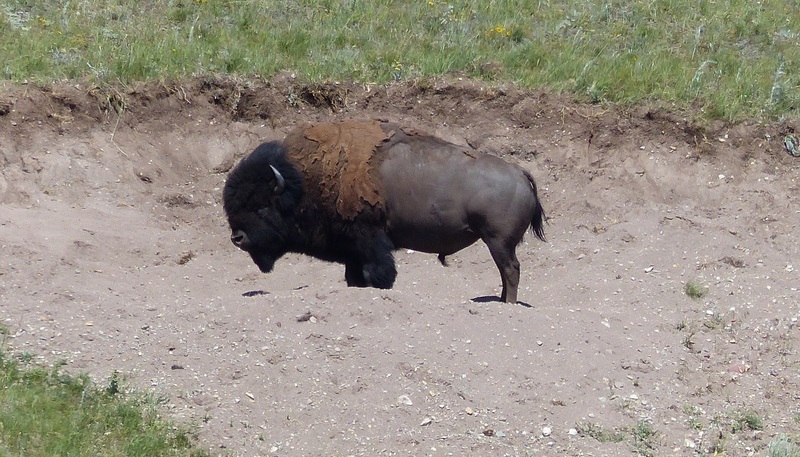 This Bison rolled in a snad oit to scratch his back and presumably to remove the winter fur coat. Once again I can find scant material on this amazing location in a Google search. There are few signs at the site to explain how when where why and who put the enclosure there. 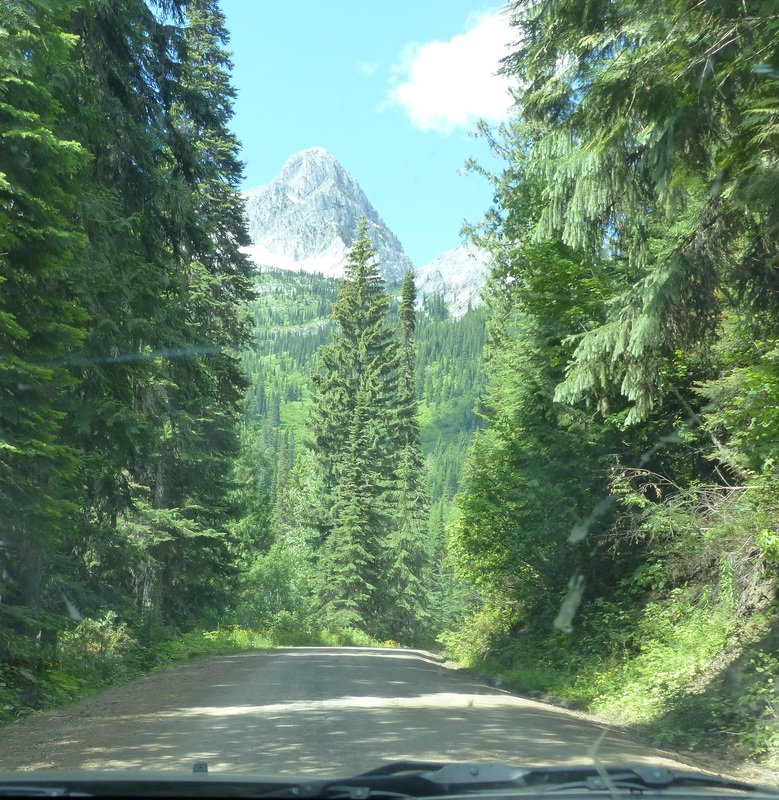 At Pincher Creek we took the Crows Nest Pass to whatever our next destination would be. We stopped at the site of an old colliery, the Leitch at what was once Passburg. Mine |Managers Residence. Just look at the size and strength of this building. A simple house would have been more appropriate. 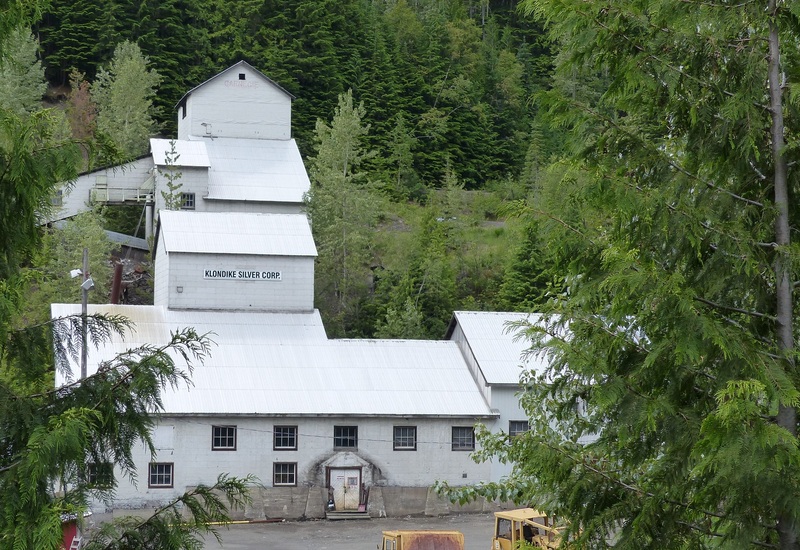 All the mine buildings suffered from too much money being spent and would come back to destroy the mine in bankruptcy. This once thriving mine and coking ovens was built in 1907 and was built to be a model of up to date equipment and practises. Basically the mine was undercapitalised, had too much infrastructure and too little good relations with its business partners. By 1915 and World War 1 it ceased production. 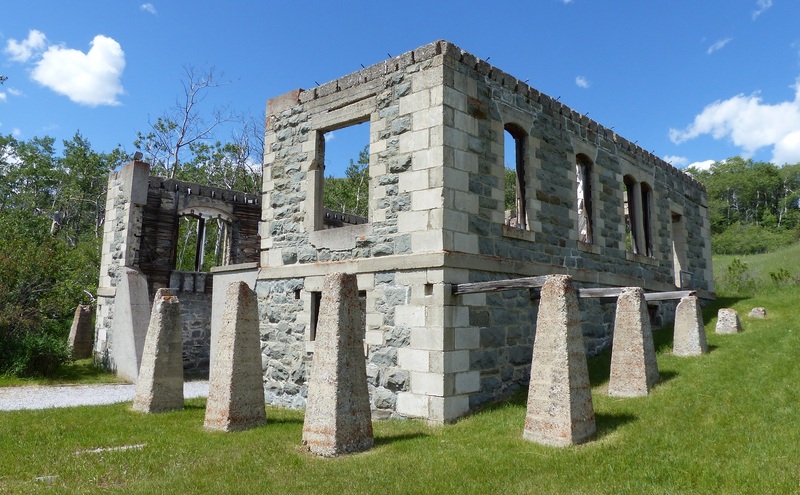 The ruins have been opened to the public with photos, stories and interpretive signs. During summer guides are available. The ruins have been cleaned out and some new timber beams installed where the original have rotted. From an outsiders point of view the site is once more over burdened with infrastructure. Overspending still goes on at this site. Note the huge new timber beams in the powerhouse. At the opposite end administration offices and ultra modern and clean rest rooms can only be used between May and September. The site is closed for the remainder of the year. 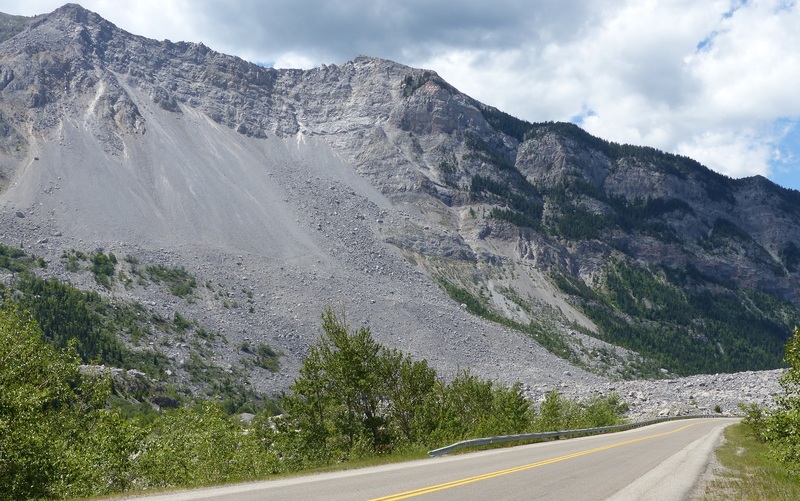 Not far from the site, still on the Crows Nest Pass we encountered the Frank Slide. 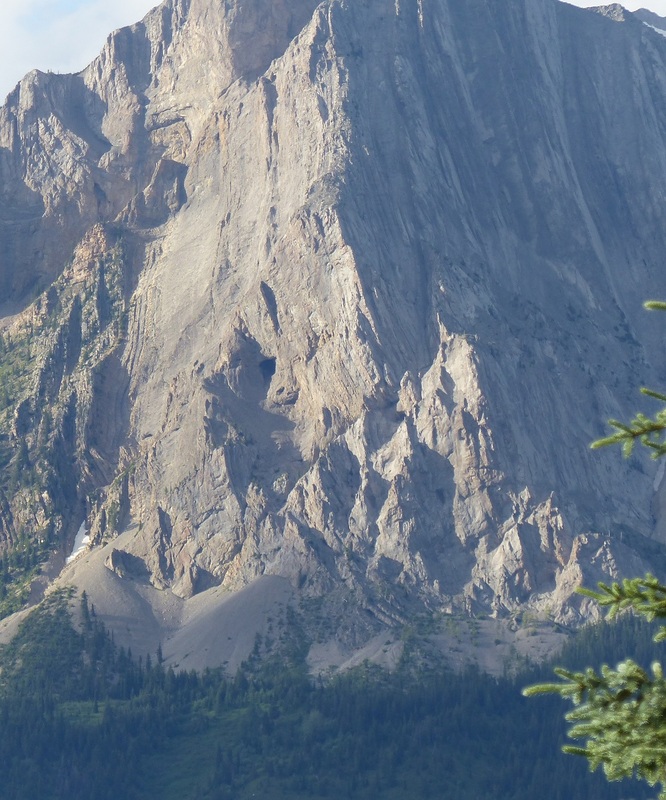 Early on the morning of 29th April 1903 nearby Turtle Mountain sent an 82 million ton of mostly limestone rock avalanche crashing onto the town of Frank. https://en.wikipedia.org/wiki/Frank_Slide Most of the town was buried under huge boulders, rubble and debris. Over 90 people perished and they and their homes are still buried under the rubble. Amazingly 17 miners trapped underground were able to dig themselves out of the buried mine only to find some or all of the families and or homes were gone. I was deeply moved by this location. 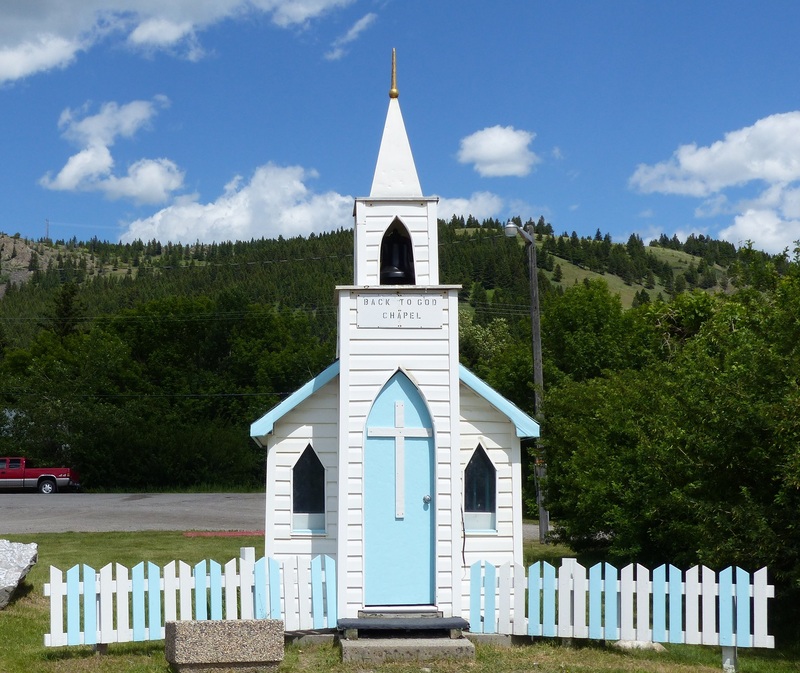 A little church with 6 pews near the Frank Slide. The railway and highway still pass through the area but now sit high upon the rubble instead of the original valley floor. 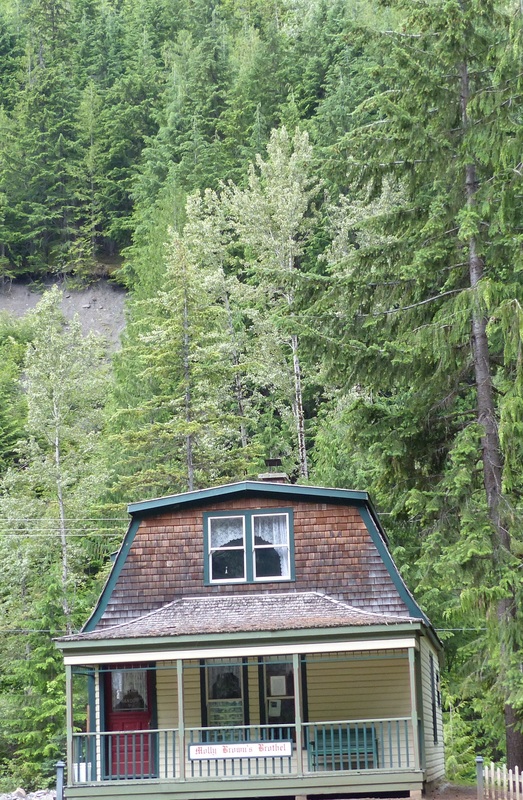 An Interpretive Centre and Museum has been built on the hill above the rubble where the last house size rock landed. 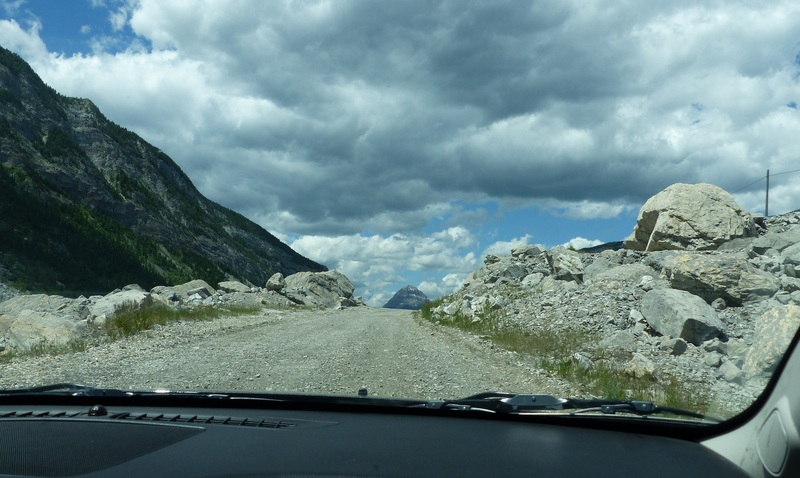 Interpretive drive through the Frank Slide. Nearby was a cemetery where a mass grave of 189 miners are buried. The Hillcrest Mine collapsed on June 19th 1914. https://en.wikipedia.org/wiki/Hillcrest_mine_disaster We were at the cemetery when a large group of people arrived with what we believe to be a single red rose for each of the buried miners. 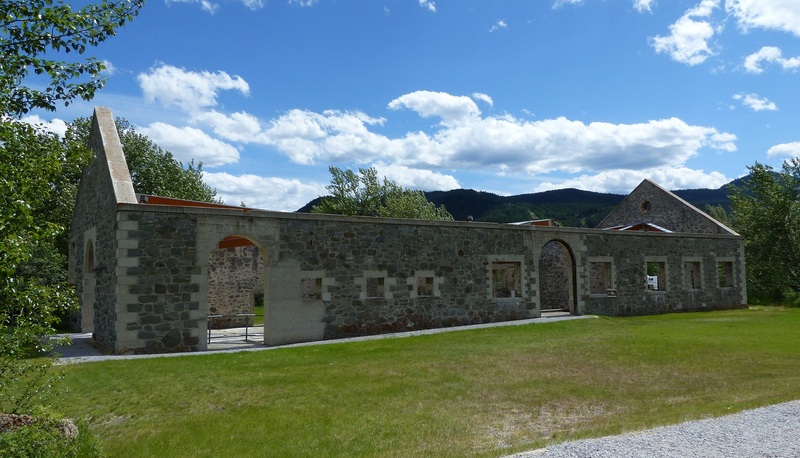 Again I was deeply moved by the site and the ceremony in the shadow of the Frank Slide. 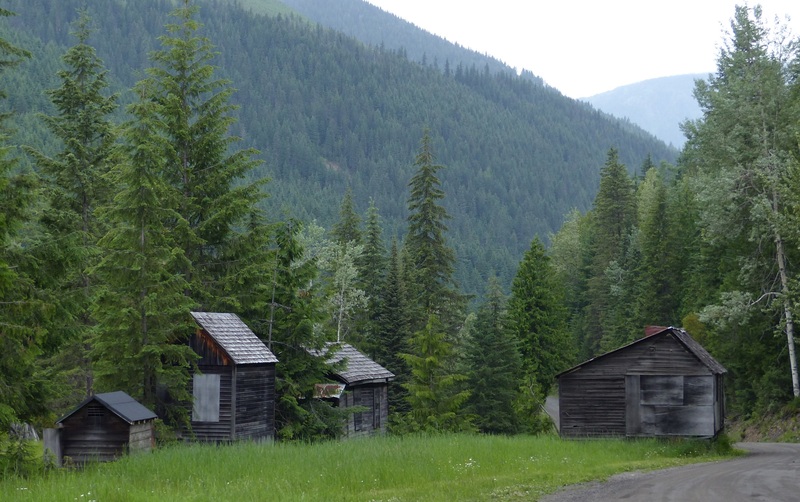 The Crows Nest Pass area is littered with history and old buildings and buried towns. It was time to move on from this sad location. 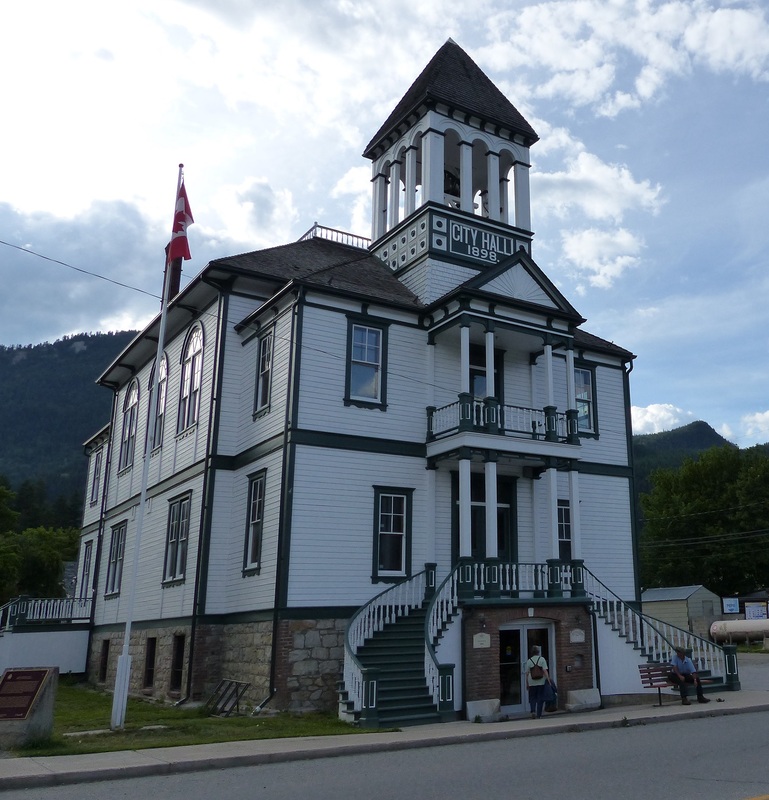 We stopped in the picturesque town of Fernie on the Elk River within the Rocky Mountains. 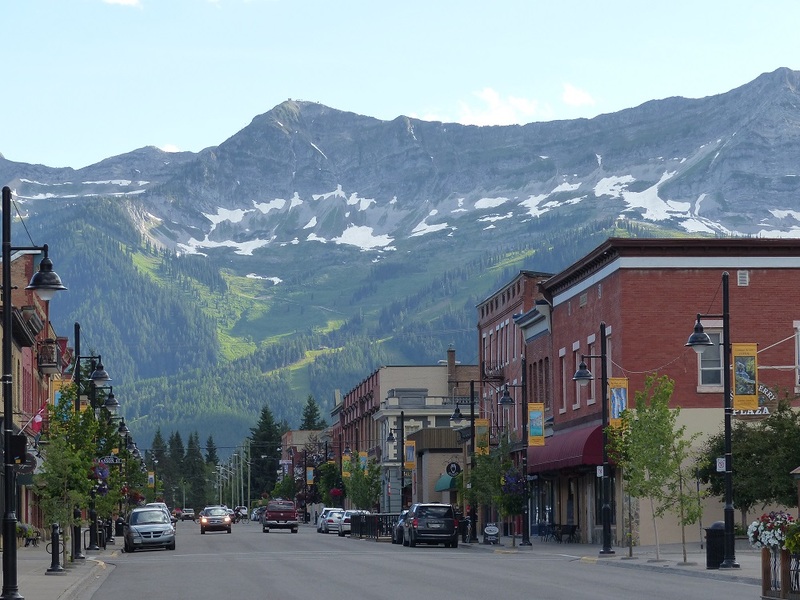 Main street the town of Fernie. 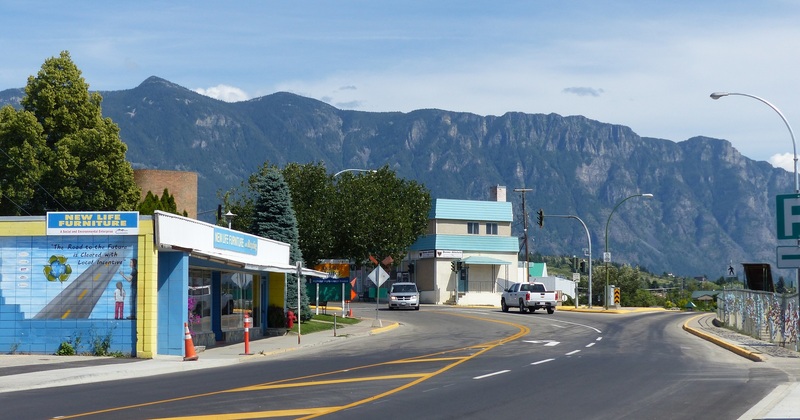 https://en.wikipedia.org/wiki/Fernie,_British_Columbia We booked into a Super 8 Motel. I must digress here. Super 8 has a chain of motels throughout Canada and the USA. This particular motel advertised a hot tub and free breakfast. The rooms were clean, the bed was comfortable the TV had all stations and they gave me a discount with my RACQ membership card. 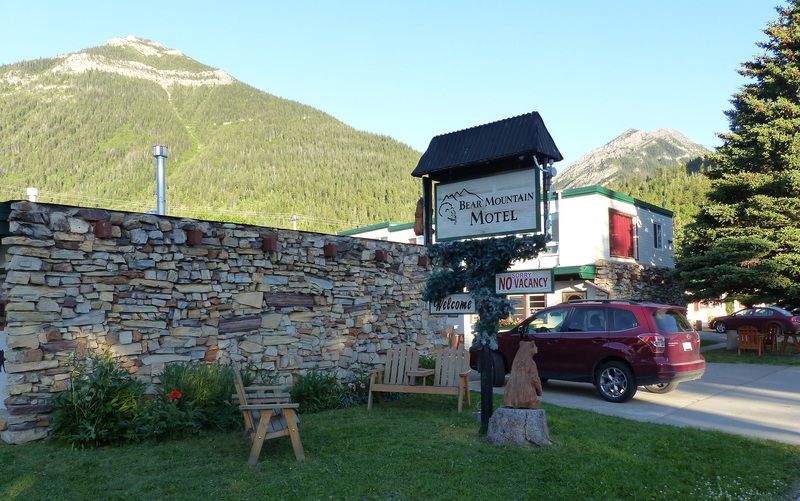 This is the best motel we have stayed in and Super 8 is on our list should we ever travel here again. In the motel lobby I saw a painting titled The Ghost Rider. 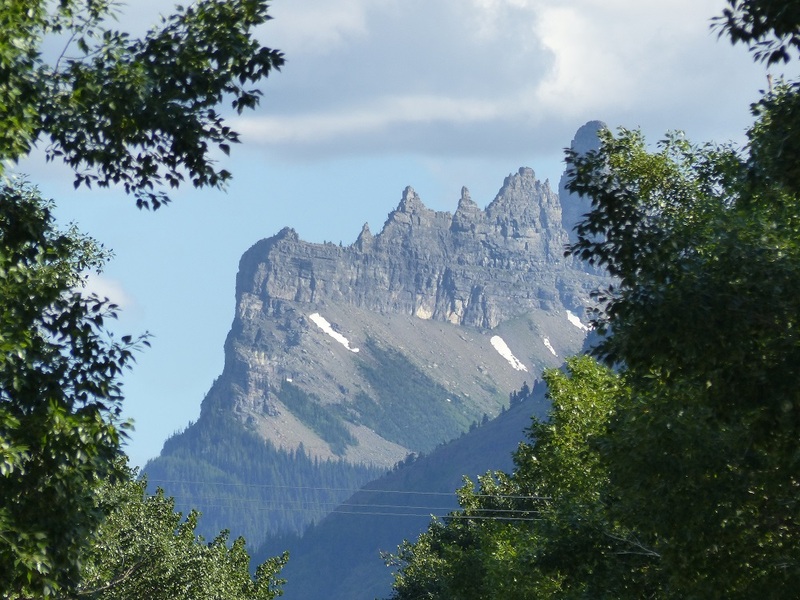 The clerk mentioned the painting was of a natural mountain feature seen from the town and is part of a legend. 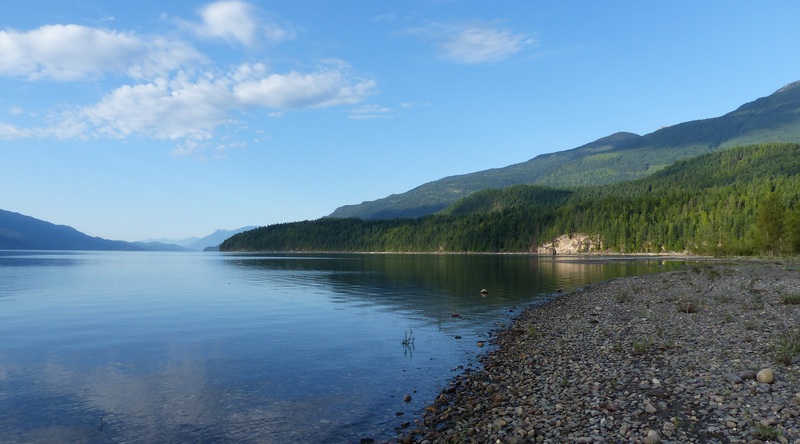 The legend goes that William Fernie noticed black stones on a necklace worn by the daughter of a local Indian chief. He recognised the stones as coal so asked the chief to guide him to where the stones could be found. The chief agreed on condition Fernie marry his daughter. Fernie agreed. 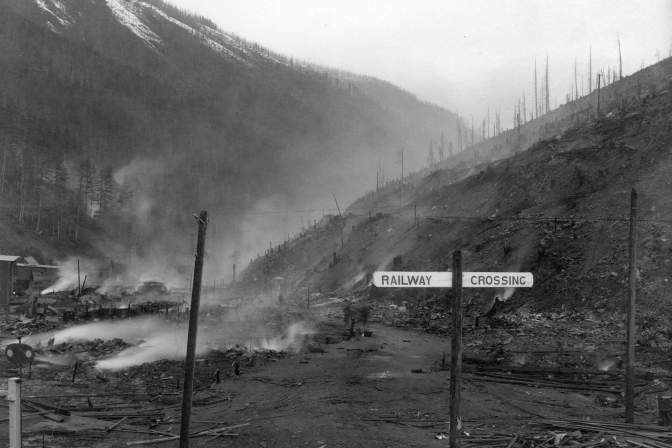 Once the coal was located, Fernie reneged on the agreement. The chief was naturally annoyed. 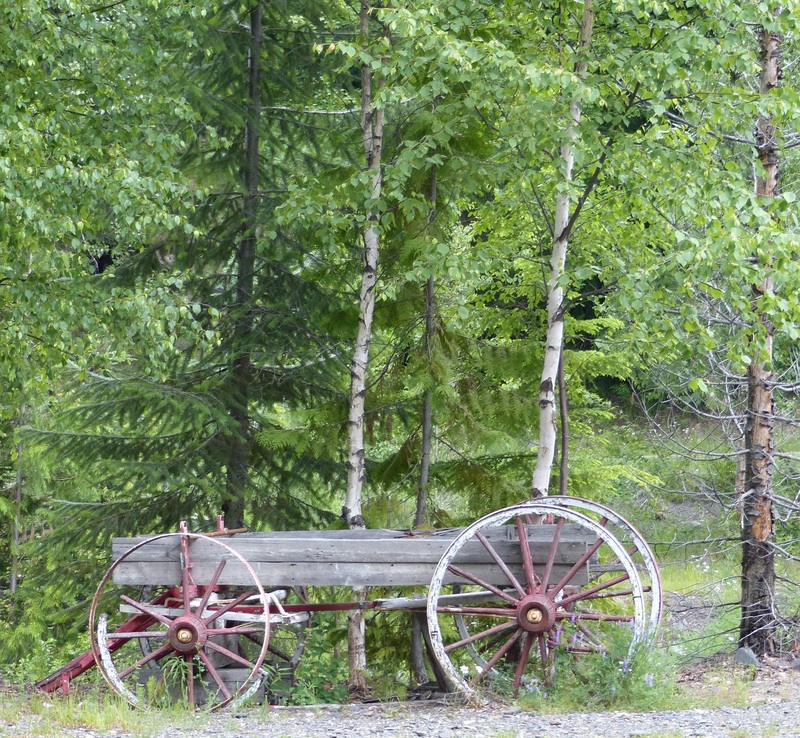 He placed a curse on Fernie, his descendants and the fledgling town. The curse was to include fire, flood and famine. Further, the chief and daughter would forever visit the town on summer evenings to remind everybody of the curse. Fires and floods have devastated the town and many residents believed the curse to be true. In 1964 town councillors and members of a local Indian tribe smoked the peace pipe to remove the curse. 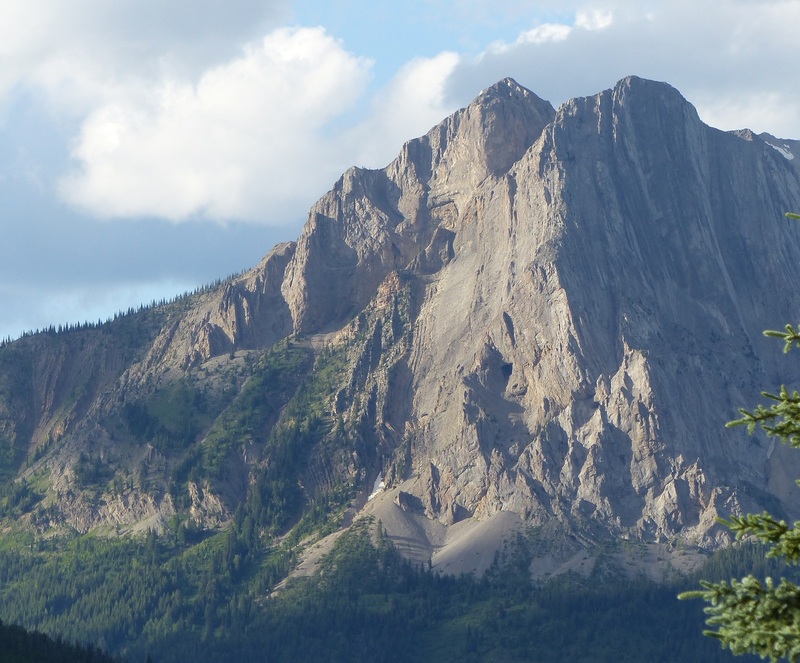 The chief and his daughter still appear on Mount Hosmer on summer evenings. The day was overcast but when I thought I would never see the ghost rider, the clouds parted and the suns rays fell on Mt Hosmer and I saw the chief and his daughter on the cliff face. Ghost Rider Indian Chief with his daughter walking beside the horse. The threatening rain did not dampen our spirit of adventure. We hit the highway about midday. We had been warned that Motorway, Freeways, Highways and Alberta and for that matter other Provinces, do not have many rest stops or petrol stations or fast food outlets such as we are used to in Australia. Shortly after the rain began we stopped at a small town called Nanton for lunch. I turned on the iPad to review our travel route and received a message to say I had used up all of my 1 Gb of data. WOT THE!!!??? We asked some locals if there was phone box in town. Donnis came to my rescue. Oh they said. No we do not have a pay phone in this town of 2,132 people. Oh! OK! Is there a Telus office in town? Nope. Gotta go to a bigger town. 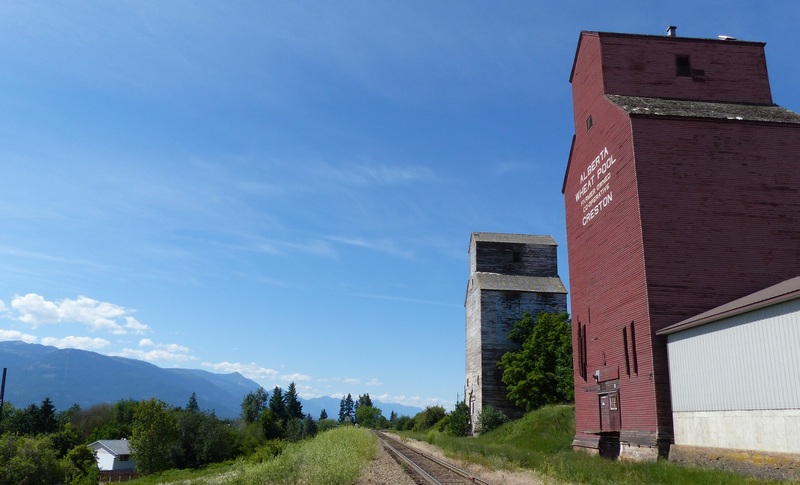 Next town was Claresholm with a population bordering on 3,758 give or take a few people. Yes there was a Telus office in town and it took all of two minutes to solve the problem. You have only used 22Mb of your 1,000 Mb of data. The Ipad was restarted and viola our data was restored and saved me getting annoyed. There are 8 wind farms with a total 0f 272 wind turbines already installed. A further 5 farms with another 180 turbines are planned. 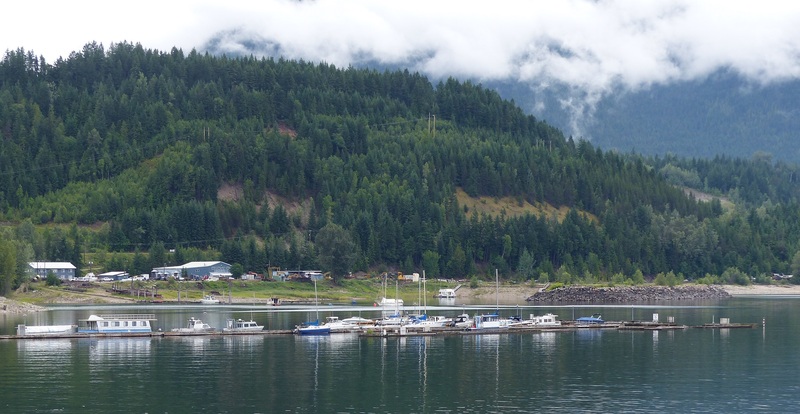 The area receives an almost constant wind, the Chinook , which roars down from the Rocky Mountains. Just a few of around 280 Wind Turbines in the Pincher Creek Valley. 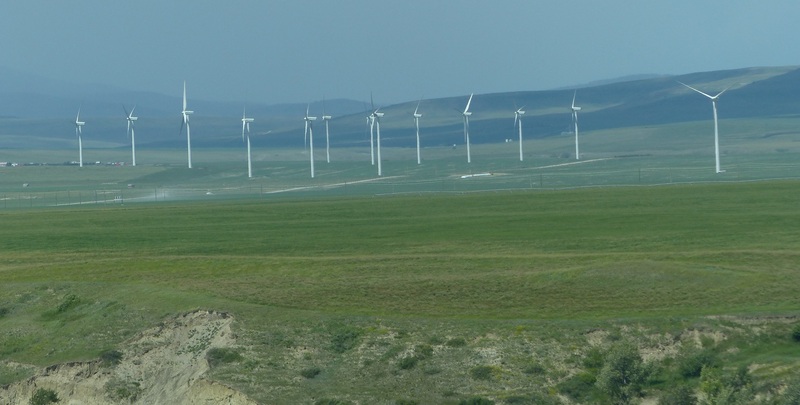 Pincher Creek turbines powered by Chinook winds. The rain and cloud was giving way to blue skies. Yahoo! 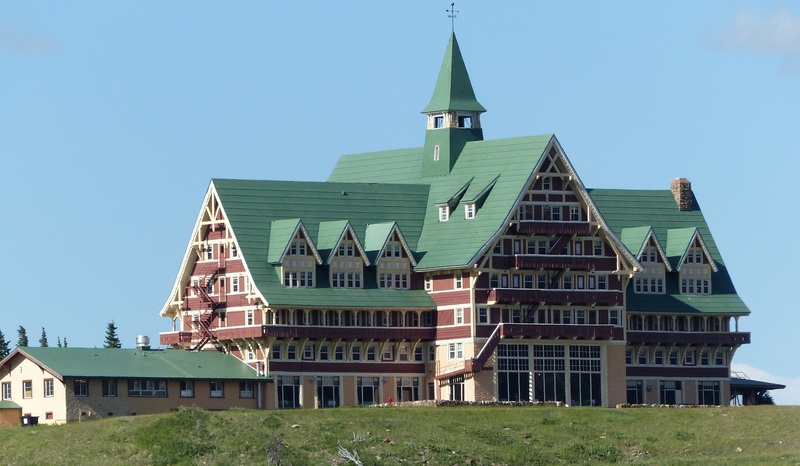 On the approach to town the Prince of Wales Hotel sits on a high knoll of land overlooking the lake and the town. https://en.wikipedia.org/wiki/Prince_of_Wales_Hotel the hotel looks as majestic now as it did when built in 1926. Prince of Wales Hotel on a knoll overlooking the lake and town. 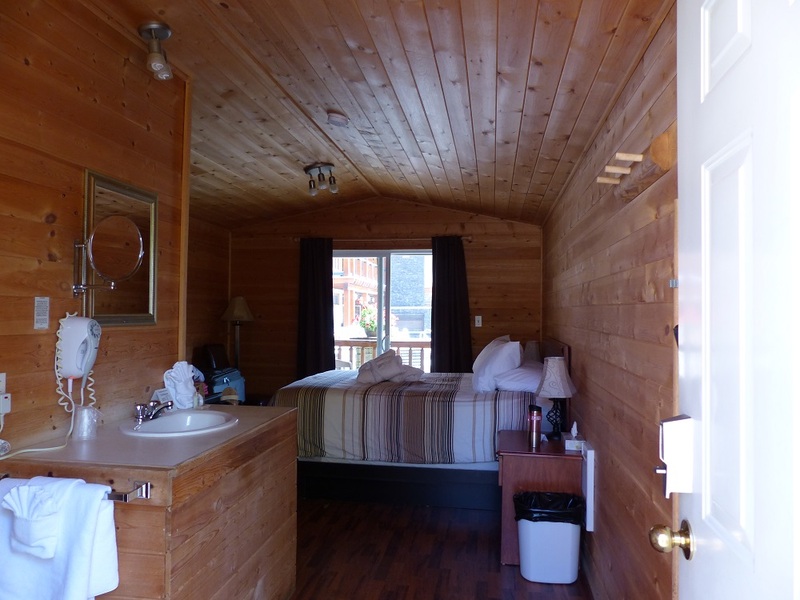 We booked into the Bear Mountain Motel which advertises small rooms (with tiny shower recesses). There was enough room for our two suitcases. http://bearmountainmotel.com/ No air con, no fans and only windows on the front. Air does not flow through the units. There was a drip coffee machine but no kettle or fridge, no milk or cream not even powdered coffee whitener. The TV had 3 channels but at least we had a room for the night. This is the beginning of the summer peak season and from this weekend on until September will be summer holidays. All around town and in motel rooms you are reminded this is bear and cougar country. 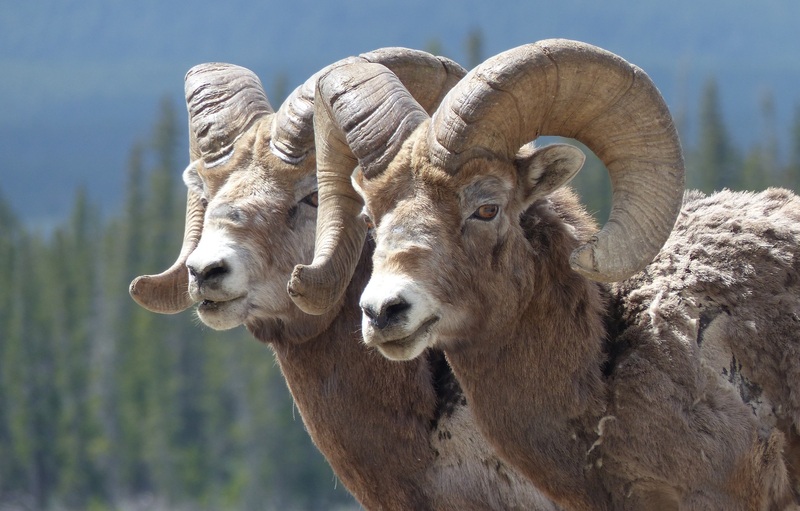 There are tips on how to avoid unpleasant meetings especially for those brave enough to hike the thousands of trails in the park. Encouragingly, recent in town sightings are advised. Nice to know bears and cougars also come into town for a visit. 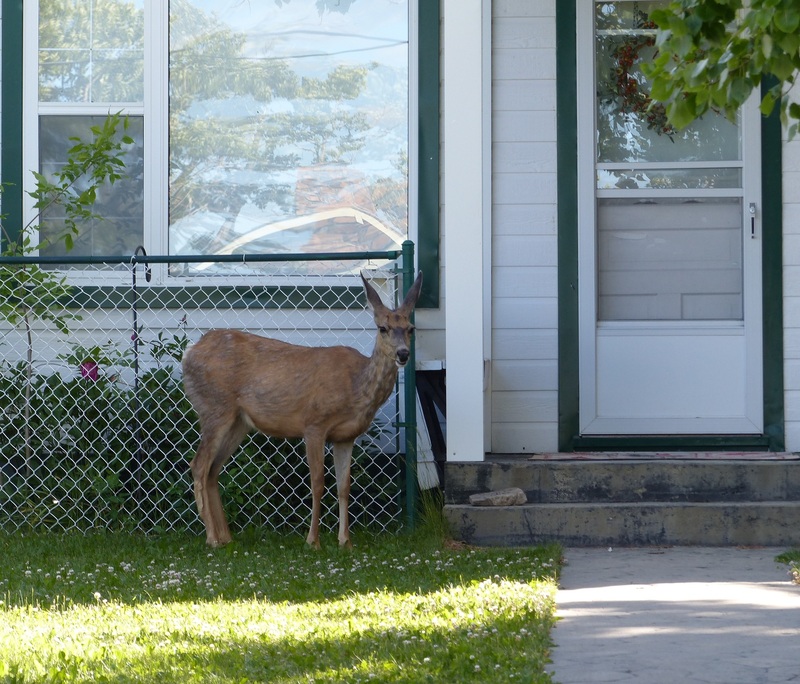 Deer also wander into town (Yes Elk and Moose too) and if you have not yet put a screen around your flower beds, they will feast on your plants. 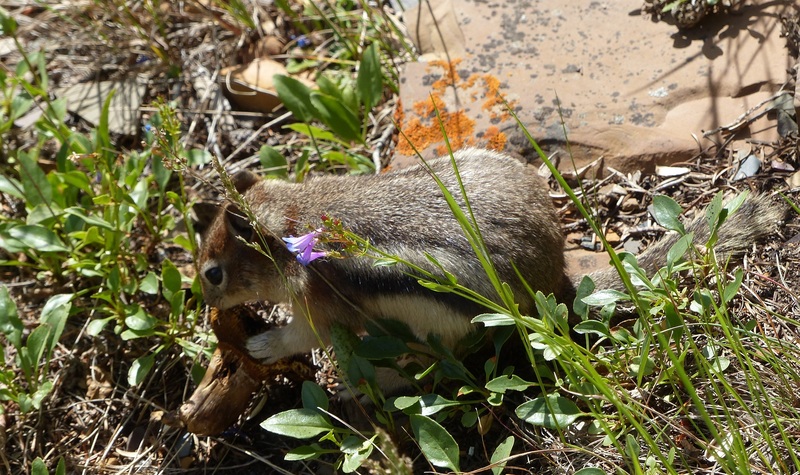 A flower eating deer looking for dinner in the front yard of a local house. 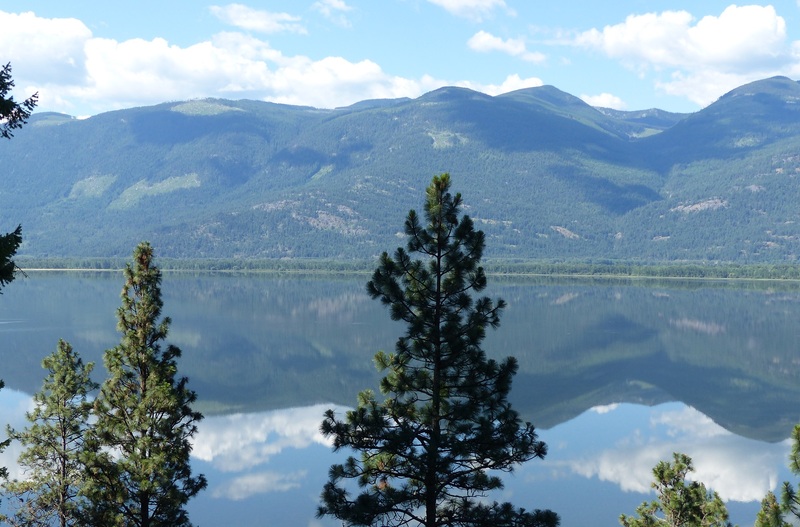 The views of the lake with surrounding snow tipped mountains are what postcards are made of. 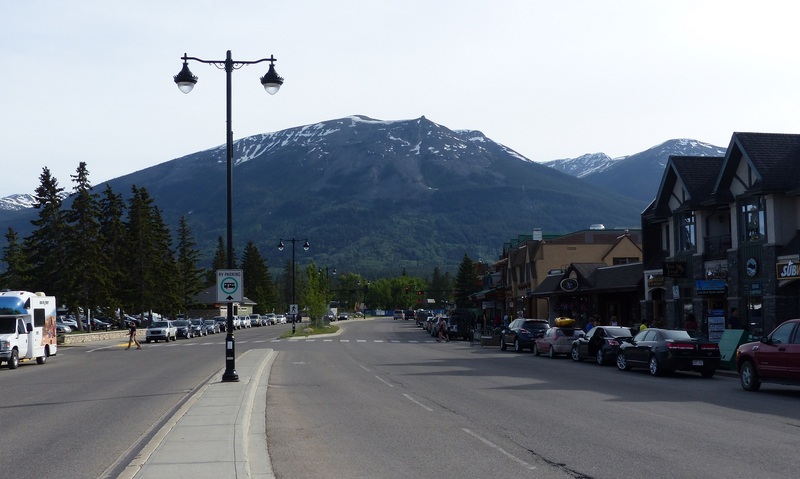 View along Waterton main street. Cameron Creek with The Bears Hump in the background. 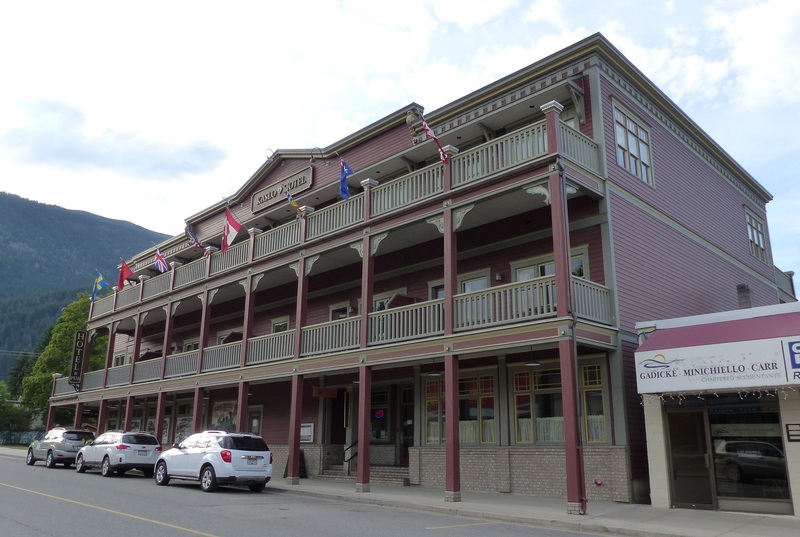 Prince of Wales Hotel from the town of Warterton. 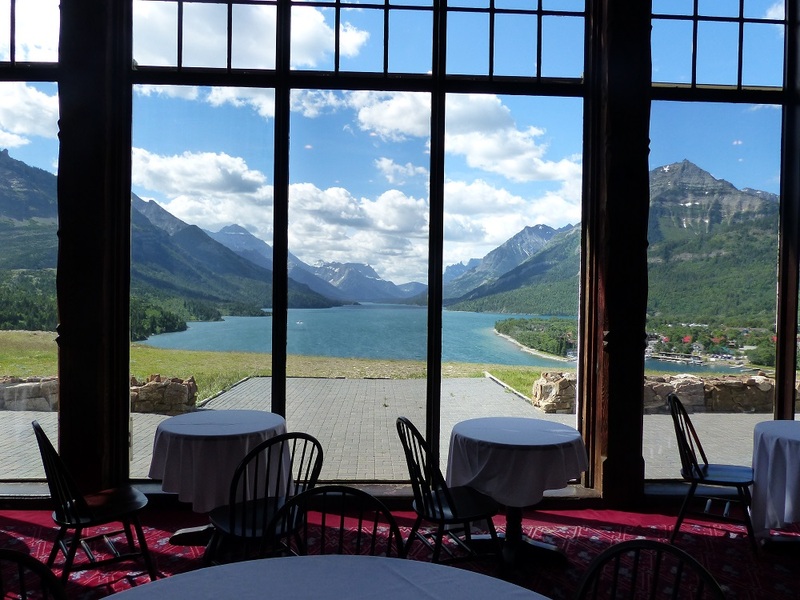 View from Waterton across the lake to the US side. We took a walk along the foreshore and visited Camerons Falls where we met a nation of Squirrels running and jumping in impossible places and begging for food. The POW Hotel almost dominates the town, overshadowed as it is by those mountains all around. The lake is bordered on the southern side by the USA. 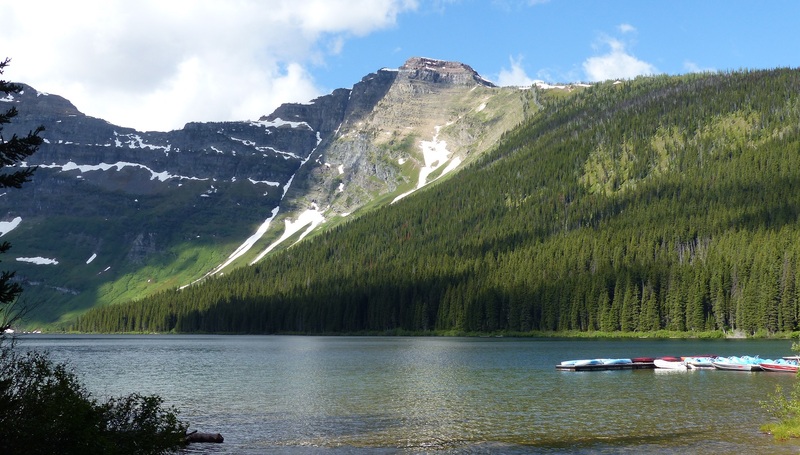 The area was declared a National Park in 1895 as was the Glacier National Park in neighbouring Montana USA. 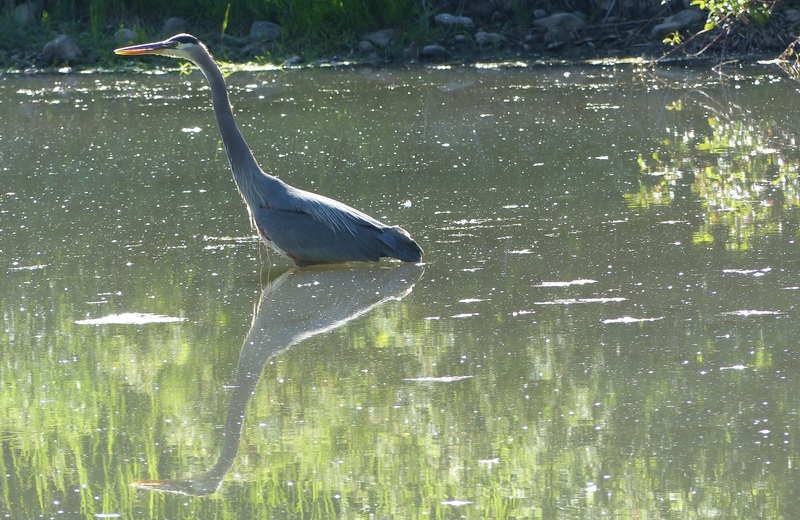 Both parks share the lake. 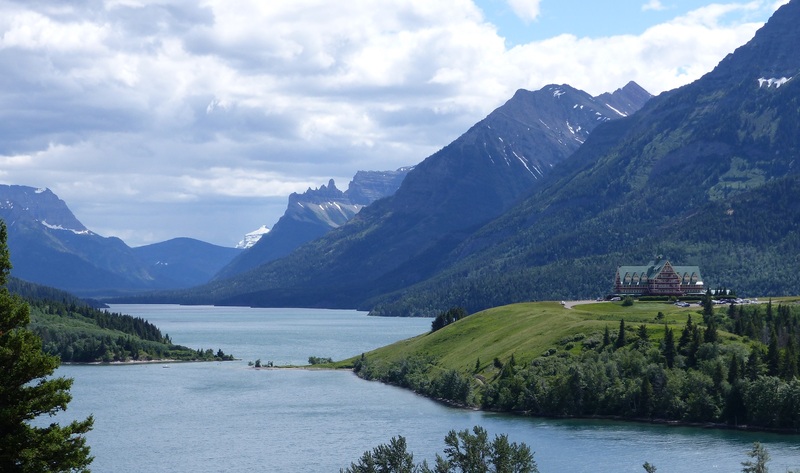 In 1932 both parks were declared the Waterton- Glacier International Peace Park. Monuments on both sides of the border were established. A tourist boat plies the lake from Canada to the US side giving an historical running commentary along with coffee and cookies. The cruise vessel “INTERNATIONAL” with Prince of Wales Hotel. Guests are allowed ashore on the US side as there are no roads into the US side. 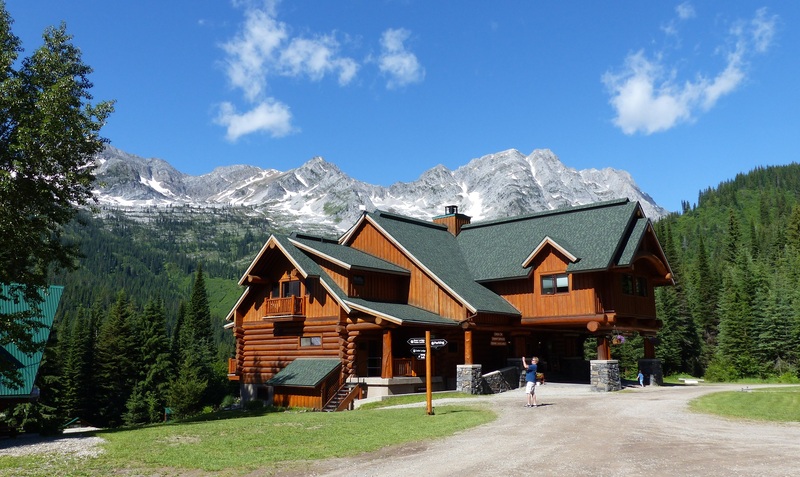 Visitors cannot proceed past the Ranger Station unless they bring a passport and are intending to hike the Glacier Park. Once the season proper gets underway everything will be booked up weeks in advance. 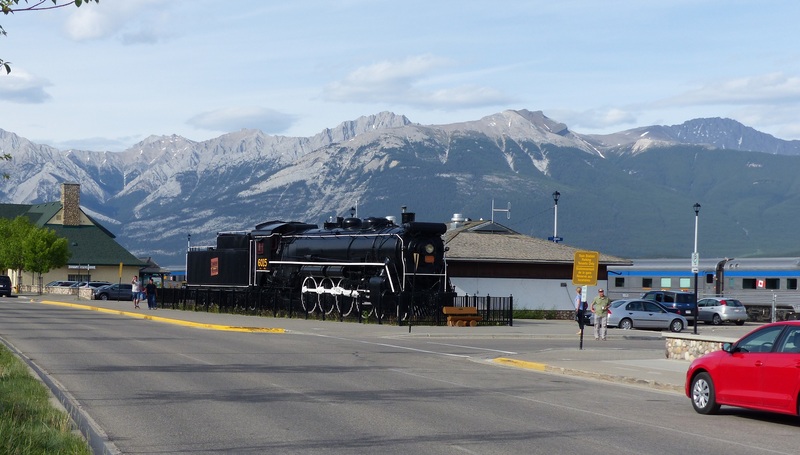 A walk around town reveals what we had noticed in the Rockies further north between Banff and Jasper. Local shops and eating houses are hiring. Low paid jobs usually taken on by Uni students during summer break. After a pizza and a beer at Pearls Cafe Pizza to Go one of the many eateries in town we settled down for the night to watch old black & white movies on the TV. The weather forecast was for a fine sunny day with a top temp of 17° which was certainly more encouraging than the 1° overnight temp of the location we went to today. No, let me start that again. No? Me neither! Well that is not entirely true. 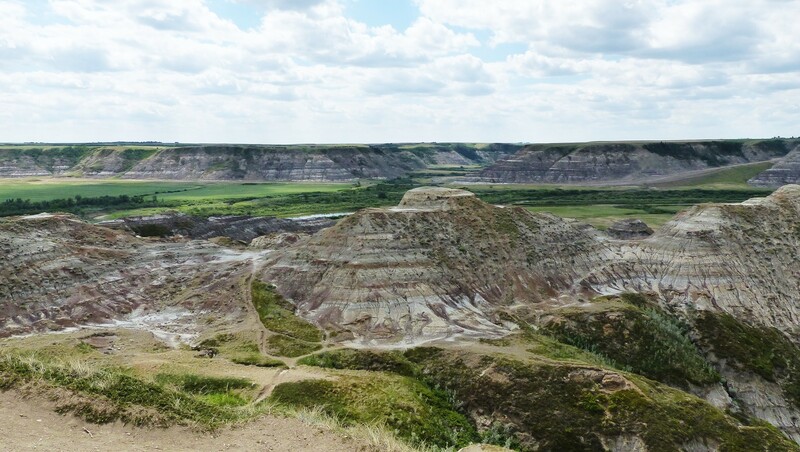 Donnis had told me that in her youth she had visited Drumheller and remembered it as a place where she saw dinosaur bones. Apart from that vague memory there was nothing more she could recall about the town. She wanted to pay a return visit. 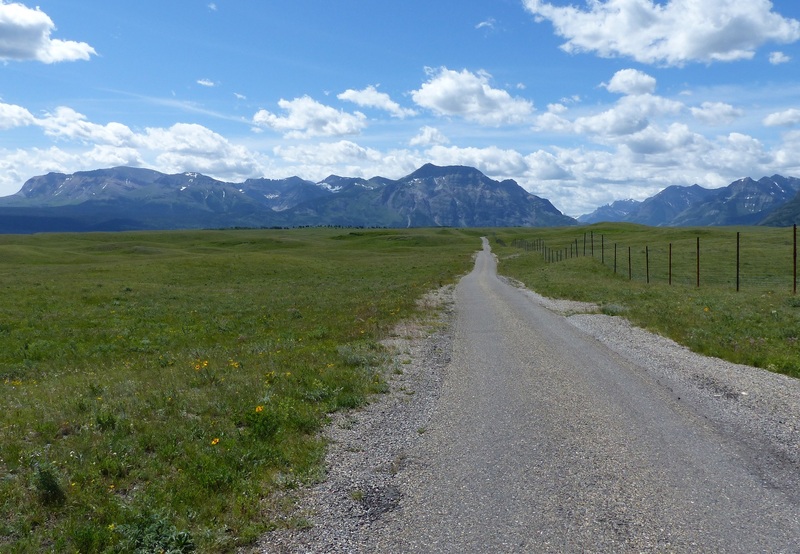 Alberta is a Province known to be flat and often featureless. 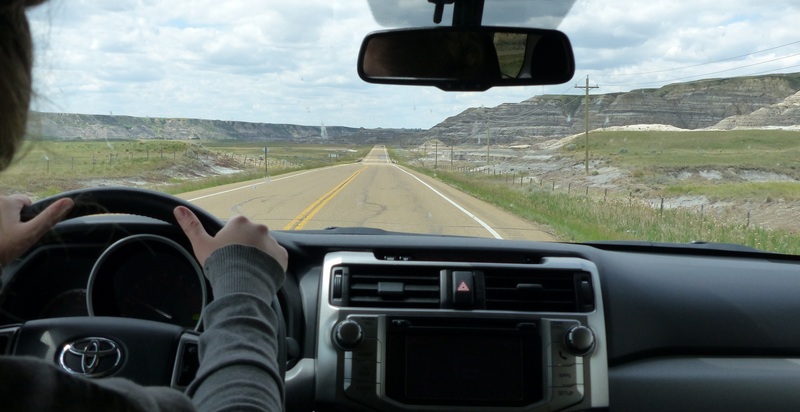 In our drive that was the case but suddenly we found ourselves on a steep downhill section of road and the landscape we entered are unmistakable, badlands. Basically the land is made of soft rock and wind, rain and animals create erosion. 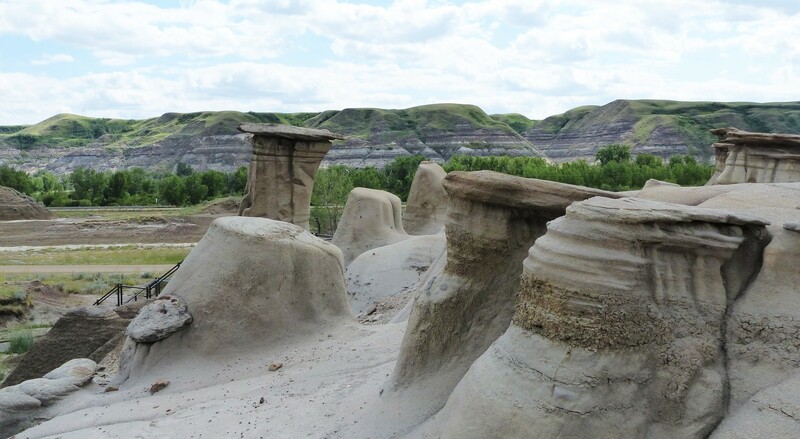 Then too does the Red Deer River which winds its way through the area create erosion. First visit was the tourist information centre for a map and advice on places to see, a sort of top ten list. It was here we saw the worlds biggest dinosaur. This must be the biggest “big thing” anywhere. Can you believe there is a viewing platform inside the head? It is 25 metres tall and cost over CAN$1 million to build. This is by far the biggest anything I have ever seen. It certainly makes the big banana, big pineapple and big prawn in Australia look like youngsters by comparison. 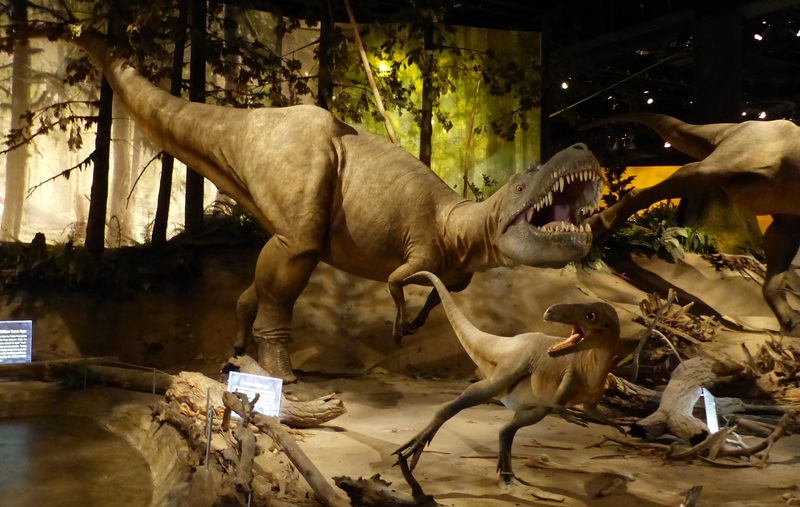 This is a magnificent building with displays of dinosaur bones and other fossils on display. Dinosaur outside the entrance to Royal Tyrell Museum. 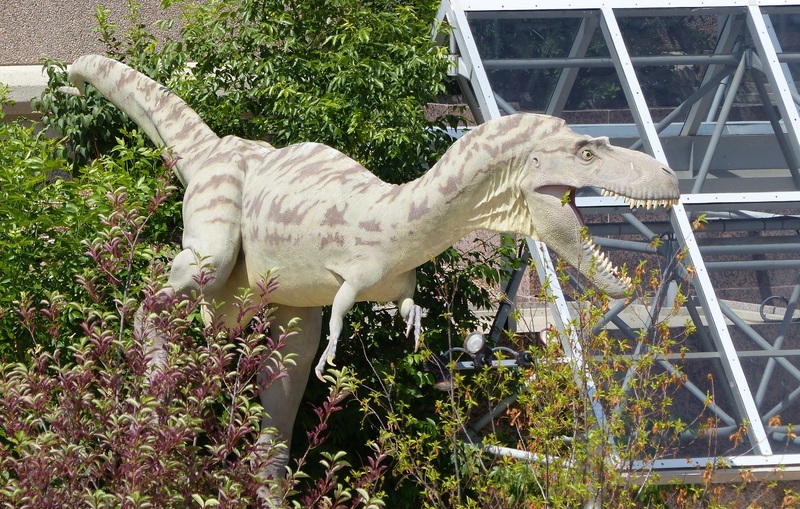 Plaster and vinyl and plastic image of what a dinosaur may have looked like. 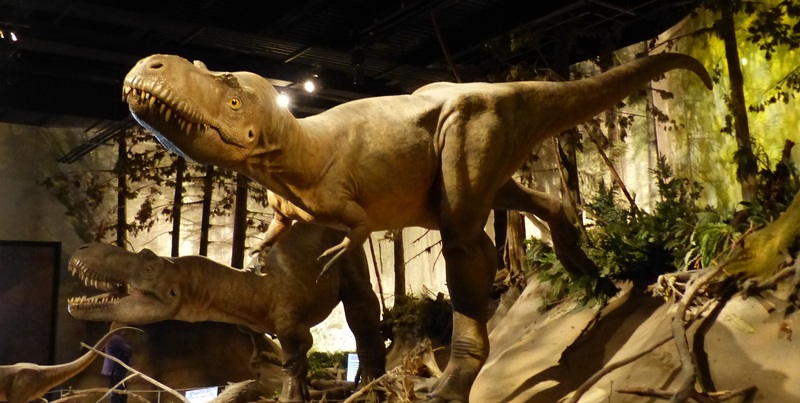 Other Exhibits included full or partial actual bones of extinct dinosaurs. 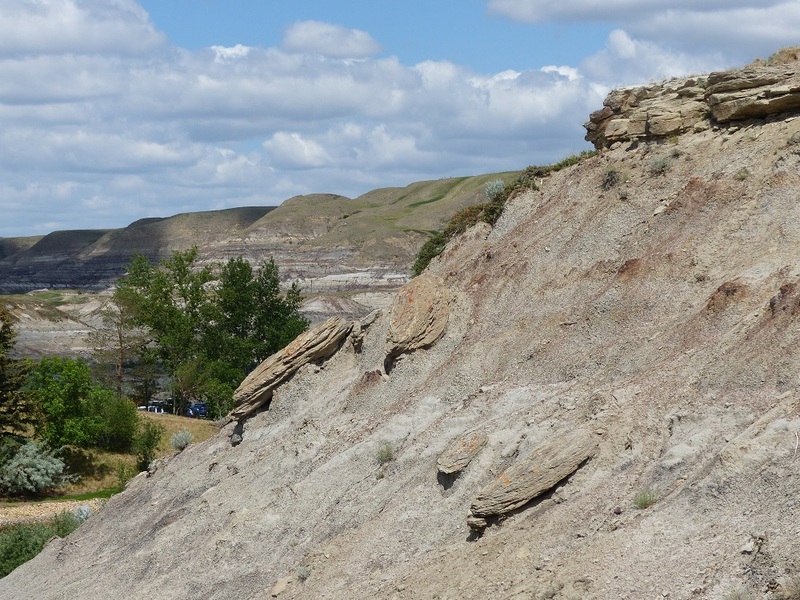 Much of the displays are of material pulled from the surrounding badlands. 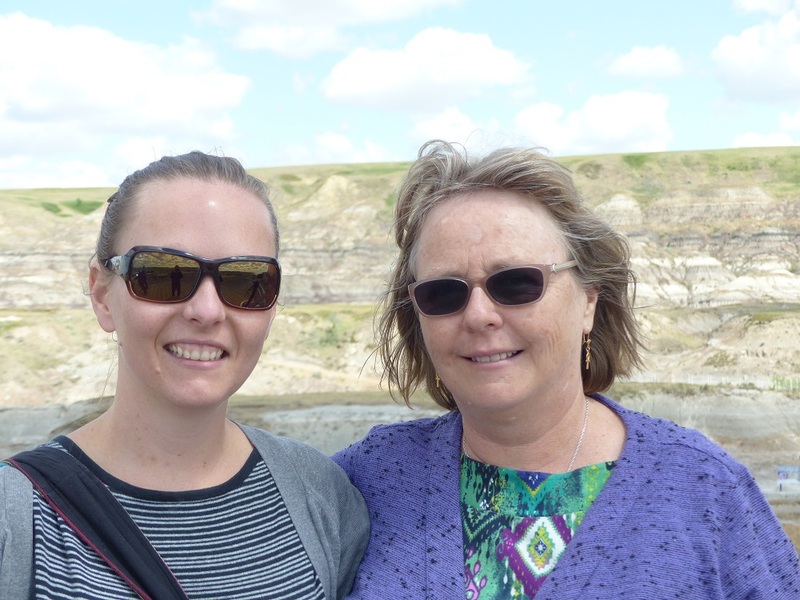 Alecia and Donnis at the Drumheller Badlands. Pretty impressive. On arrival in the carpark we were met by the official welcoming crew…thousands of Prairie Dogs skipping running, leaping, chasing each other and running up to tourists. 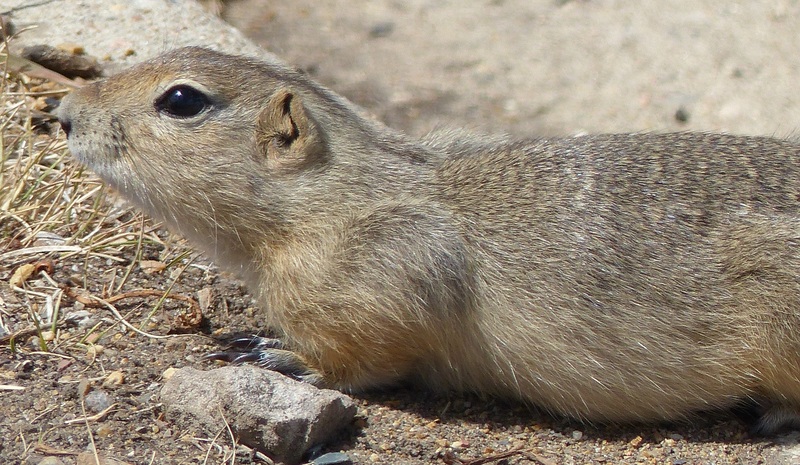 https://en.wikipedia.org/wiki/Prairie_dog These cute, fearless little creatures are everywhere and I can imagine how they would be a nuisance. However they are protected and everybody just has to put up with their incessant burrowing. These cute creatures are everywhere and fast breeders to boot. Their burrows are everywhere including under staircases and building foundations. 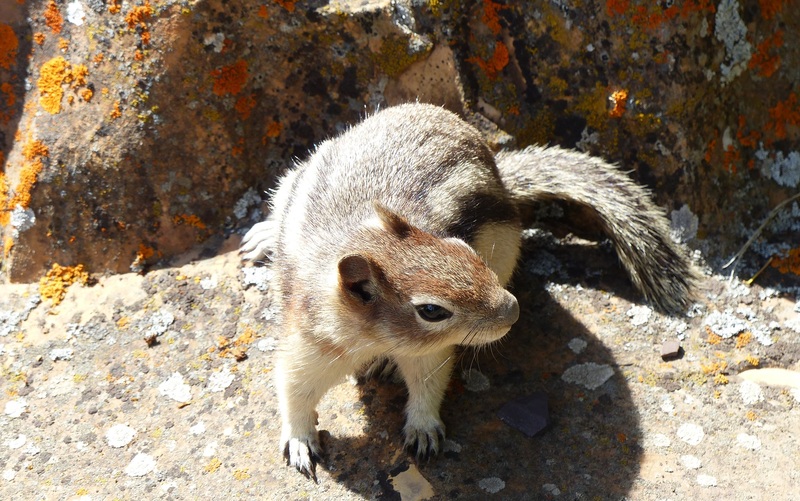 Cute and catchable Prairie Dogs at Drumheller. 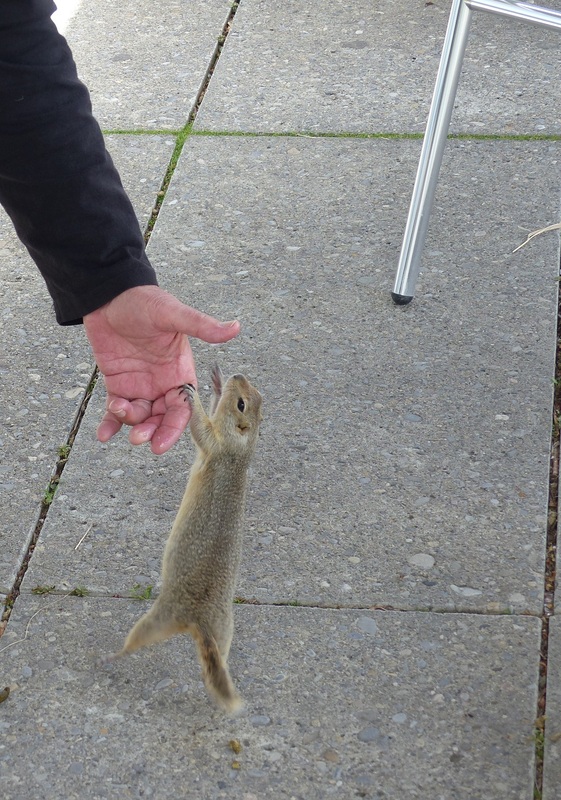 The sign said “Do not feed the wildlife”. I pretended to offer food and he chomped on my fingers. After wandering through the museum, yes there is an entry fee, we watched a movie about how the badlands came to be and how oil was created. By the way, Alberta is also well known for its oil. Oil pumping stations and pipelines can be seen almost anywhere as you drive along the highway. All around the countryside and within Drumheller are these private oil derricks. 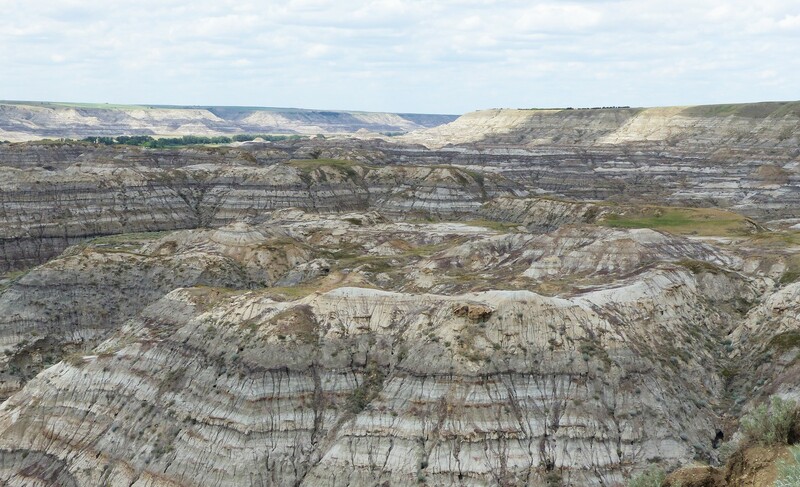 Number two must see was Horse Thief Canyon which shows the badlands stretching on for vast distances looking like a smaller version of the Grand Canyon. 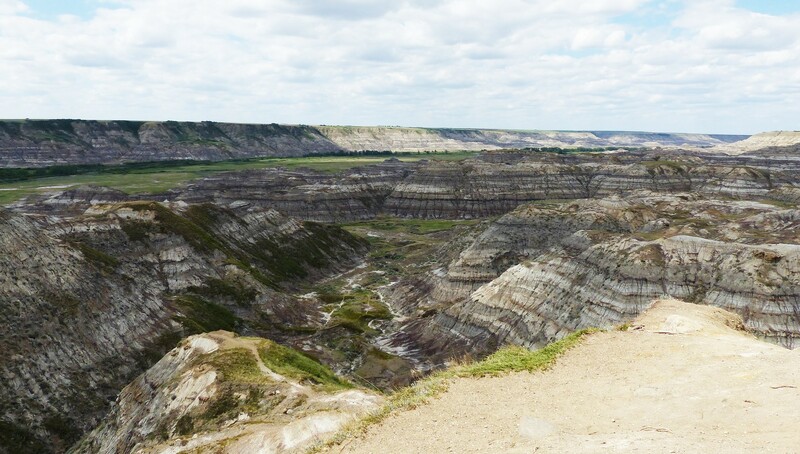 From Horse Thief Canyon. It is understandable how it would be difficult to find missing horses and the thieves in this type of terrain. Respect must go to the thieves for being able to navigate their way in and out of here…without detection. The canyon is a popular hiking location although you would need to be a skilled map reader to know where you were. I tried to imagine standing on top of the bluff, overlooking the multitude of canyons with snow all around. It must be, umm err, awesome! The story of how the canyon got its name was way back in the settler years when branded horses roamed the area. Some disappeared only to re-appear in another county with a different brand. 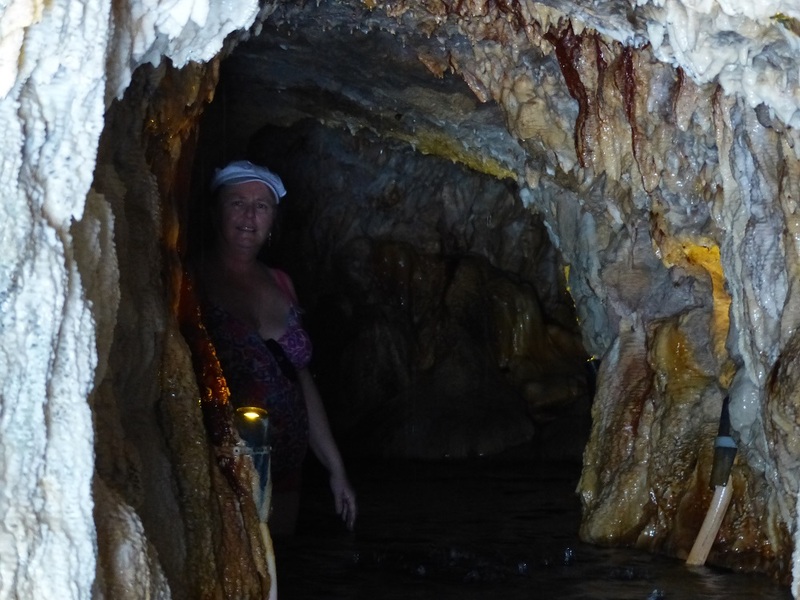 It seems the thousands of canyons, gulches and even caves was a nightmare to navigate. Horse thieves knew the area better than anybody else. 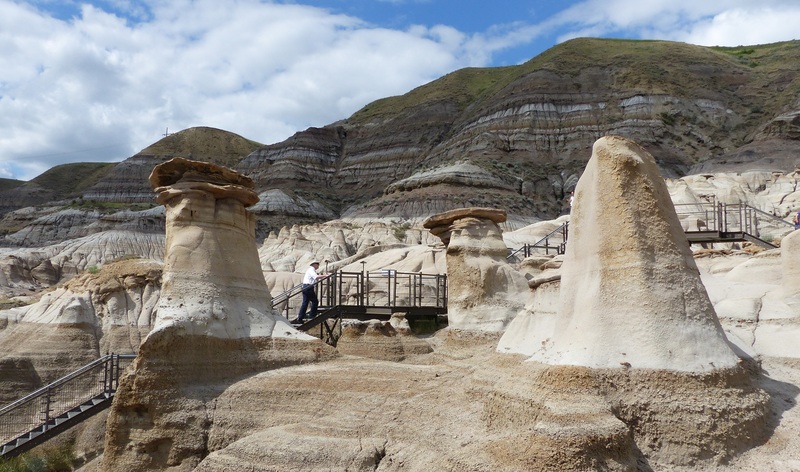 The final location was the HooDoos http://www.canadiannaturephotographer.com/KenBell.html an area of greater erosion than elsewhere. The erosion here created weird shapes. Just like the 12 Apostles on the Great Ocean Road in Australia, the erosion is destroying the features while at the same time creating new features. We saw photos taken ten years ago and could identify some of the features with the present day. Others are missing but new features can be seen. 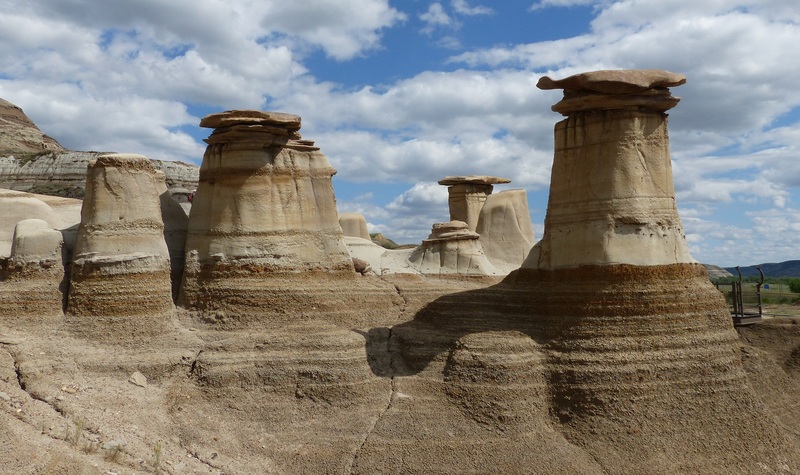 The HooDoos are part of the badlands but for reasons of location, wind exposure, rain and other erosion causing agents the land here is sculpted into strange formations. We then had the 90 minute drive back to Calgary to collect Tyler from the railway station. Today was a sort of lay day as we had not planned anything. The sun was shining and too nice to be indoors. Soooo. We did what we should have done a month ago. We bought a Pre Paid Telus data card for the iPad. This will give us a measure of freedom in that we can use it as a GPS, we can send and receive emails, Facebook for Donnis, Skype to Skype and Skype to phone and finding places to stay and eat. Our plan is to hire a car and head to the south of the province to a remote National Park on the USA border. We will visit this area which according to the travel brochures is more spectacular than the Rockies. We do not know anybody who has taken this route before so it should prove interesting. From there we will shadow the US border all the way to Vancouver via mountain passes. 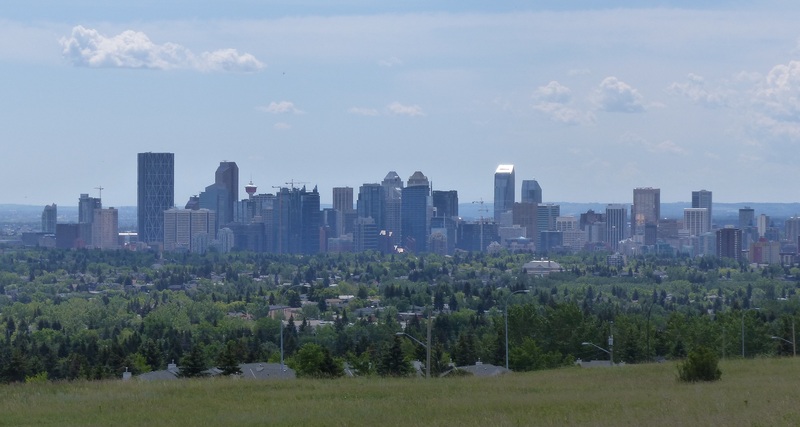 With a rare fine day we went to Nose Hill Park to photograph the Calgary cityscape. 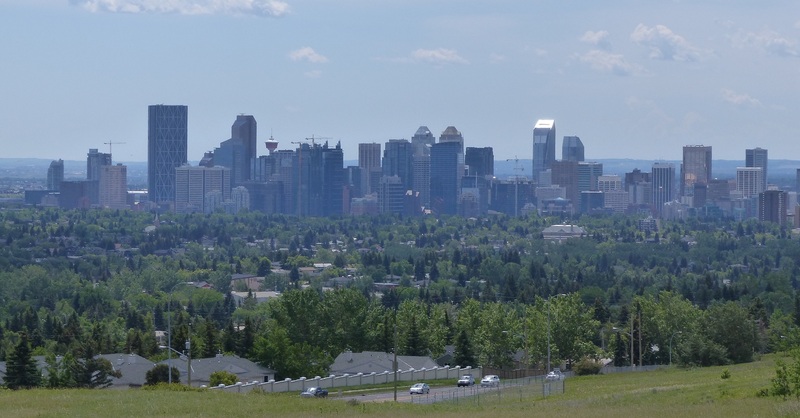 City of Calgary rising out of the plains as seen from the vast Nosehill Park. While standing in the park we saw minute movement a long way in the distance against the skyline. The camera was used to zoom in and we saw it was a Deer. When on 48 times zoom the deer can be seen quite clearly. 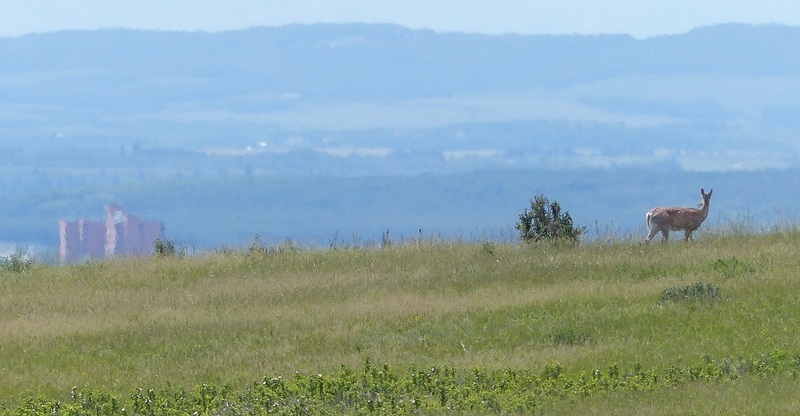 A deer grazes in the distance on Nosehill Park. Late in the afternoon a thunderstorm rolled in. Woke to a gray overcast day. Days like this in Calgary can be depressing. So too was the news from Oz. Queensland were beaten 26 -18 by New South Wales in game 2 of the State of Origin. Hmmm! That should set the stage for the final game in Queensland in three weeks. I will share a little with you. Today we accompanied Alecia on a shopping excursion. She needed venetian blinds so went to Home Depot. Just walking into this store was sort of like walking into a Bunnings or a Masters in Australia only it has double sets of doors to keep out the rain the snow and the cold. Tomorrow begins a new adventure. I expect there will be lots of places visited, lots of information, so will post daily for the next 10 days or so…as and when I have access to a PC or laptop to download photos from the camera. Today was spent visiting school friends who Donnis has kept in touch with. One visit we had dinner at the famous West Edmonton Mall. https://en.wikipedia.org/wiki/West_Edmonton_Mall After dinner we took a walk through the centre. Given that it was near 9pm closing time, a Monday night and still a cool time of year, the mall was not overrun with shoppers. 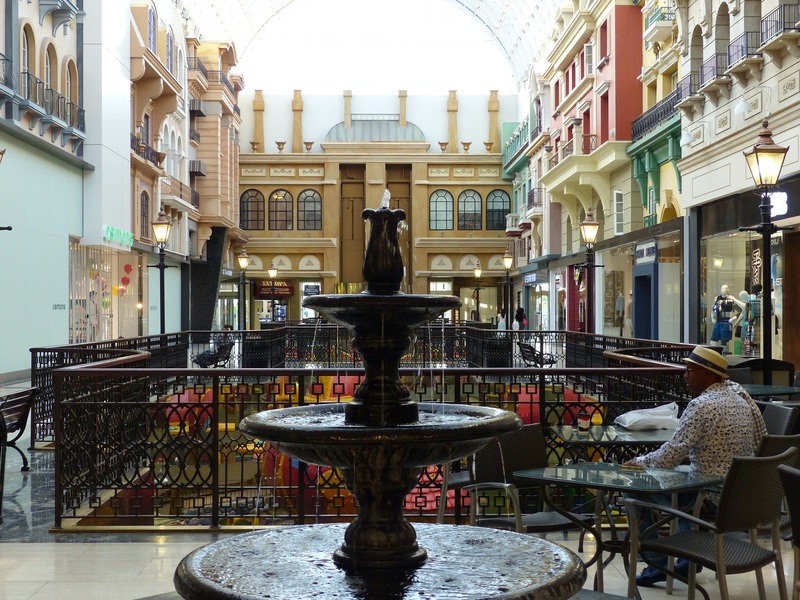 One wing of the mall is designed to look like a Neapolitan street… complete with coffee shops and yes even a couple of men playing chess or checkers. 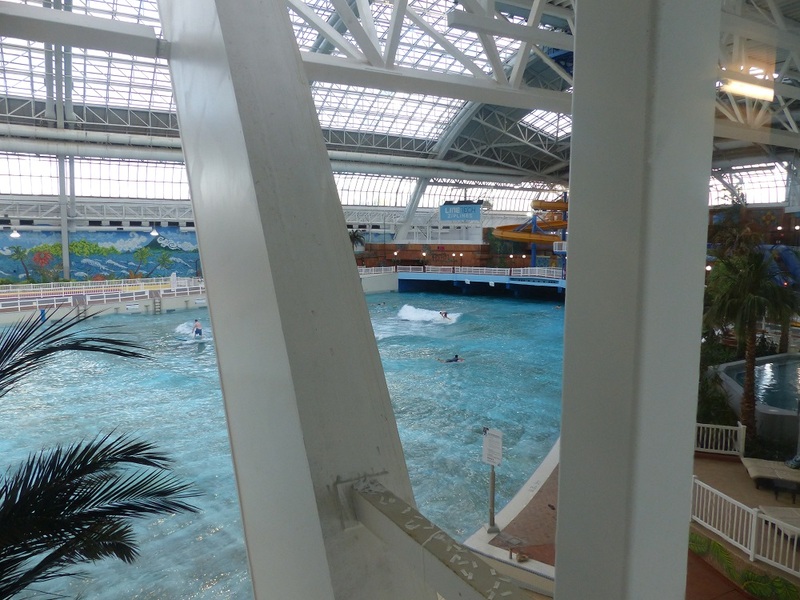 Wave pool at the mall. Entry fee, just as a spectator is $30. 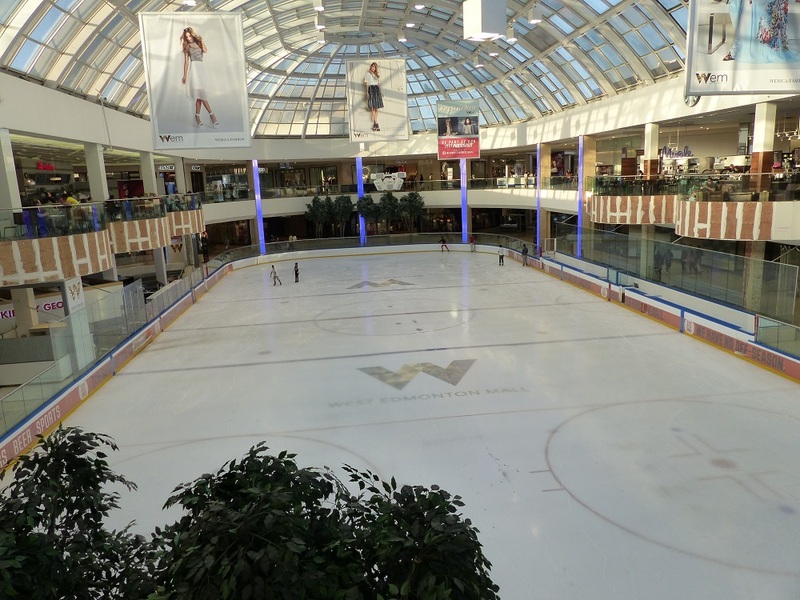 Skating Rink at the mall. 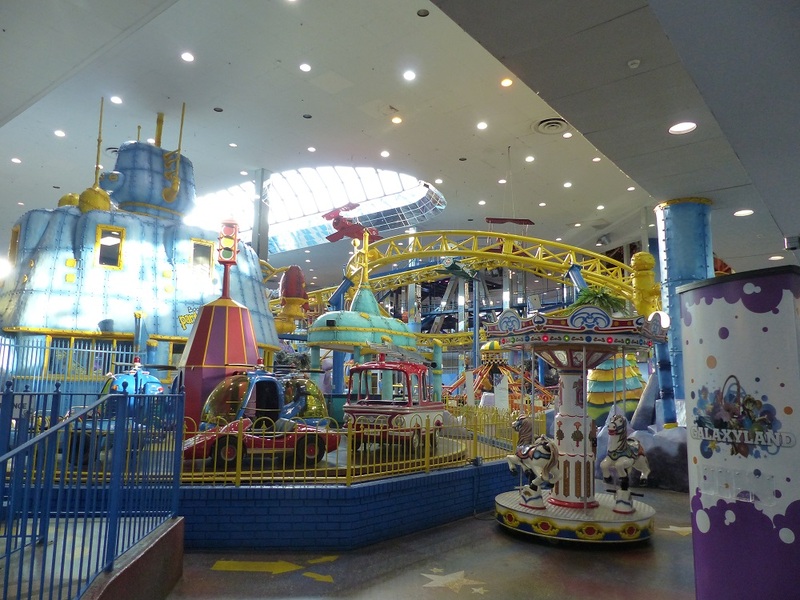 Galaxy World inside West Edmonton Mall. It is compact but none the less exciting for children. 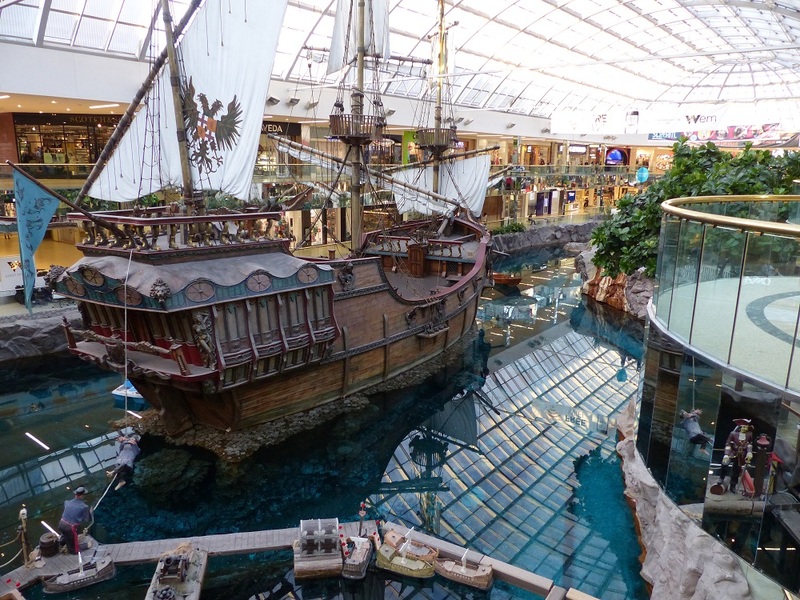 A pirate ship on an lake inside the mall. the water is so clear it looks almost empty. Each tile on the bottom is seen clearly. I understand that until recently dolphins swam in the lake. before we left. It is an amazing place. On another day I would like to try the Waterpark. While wandering we saw a group of four Hutterites also wandering. 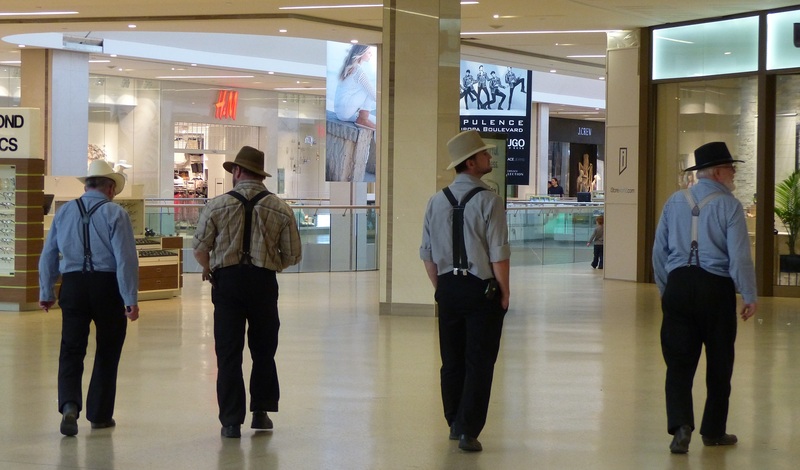 A group of Hutterite men at the Wset Edmonton Mall. It was probably their first visit as it was mine. I understand Hutterites normally do not frequent shopping centres. They try to be more self sufficient. http://www.hutterites.org/ After reading their story I cannot fail to be impressed with their lifestyle and common good community achievements. We kept Pat awake until midnight again. 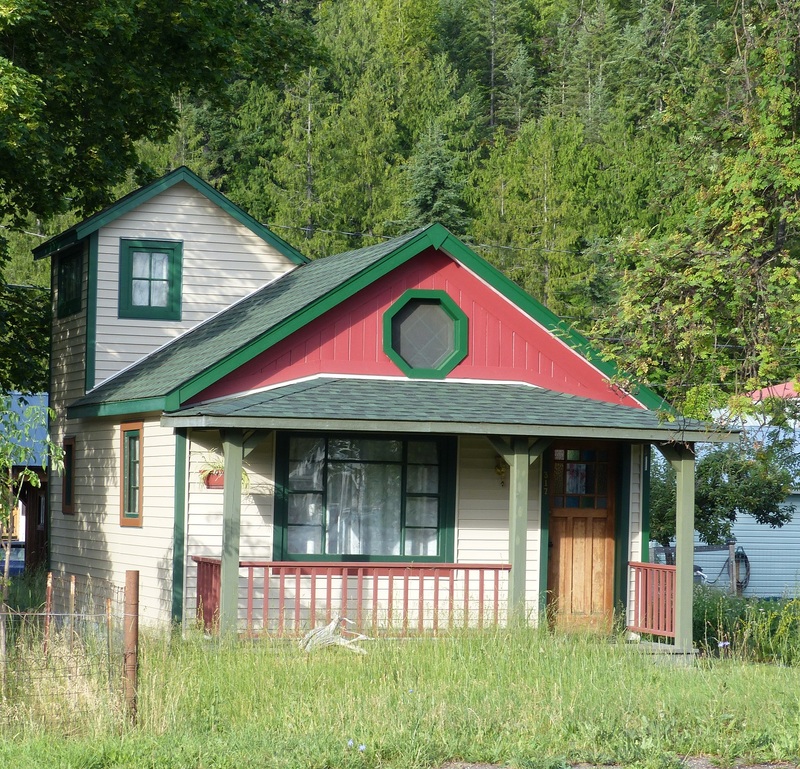 The house is at least 100 years old with several additions over the years. The original timber floors featuring 2 inch floorboards is still in amazing condition. This was another day of visiting family and getting some stone chips repaired in the 4Runner. before collecting Alecia from near the airport then returning to Pat’s house for a family barbecue. Edmonton https://en.wikipedia.org/wiki/Edmonton is built on the Saskatchewan River and is the Capital of Alberta Province. 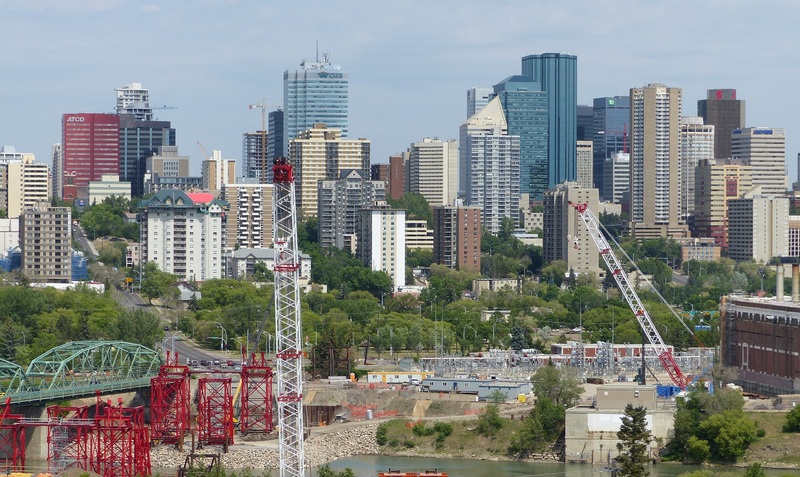 Much of the real business is now centred in Calgary which is a resource centre for the mining and oil boom. The city is busy with construction and re-construction while the suburbs seem to be wave upon wave of new houses under construction. The freeways and industrial areas are also being reconstructed and expanded. Big money is being spent. After a family dinner in the cool of the backyard we once again found ourselves saying goodnight to Pat at midnight. Donnis and her cousin Mark. 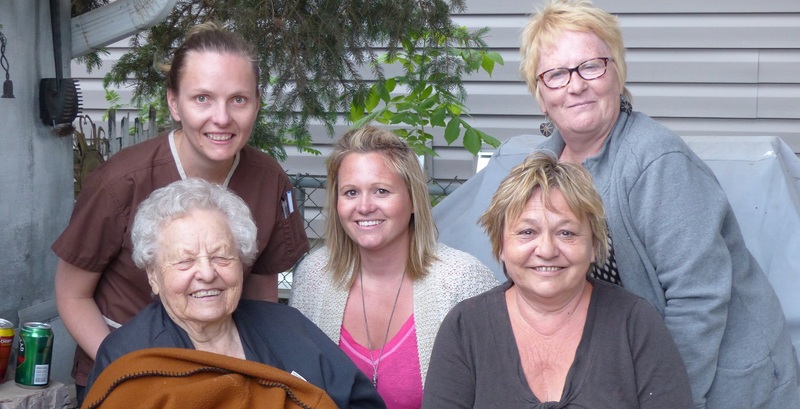 Donnis family…daughter Alecia on the left and Cousin Jacqi on the right then her aunt Irene second cousin Vanessa and cousin Pat mother of Vanessa. Thank you for your hospitality and organising the family get together Pat. We enjoyed our time with you. Marina walkway and Cold Lake. The lake freezes and car drive onto the lake and cut holes in the snow for a spot of fishing. Narina at Cold Lake. This is a freshwater lake so yes, the lake does freeze during winter. which upon coming over a hill and on first viewing looks like the sea. https://en.wikipedia.org/wiki/Cold_Lake,_Alberta Alecia has a unit here and the tenant vacated at the end of May. We were here today to inspect the unit, carry out any repairs, replace any missing or worn items and to clean. 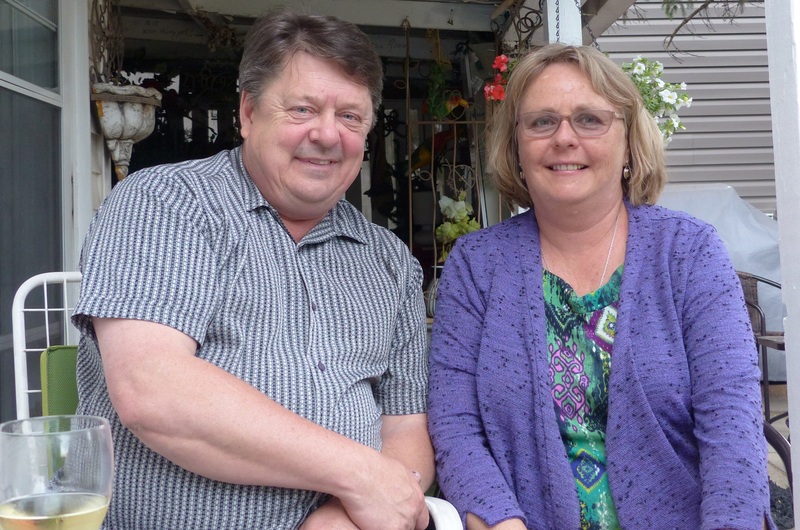 It was also a nostalgic trip for Donnis as we passed through the town of Bonnyville where she lived with her children for a couple of years. A big storm rolled in about 8pm. It included lightning, thunder, wind and rain something the area has not seen for more than a year. Cold Lake is near the Canadian Air Force Air Weapons Range where bombing training takes place regularly. 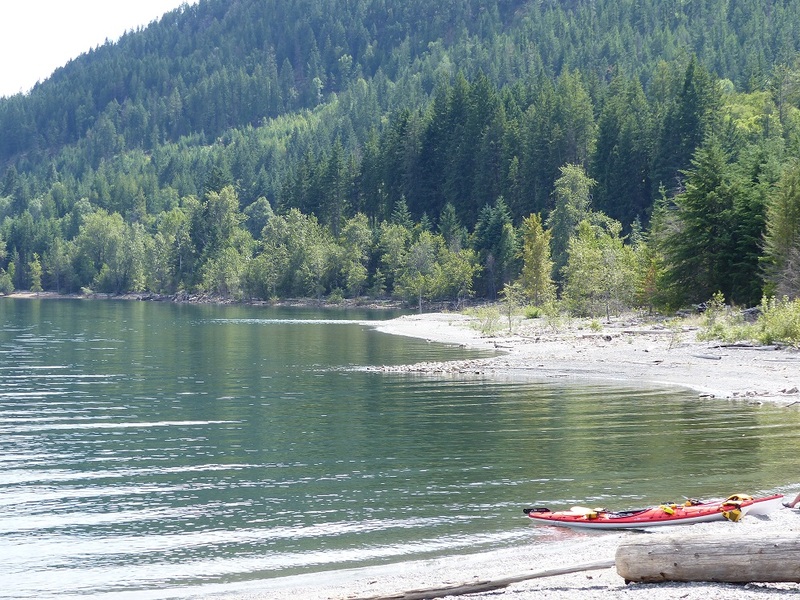 The lake is a popular fishing and boating spot during summer. Winter it is famous for ice fishing when the lake freezes. Boats in the marina are lifted just above the water during winter. 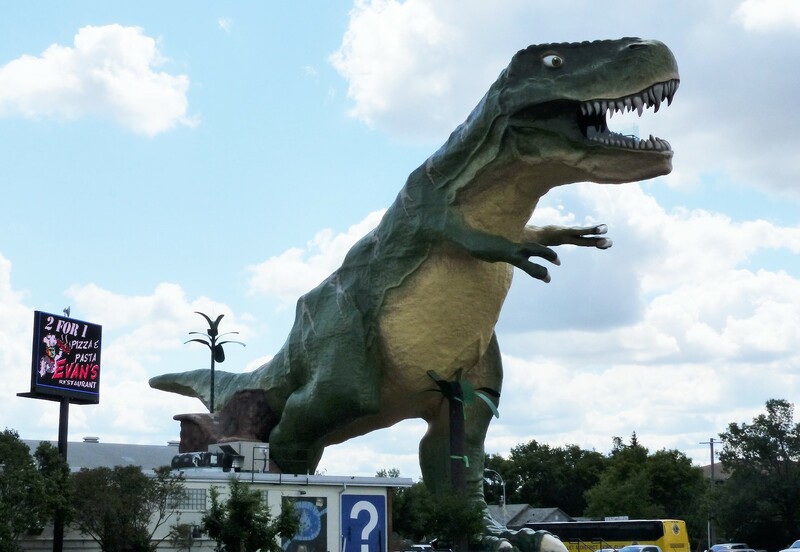 worlds largest Mallard roadside attraction and Mundare https://en.wikipedia.org/wiki/Mundare home of the worlds largesr Ukranian sausage roadside attraction. Both towns have a large Ukranian population. 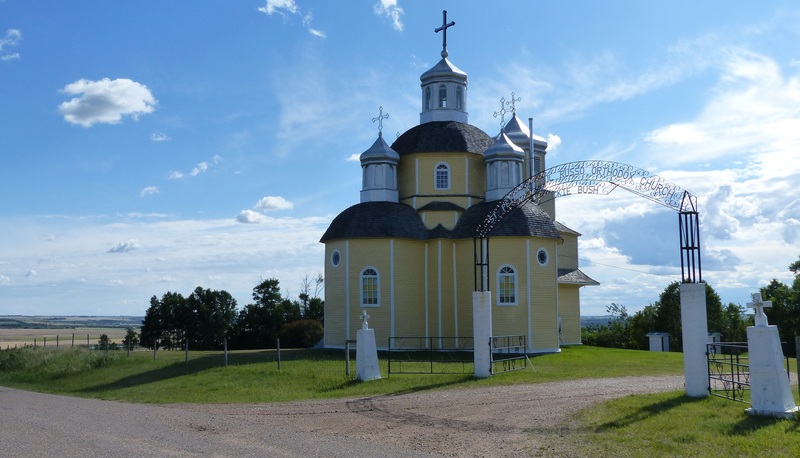 The churches, houses and barns are all traditional Ukranian style. 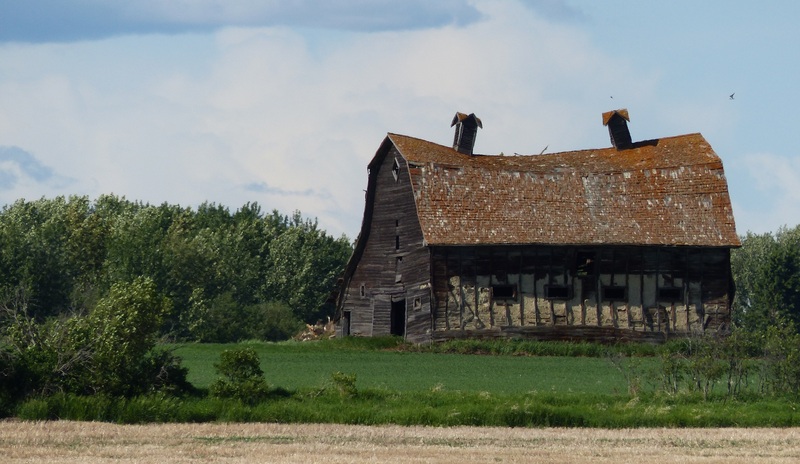 Crumbling ruins of a Ukranian type barn. For a radius of a few hundred Klms there are reminders of Ukranian settlement in the form of farmhouses, barns, churches and shops. Another Ukranian Church on a hill in the duistance. There are many such churches in the area and all seem to be built on the tallest surrounding hills. Alberta is known as a flat and featureless province. A crumbling community hall – Ukranian. Grain silos – Ukraninas are noted for their grain silos. We had planned to have a Home Made Perogies https://en.wikipedia.org/wiki/Pierogi at a well known local eatery but it was after 6pm and the store was closed. Today was a rest and recovery day after all the travelling of the last few days. A trip to a huge indoor farmers market was an interesting diversion for lunch. http://www.calgaryfarmersmarket.ca/ Unlike most markets this one is mainly concerned with produce and prepared food. Another lay day today. I did take a trip to Costco with Josh (a boarder staying with Alecia and Tyler) To buy anything at Costco you must have a membership card. I used Josh card. Considering this was Sunday and very cold outside, Costco is warm and the shoppers were out in droves. I guess they do not have a nice warm sunny day and a beach to go to. Everything in Costco is larger size or sold in bulk. I called our visit a cultural event. We have plans for the coming week. All going well I expect daily posts may begin again. We spent the night in a cold basement of a private home in Jasper. Thank goodness there was a warm doona. Jasper View along the main road. Another eventful day on the Rocky Mountains and beyond. 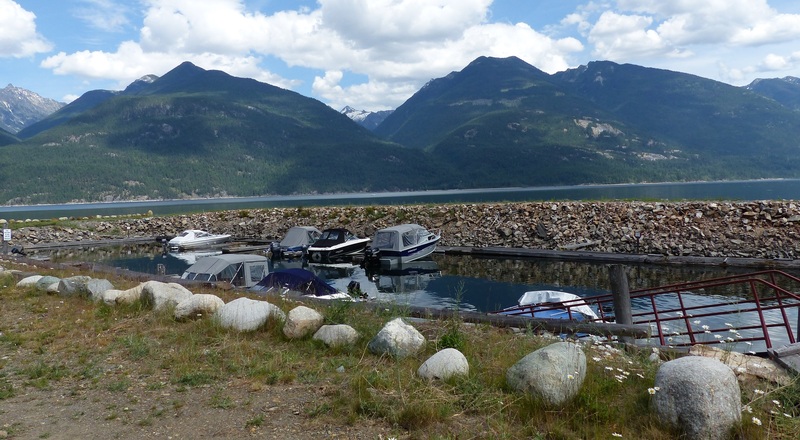 Initially the plan was to drive to Edmonton where Donnis had previously arranged to meet family who were camped at a place called Smokey Lake. Her plan had called for us to be there on Saturday and stay over the weekend. 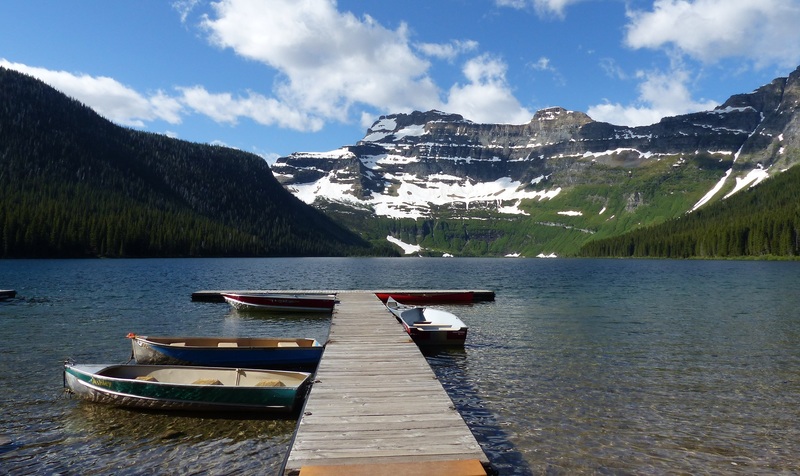 Because we had an extra night at Lake Louise that plan went out the window. Just like many of our plans which are not set in concrete. It was a wow day for us. Before leaving Jasper we thought because we had missed Athabasca Falls yesterday, we could drive back into Jasper National Park for 30 Klms and find the falls. 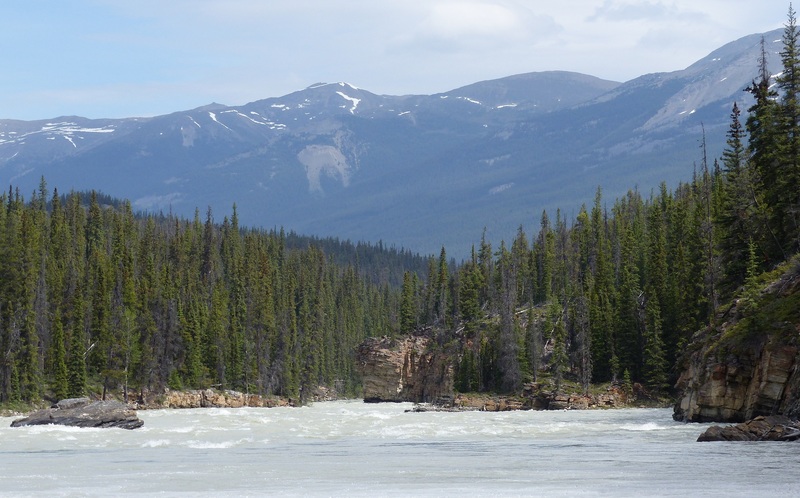 Wow, this is still the Athabascar River but has now been fed by numerous creeks, streams, rivulets and brooks all swollen with meltwater. 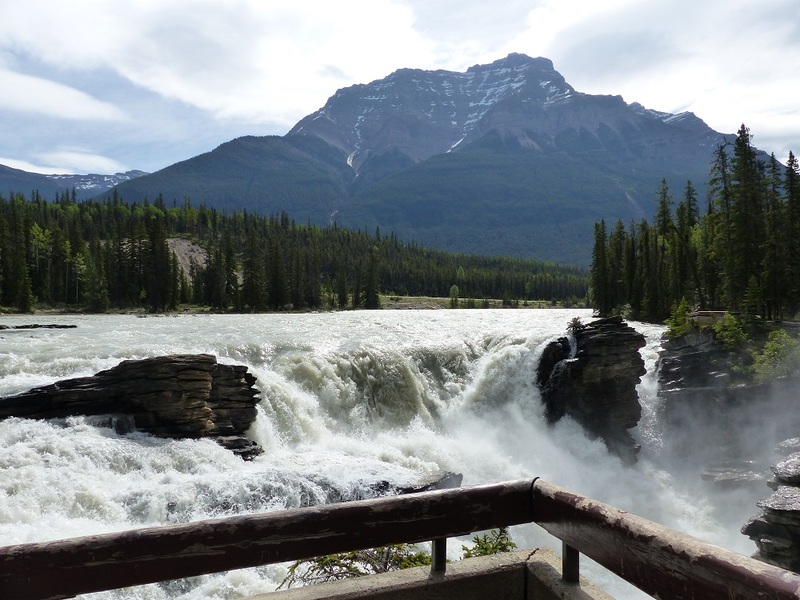 The falls are huge with water rushing through a slot like chasm in the surrounding rock. The noise made normal conversation difficult. 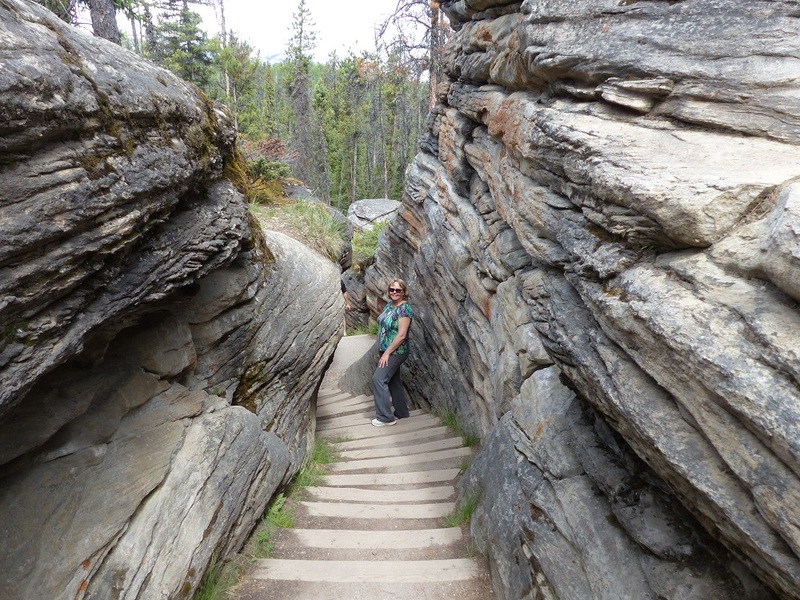 Doinnis on steps placed in an original slot chasm where perhaps the falls once raged. Just below the falls was an area of relative calm where a white water rafting company launches its adrenalin charged tours. I have white water rafted and canoed in Australian Rivers where for the most part the water is if not warm at least not chilly. The water in this river is worse than chilly. It is hypothermia inducing cold. The paddlers have to wear wet suits to stay warm. Donnis on a lookout above the final swirling falls. 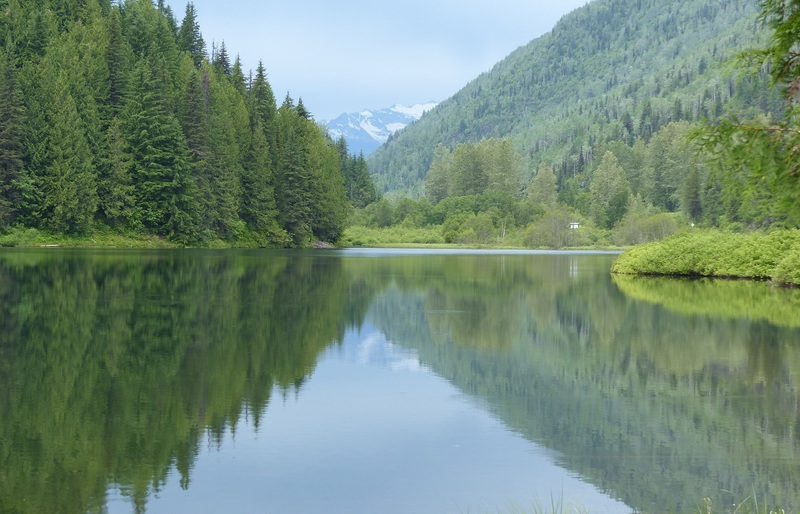 The river now rushes through another gap on its way to drain into several rivers and lakes before discharging into the Arctic Ocean. 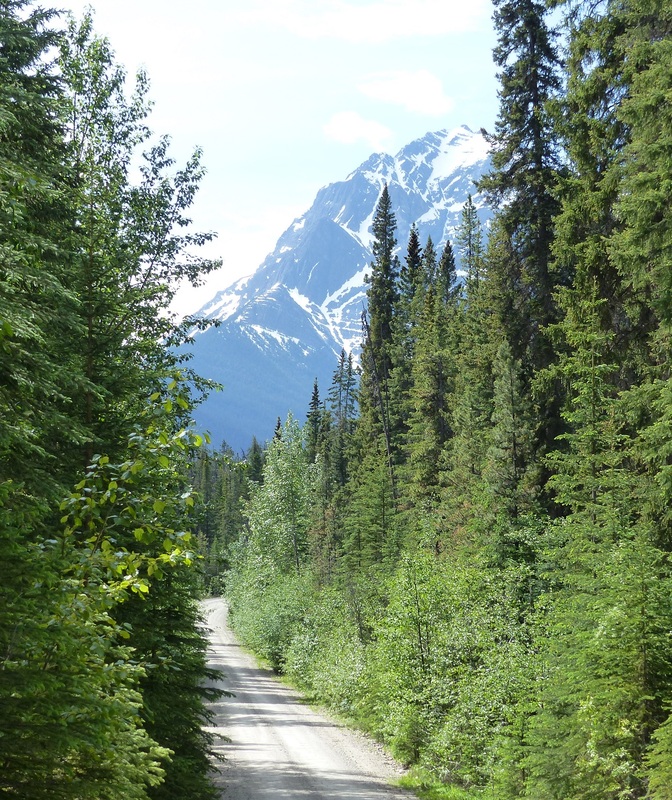 We left the falls and instead of returning to Jasper on Highway 93 we took the backroad known as Highway 93a. Highway is not a good description as the road is barely wide enough for two cars to fit side by side and there are no shoulders but there are deep gutters along the side of the road. We took another gravel road to Moab Lake which we soon discovered led to an isolated camping carpark and a lengthy walk through dense forest eventually led to the lake. This is bear territory so we decided not to look for the lake. Gravel road to Lake Moab. Once back on 93a no sooner had I said, “with luck we will see a bear here” when we did! 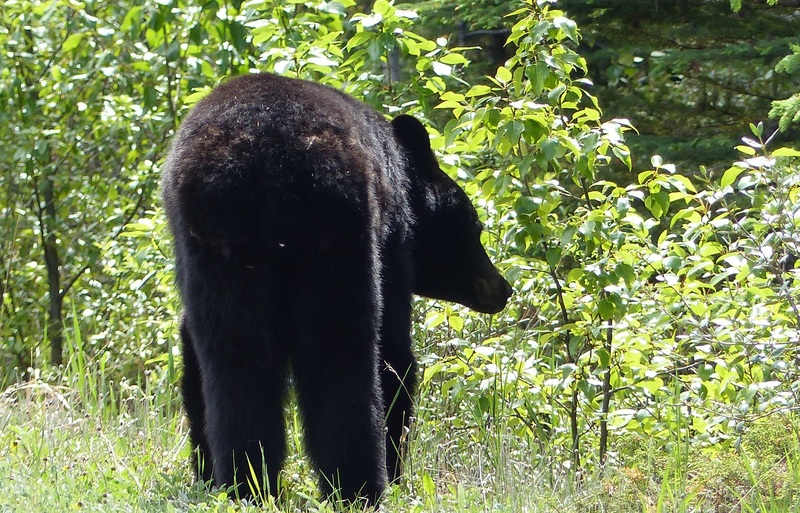 A Black Bear was wandering beside the road. We stopped, naturally, to take photos. It was an exciting moment for us. Donnis stepped out of the car with camera although the bear was walking away and she only went as far as the rear of the car. Despite that margin of “safety” we still felt a little nervous. What if another bear was nearby? 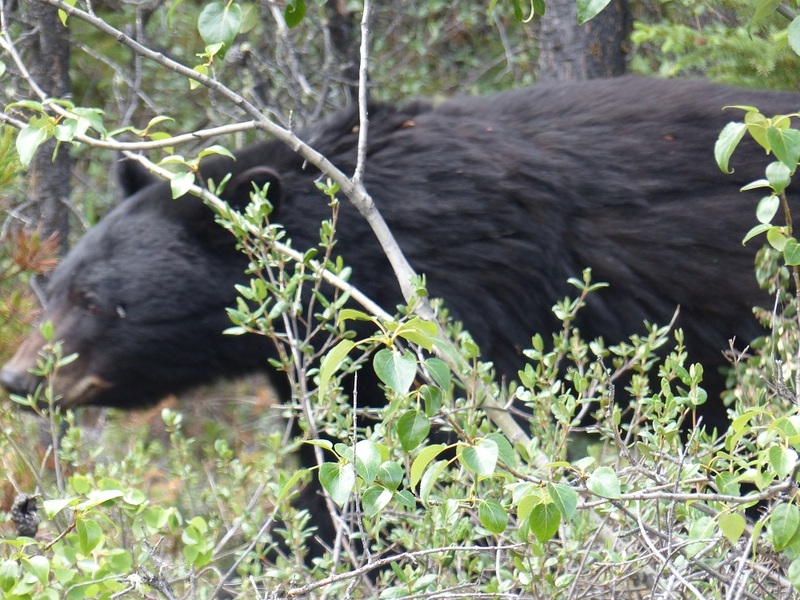 We spied this black bear on the road. 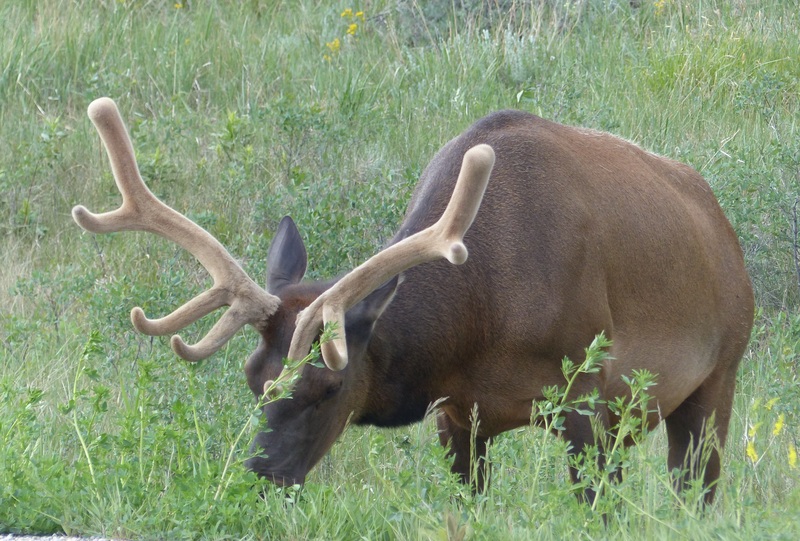 By the time we stopped and got the camera ready it had moved passed the car and was wandering along the grassy edge. After seeing the bear we drove back to Jasper and turned east to Edmonton. 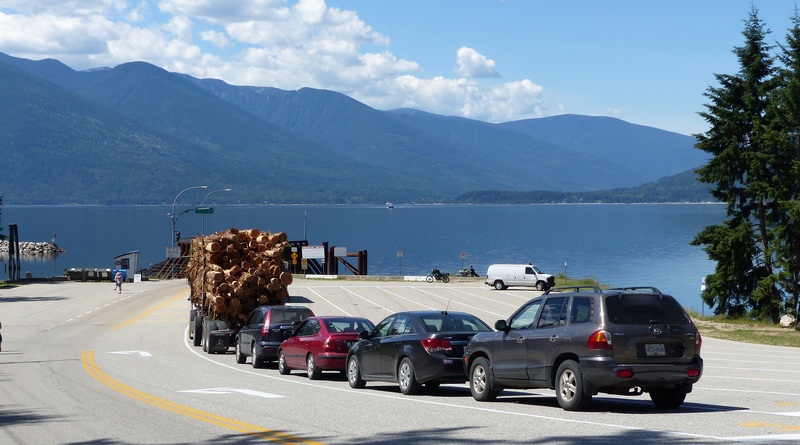 Not far out of town beside a lake, traffic stopped. 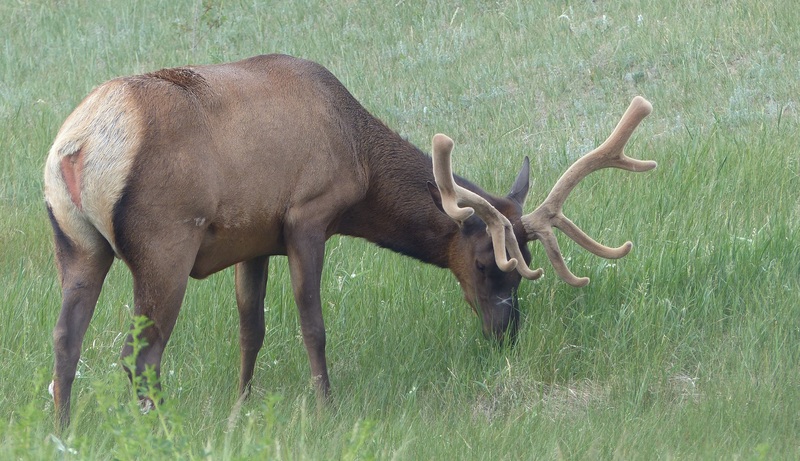 A young Elk was grazing beside the highway. Buses, trucks and cars all stopped and an amazing number of cameras and iPads and smart phones were taking photos. 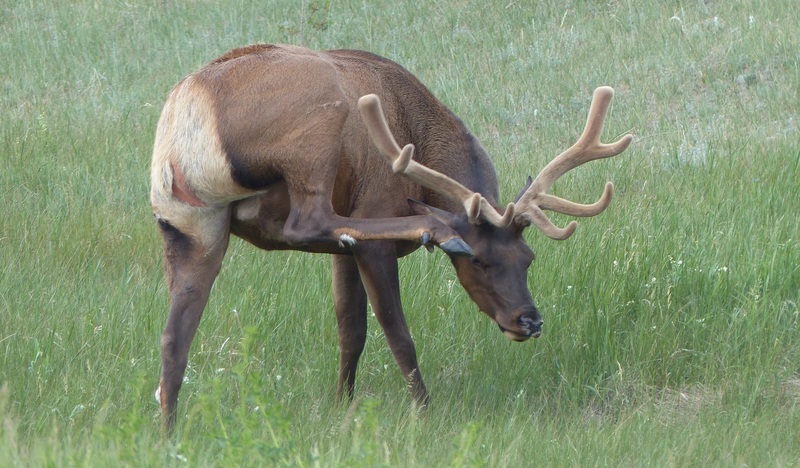 This buck was grazing, unconcerned, beside a busy highway. A few Klms further on traffic stopped again. 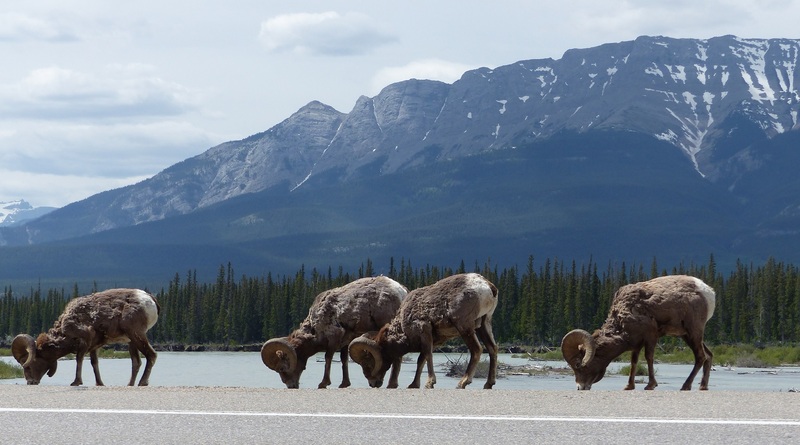 This time a group of Long Horn Sheep were eating something on the road verge. Cliffs on the opposite side of the road also had a larger group of sheep looking on. Longhorn caught in mid flight up the cliff face. 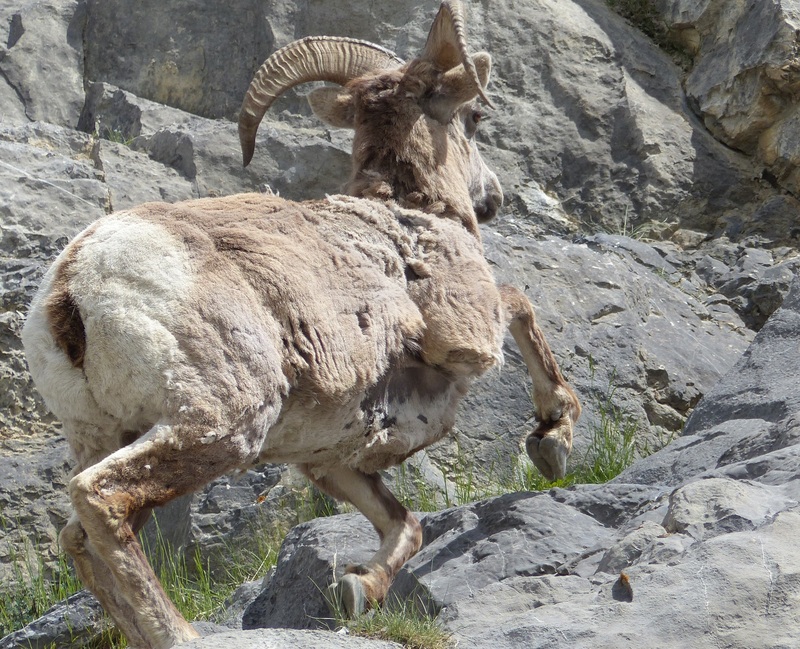 Less than a Klm around the bend was a group of Mountain Goats but there was no room to pull up to take photos. 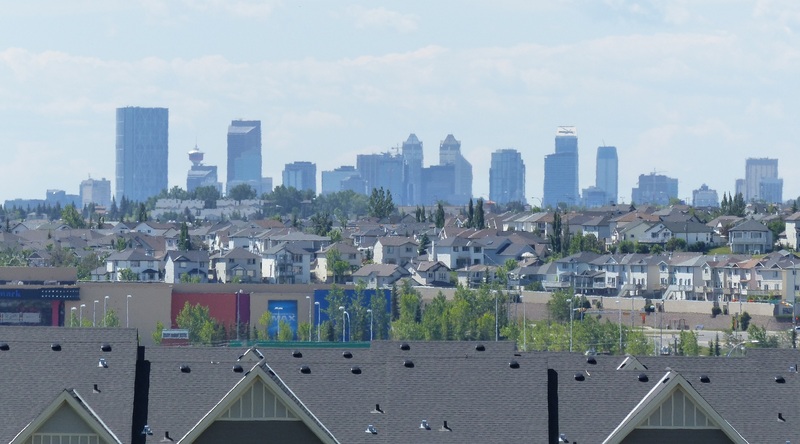 Late in the afternoon we arrived in Edmonton Donnis home as a young girl and teenager. We met and had a meal with Melanie J, daughter of Darlene J, Donnis friend since elementary school who died tragically in Hawaii two years ago. After dinner we arrived at Donnis cousin Pat K who still lives in the family home in downtown Edmonton. Sorry for arriving so late and keeping you up to midnight Pat. Thank you also for giving up your comfortable bed for us. We are grateful. .We drove over 400 Klms today so no rocking was required to lull us to sleep. Saturday 6th June After a late breakfast we still managed to get on the road by 10am. 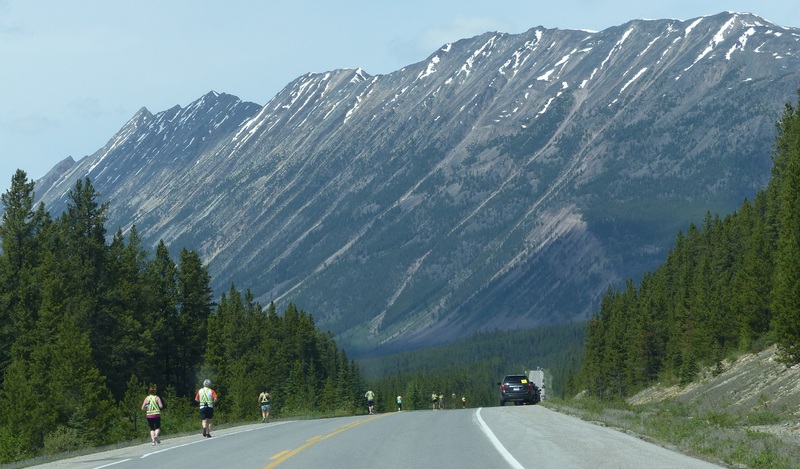 There was a relay race from Banff to Jasper. Www.bjr.ca. Supposedly it is a 260 klm fun race through the Rocky Mountains but there are those who are serious. Naturally they started the Lake Louise to Jasper leg before we got on the road so we were slowed in many places by the racers and their support crews and changeover locations. Mountain range known as the Endless Chain. The runners in the relay seemed like an endless chain of traffic disruptions. The entire length, well at least the parts that we have seen of the Rocky Mountains drive is …umm err, spectacular all the way. Sorry I cannot find other words to describe the voyage. Like the Great Ocean Road in Australia I can enjoy the drive – both ways – as often as possible. 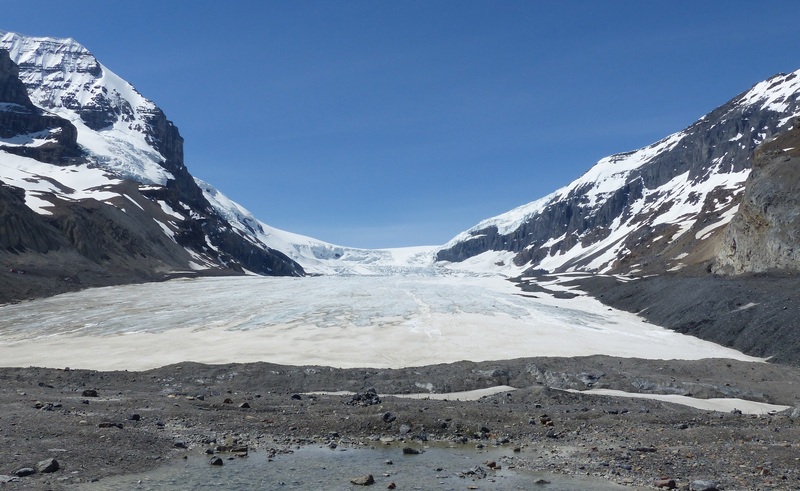 We stopped at the great Athabaska Glacier in the Columbia Icefield. http://en.m.wikipedia.org/wiki/Athabasca_Glacier. 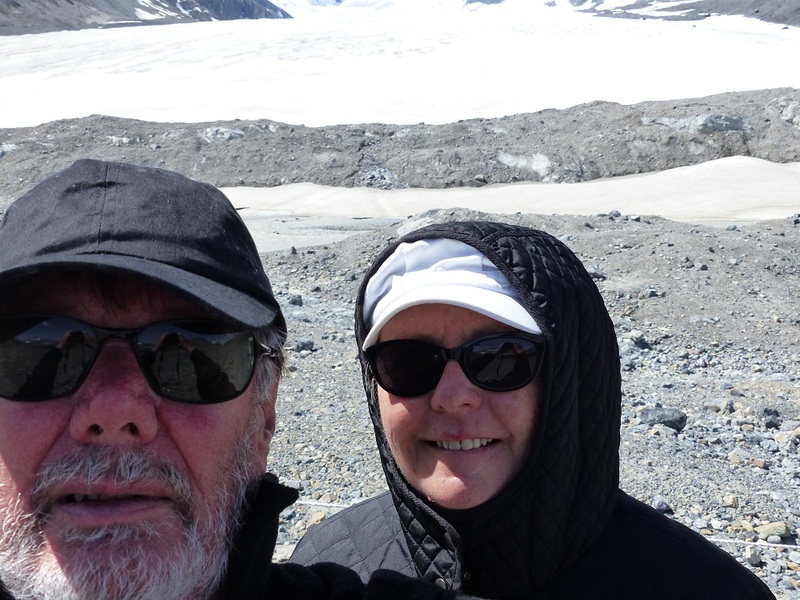 We opted to walk over a moraine created by the receding glacier to the toe of the glacier. Enlarge the photo to see the people – like us- who had to hike over this glacier created moraine to reach the toe of the glacier. 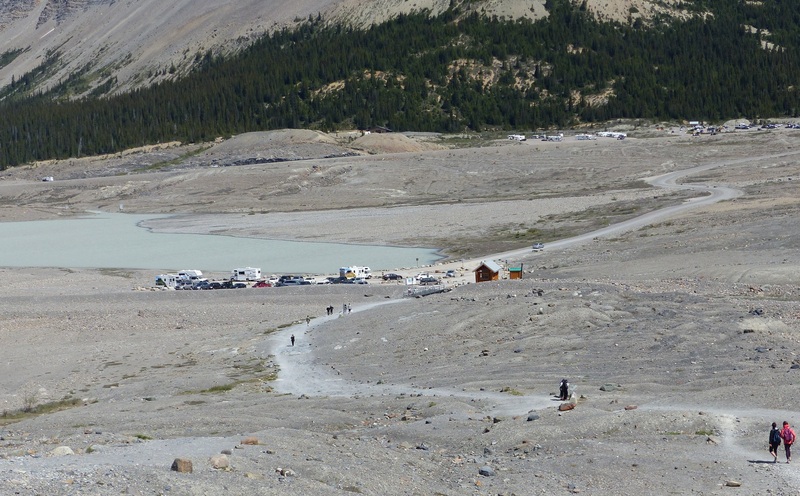 Carpark at the base of t Moraine created by the receding Athabasca Glacier. 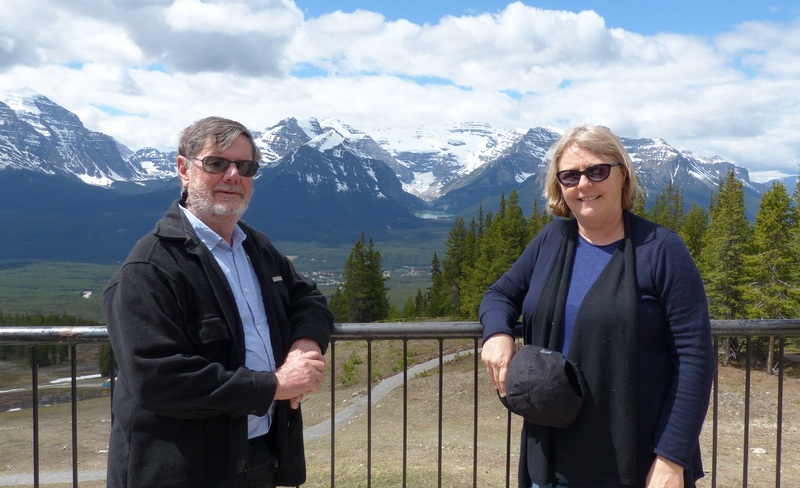 Way in the background can be seen the carpark for the Icefields Discovery Centre. The wind whipping down from the glacier was both fierce and chilly. At least Donnis had better cold protection. 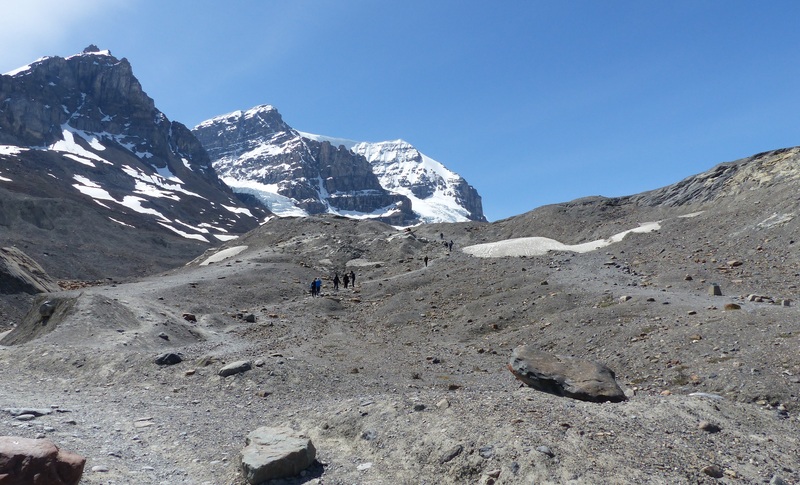 The Athabasca Glacier seen from the top of the moraine created by the receding glacier.. An idea of its size can be gained by enlarging the photo – twice. In mid fram slightly to left can be seen a group of about 9 people on a guided tour. A little to the right and further back is a couple who hiked further up the glacier. In both tours the guide and guided carry rescue ropes and ice picks and pitons etc as there are crevasses which can open up unexpectedly. Several deaths have occurred with unprepared and unauthorised hikers. while others went for the comfort of a bus ride. Enlarge the photo. 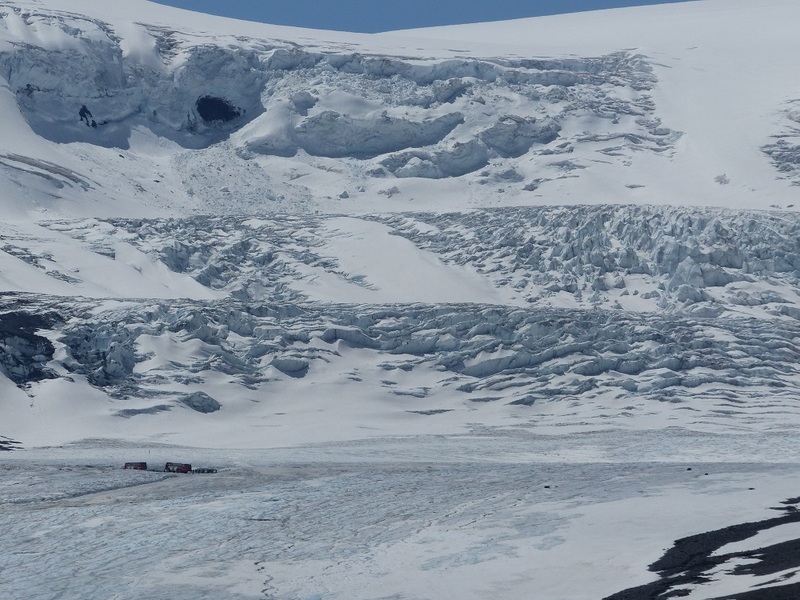 Tour buses can be seen on glacier. They are dwarfed by the towering glacier walls. Anyway to view this giant moving grinding frozen wall of snow and ice is awe inspiring. The top of the iceberg, where the guided tours walk, to the valley floor, is higher than the Eiffel Tower. I would have happily stayed here walking around but the frigid wind whipping past my ears gave a painful earache. We were simply not dressed appropriately for the conditions. My gloves and Tuk were in the bottom of our suitcase. Across the road is the Columbia Icefields Discovery Centre which thankfully had hot food and huge lines of tourists waiting to book either a foot guided tour of the glacier or the more popular bus tour onto the glacier. 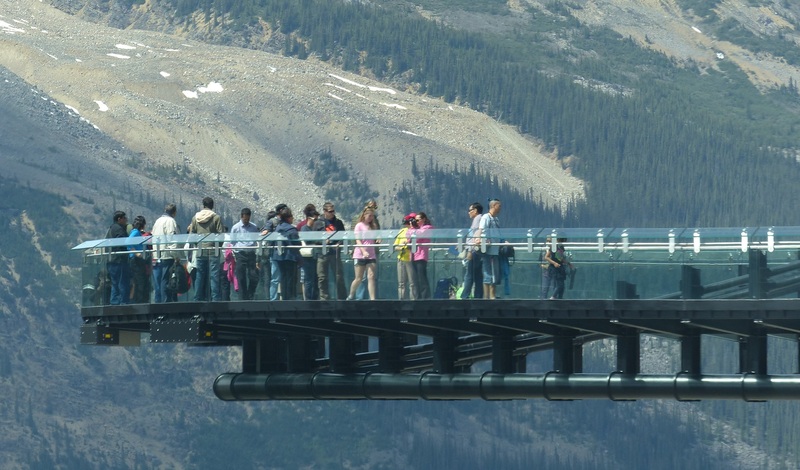 Just a little north of the icefields is the Glacier Skywalk. 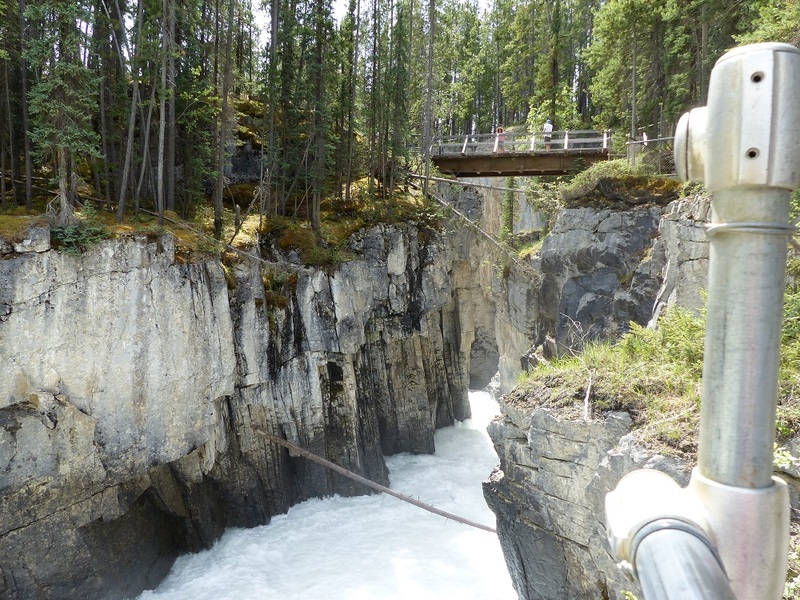 A glass bottom suspended platform over the Athabasca River where several glaciers can be seen. 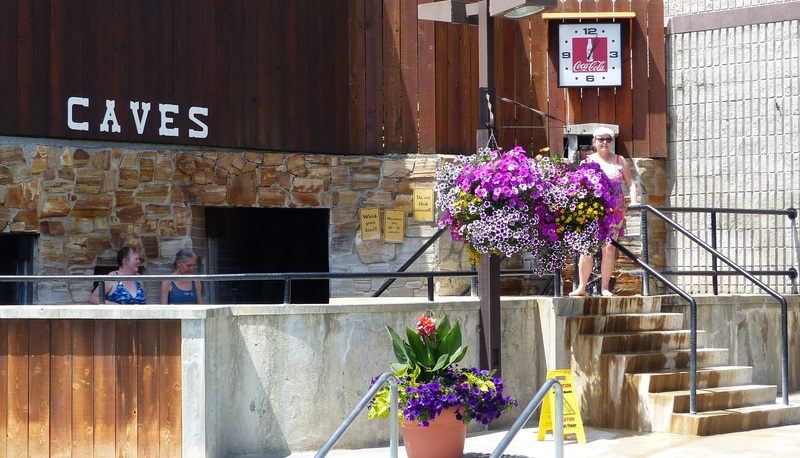 We opted not to stop here as we were on a schedule and the $30 each admission fee. 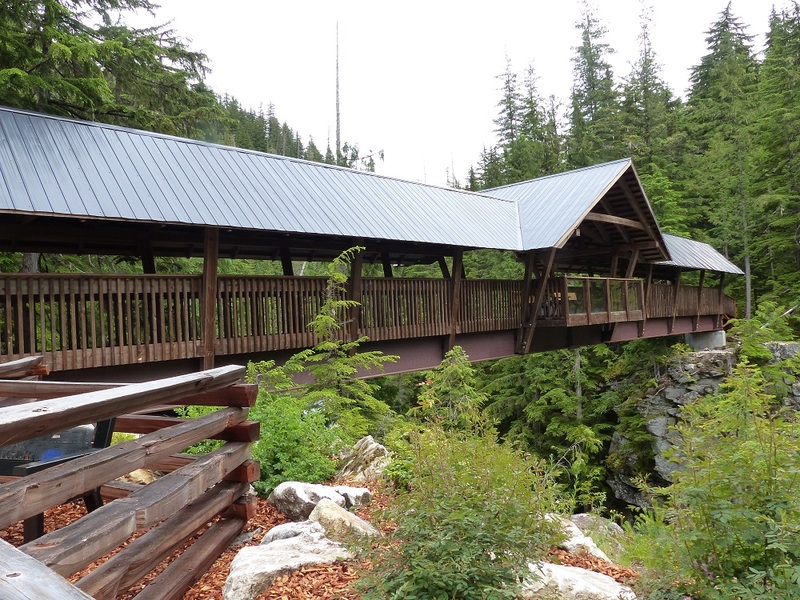 This is the Glacier Skywalk with the glass walkway. 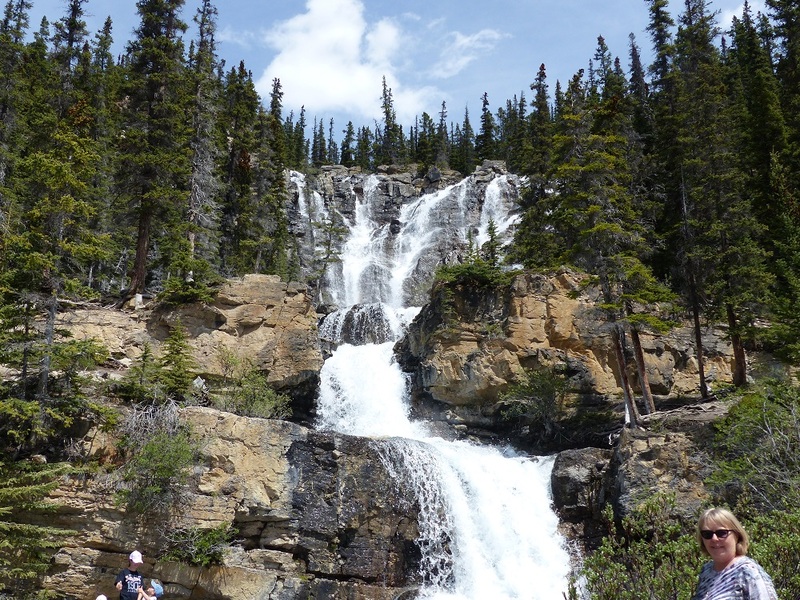 Next along the road was Tangle Falls which is accessible beside the Icefields Highway. 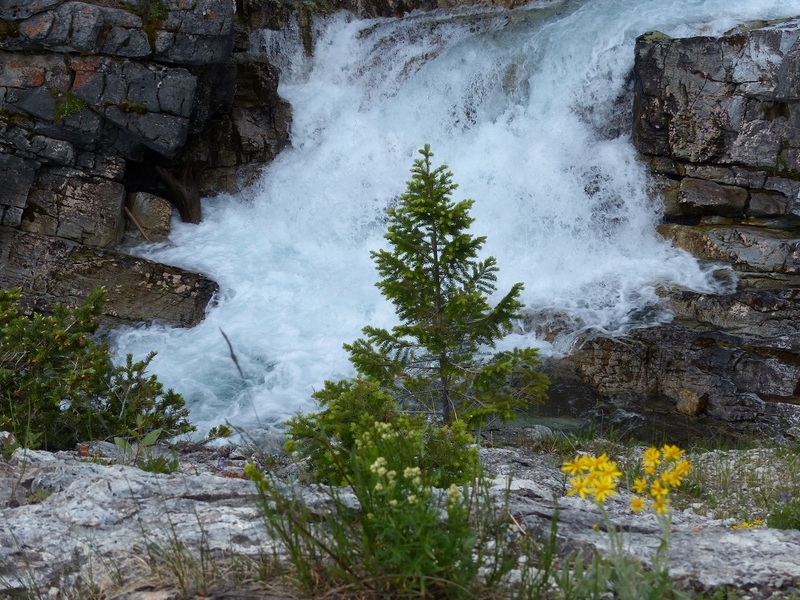 Tangle Falls beside Highway 93, Icefields Parkway. 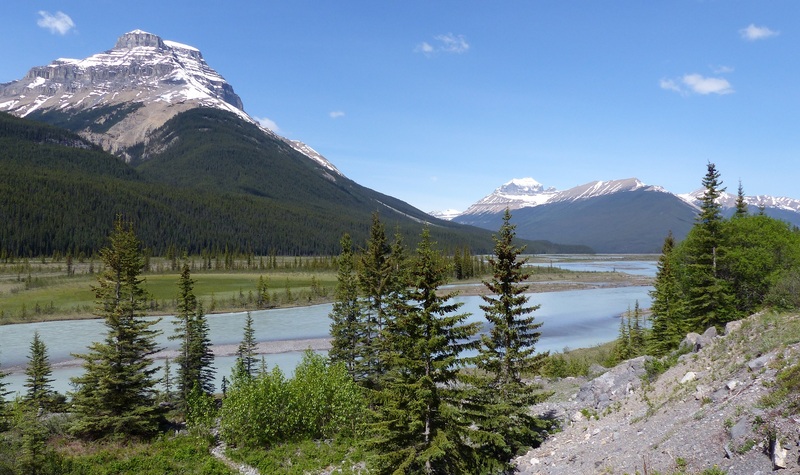 The highway for the most part follows the raging Athabasca River all the way to Jasper. http://www.world-of-waterfalls.com/canada-tangle-falls.html I felt a little uncomfortable here as the only parking is on the opposite side of the highway. A pedestrian crossing is on a steep curved section of the highway with cars and buses zooming along are expected to suddenly brake to allow a pedestrian cross the road. It is the only pedestrian crossing in a 150 Klm stretch of highway in the middle of nowhere. 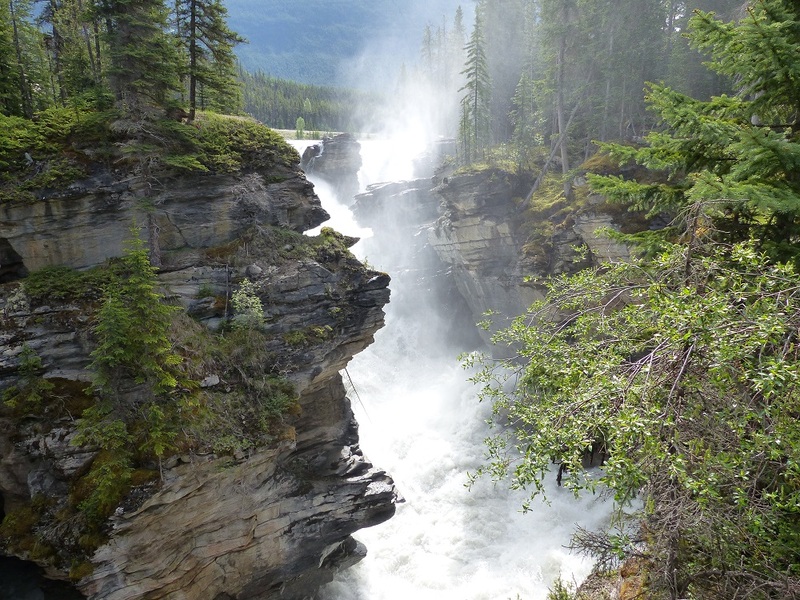 We next moved on to Sunwapta Falls where the meltwater swollen Athabasca River roars its way through a deep and narrow chasm. 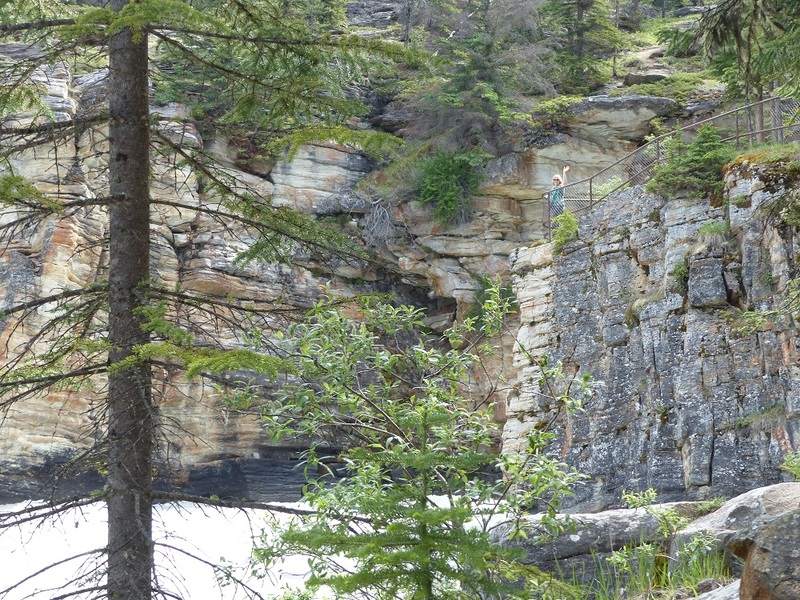 At the top of Sunwapta Falls. 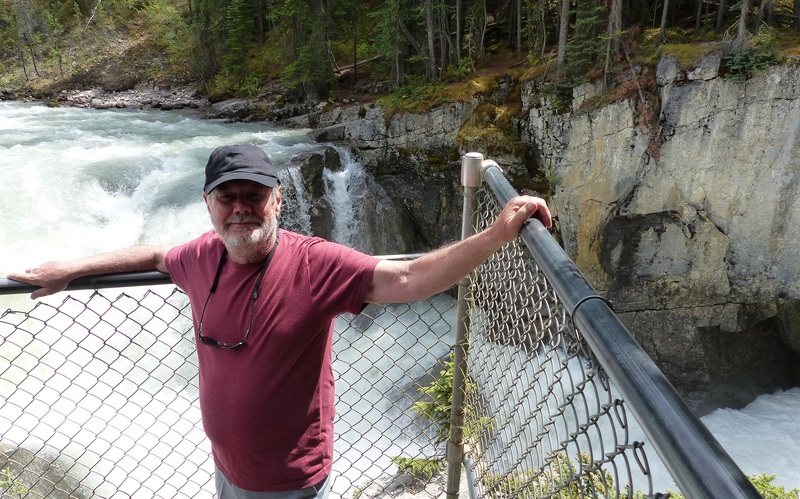 The difference of less than 100 Klms from the icefields meant it was comfortable for short sleeves to be worn. 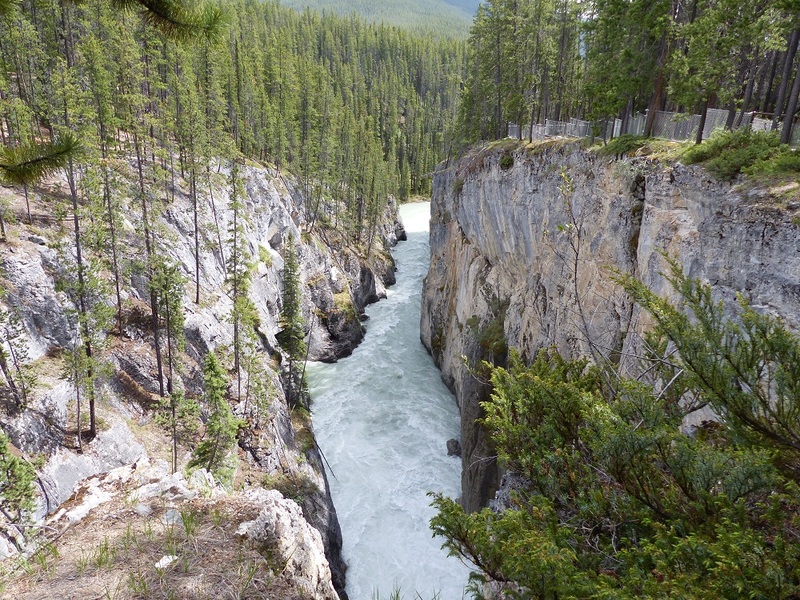 The water of Athabasca River forces its way through this narrow gorge. Another view of the gorge. A few Klms outside of Jasper we saw a Cow Elk with a calf. 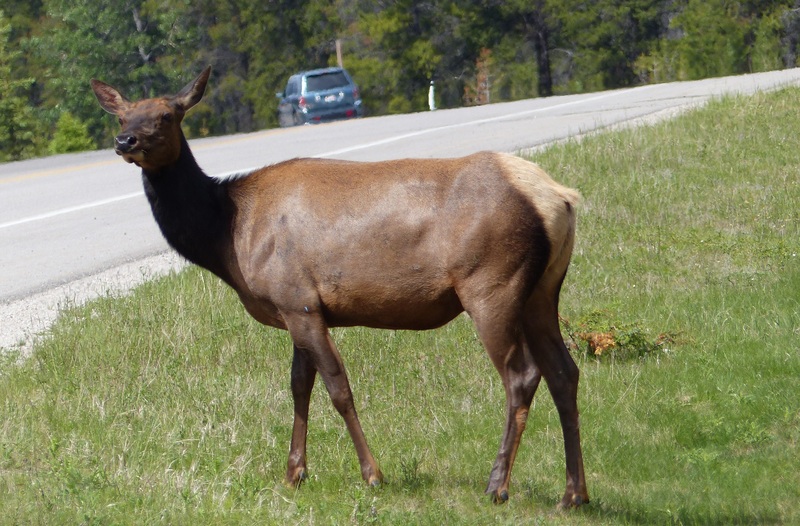 Mother Elk intimidating traffic so she and her calf can cross the hiner pastures just outside Jasper. The mothers are very protective of their young and will charge people who get too close. 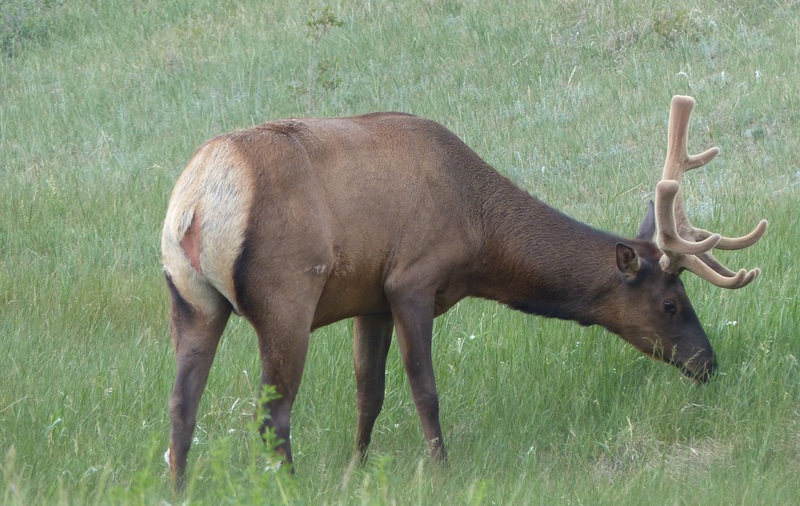 While Donnis was busy learning how to use the zoom we ran out of memory on the camera and the Elk crossed the road, with calf and disappeared into the forest. Once in Jasper we searched for accommodation which we found to be scarce, probably because the relay race finishes here. Eventually we found a room in a private house basement. 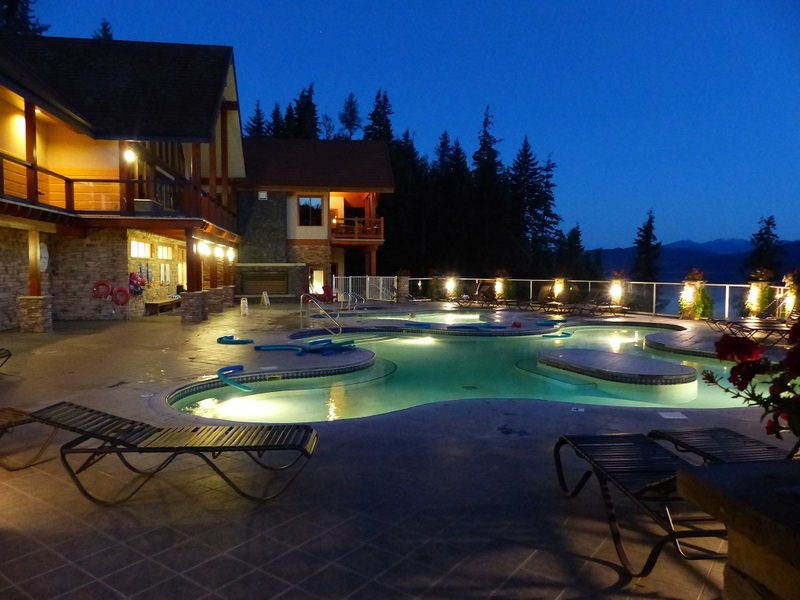 Jasper has a system of home stay accommodation which provides basic accommodation …at a price. In the winter ski season all other mainstream accommodation is booked solid. 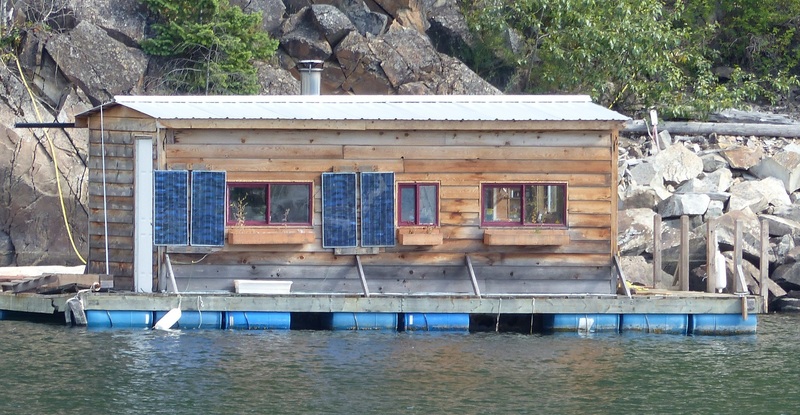 The homestay takes up where the usual hotels, motels and bed & breakfast are booked out. The sun was shining by the time we woke. 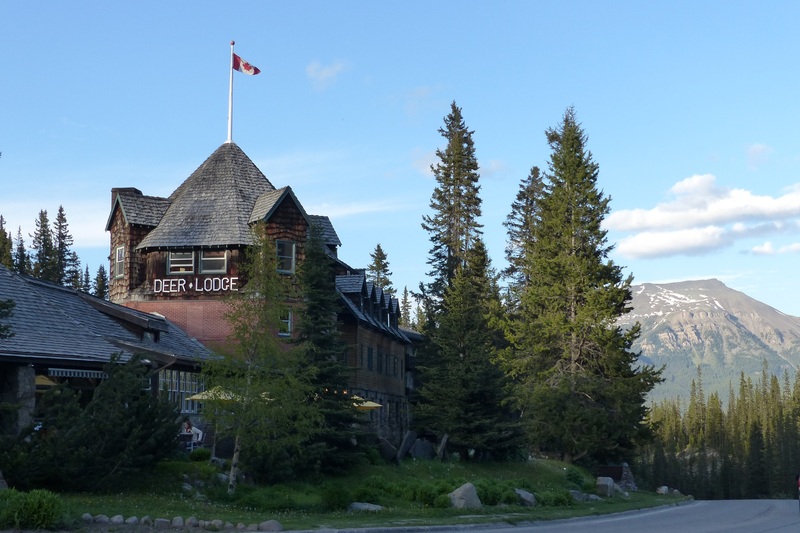 Before we went to breakfast I asked the office if we could have another night at Deer Lodge at the same rate as Simone & Lazar had negotiated. It was agreed we would stay for another night for about the same cost as a meal with wine at a nice restaurant. I should mention that as good as our room was, it had no refrigerator, no TV and no lift to the third floor. The room was top of the range with a King Size bed. The weather has been reasonable enough for us to sleep with just a sheet instead of the heavy doona and quilt which was on the bed. Deer Lodge our accommodation for two nights. In the morning we took a Gondola/chairlift ride on the Lake Louise Summer Gondola. 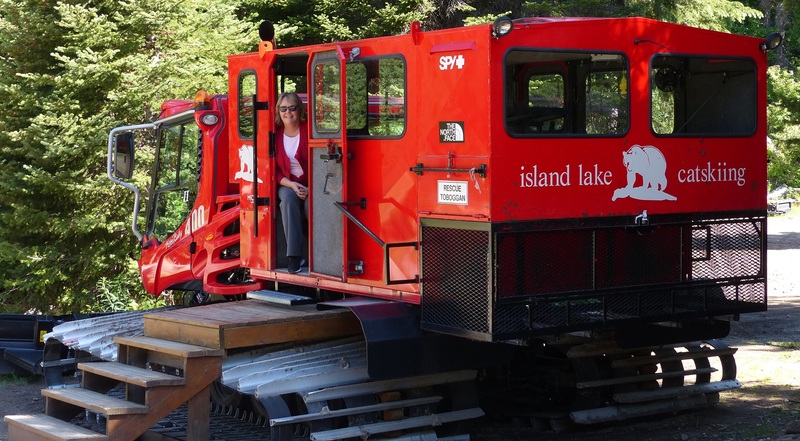 This is the same gondola as used in the winter! 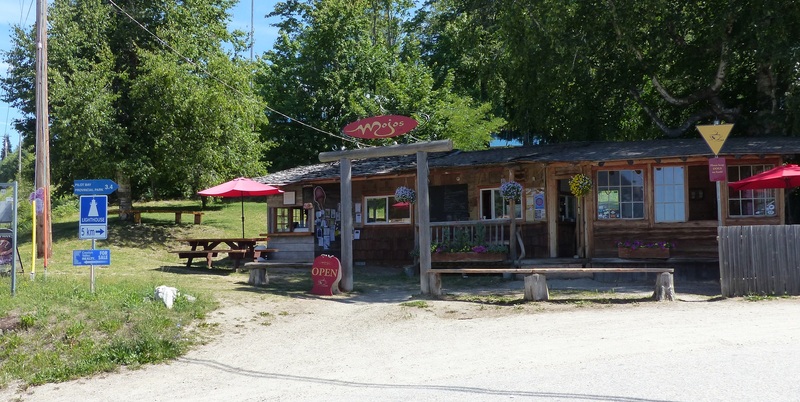 The ride took us to the restaurant and interpretive centre near the top of the mountain. In a field of flowering buttercups and dandelions we saw a young grizzly bear. 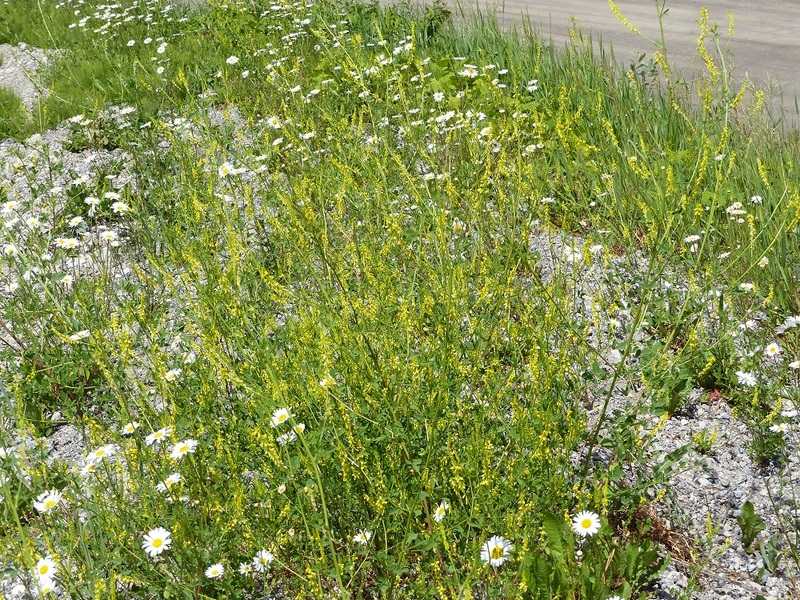 This grizzly eats the wildflowers in the field below the chairlift. Look closely and you can see his electronic tracking collar. Young in this sense that he is about 6 years old so not quite as big as a full adult. We were told that electric fences have been set up to keep all the bears out of the chairlift area. This young grizzly is within a huge area bounded by the electric fence. Although he had previously been moved he kept returning to this area. It is his territory. What we had not been told was that he has been fitted with an electronic collar so his movements can be tracked. Although this bear seems placid enough with the chairlift constantly taking passengers over his territory he is still a wild bear. He is used to humans but still has his natural instincts. Viewing platform at the top of the Lake Louise chairlift. Resort seen from chair lift. 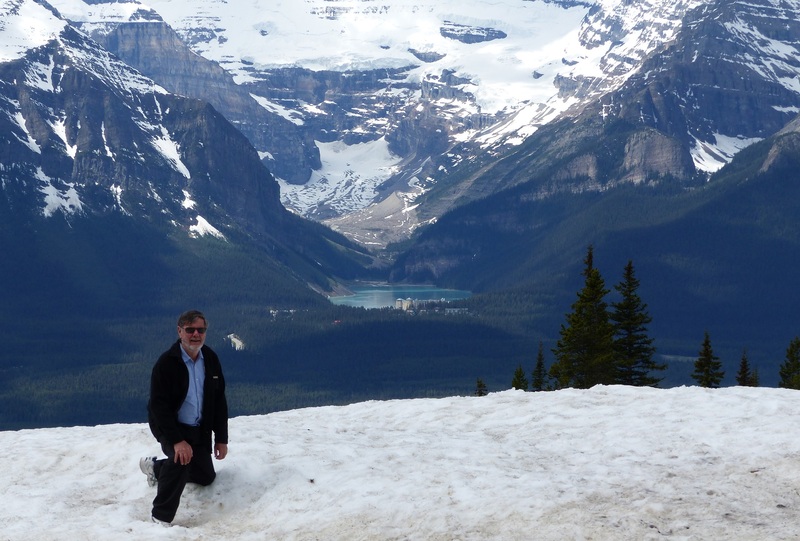 On a patch of snow with view of Lake Louise. The village of Lake Louise and Lake Louise with the Chateau seen in the centre. Yes, that is a glacier behind the lake. 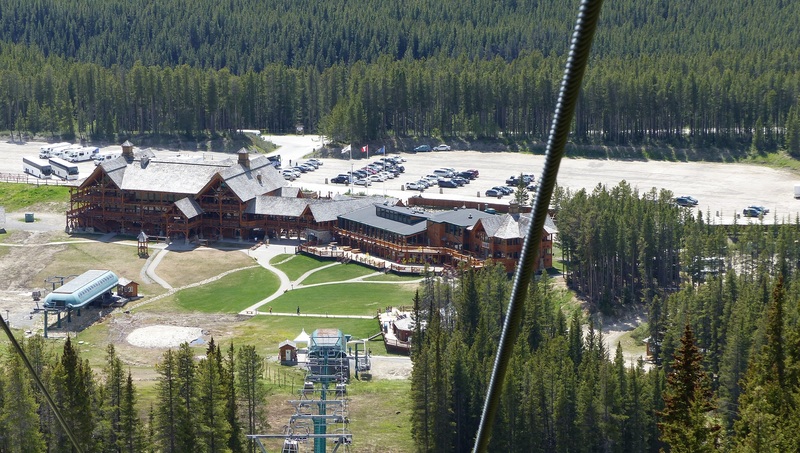 we took the gondola to Lodge of the Ten Peaks where we had previously booked a buffet lunch the took the chairlift to the top again. I think this could be a Groundhog. Then again it could be a Ground Squirrel or a Marmot or even a Gopher. Can anyone positively identify it for me? Our bear was nowhere to be seen. On our final descent we saw the bear again. We saw the bear again on our return trip. We then drove to Moraine Lake http://en.wikipedia.org/wiki/Moraine_Lake and scrambled over said moraine. 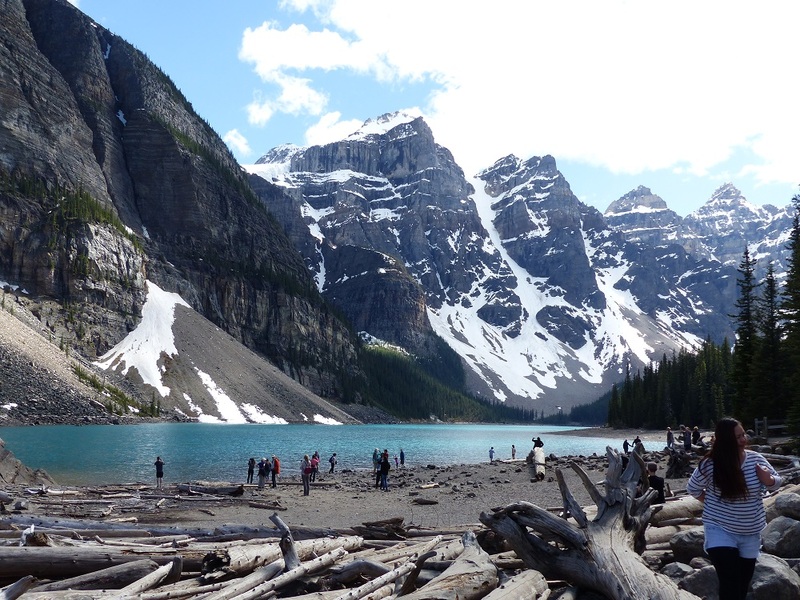 Moraine Lake with log jam in the foreground. 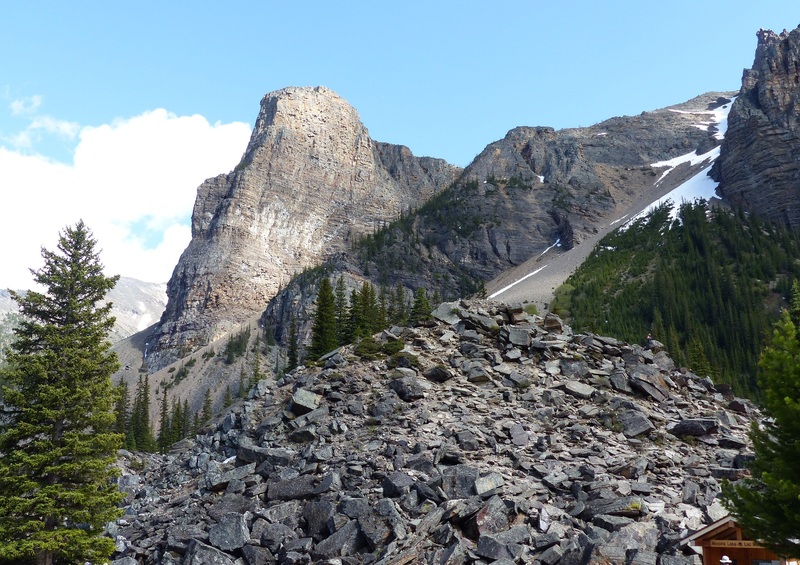 A moraine is basically the rocky residue left behind when a glacier retreats. http://en.wikipedia.org/wiki/Moraine The moraine keeps the meltwater trapped in the form of a lake. 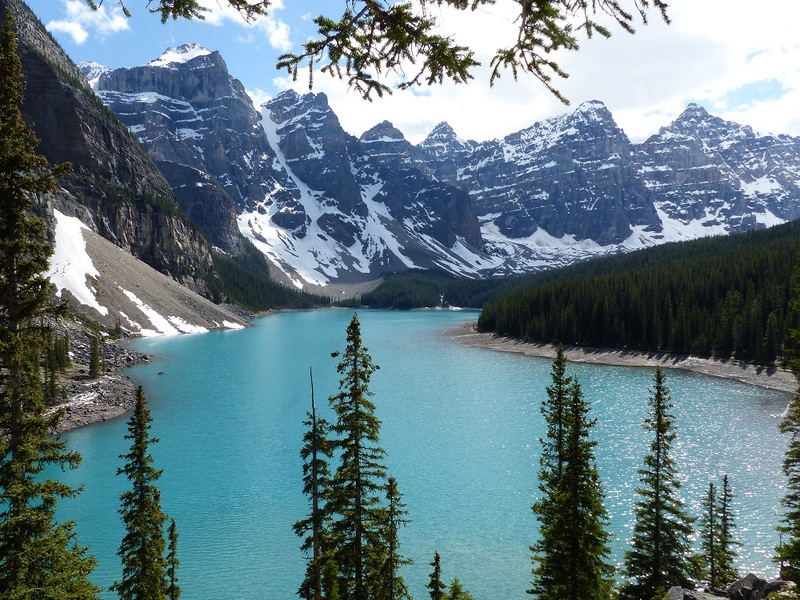 At times the meltwater becomes higher than the surrounding shores and water travels around the side of the moraine forming a part time river. 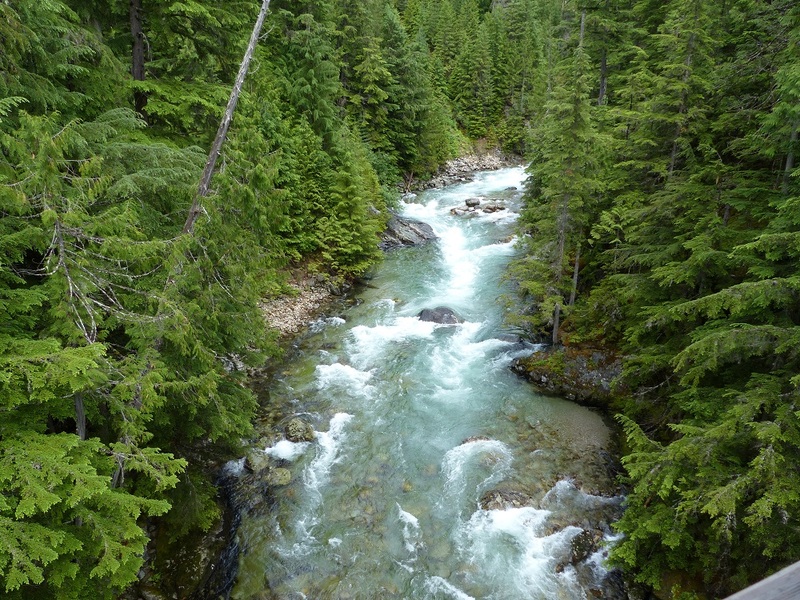 The times of this river flow is reflected in a jumbled pile of logs on one side of the moraine, washed there by the water flow in recent times. 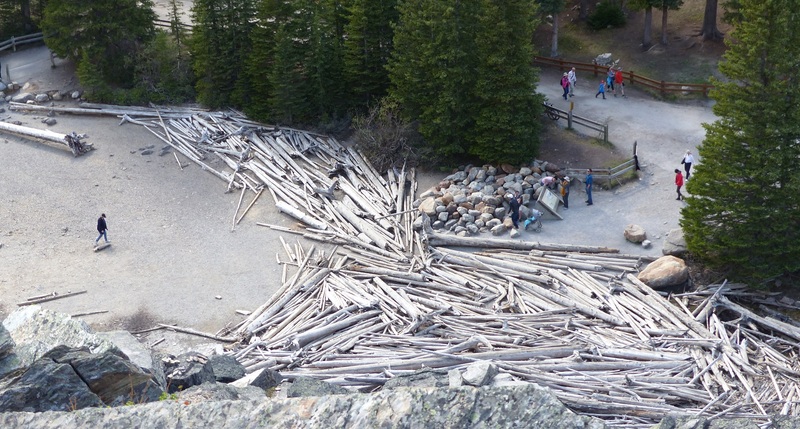 Log jam seen from the top of the moraine. We then hiked around the lake to a meltwater waterfall which more accurately could be called a gravel race. In the walk we could hear booming sounds in the distance. 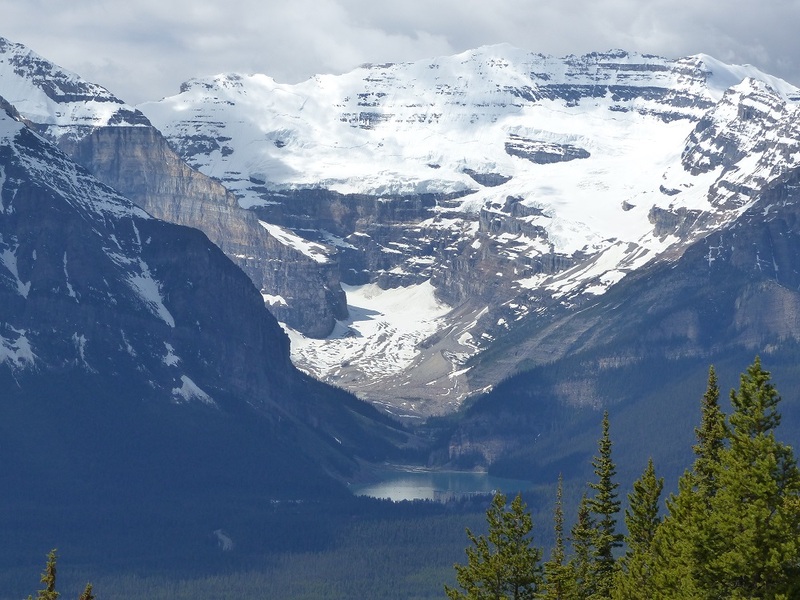 The sounds were not unlike the booms we heard when glaciers “calve”. We asked a ranger about the sounds. She confirmed the sounds were exactly what we thought. Snow breaking off the peaks and forming avalanches in the valley. She was hiking further up the valley and saw one of the avalanches. 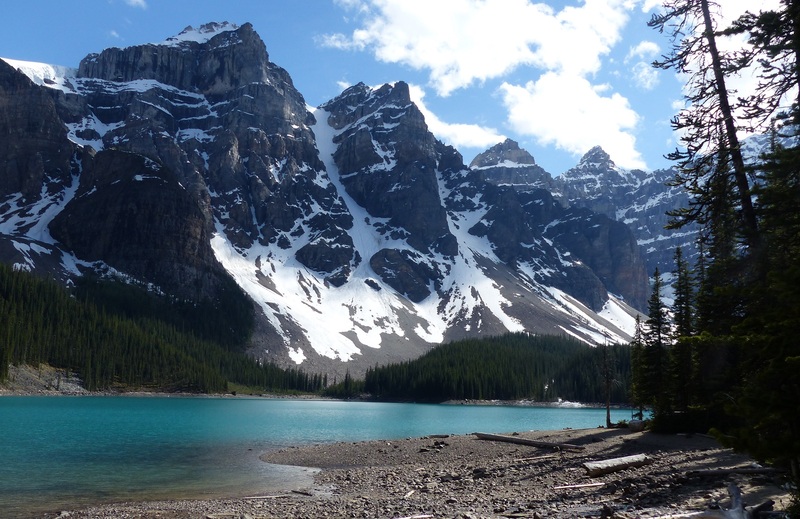 In fact Moraine Lake had been closed to the public only until the day before due to the number and nearness of potential and actual avalanches in the area. Recent avalanche. Note the pine trees pushed over on an angle. We also learned that avalanches is a name that can also be applied to landslip or landslides. 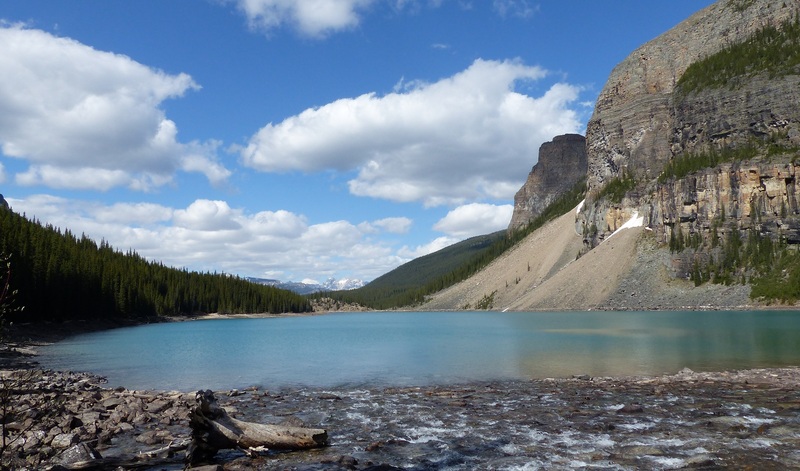 A view of Moraine Lake from the far end. Note the evidence of recent “land slide” or “avalanche” on the right hand side of the photo. Donnis through the trees at Moraine |Lake. Looking around the valley we saw recent evidence of both snow and land avalanches around the lake. 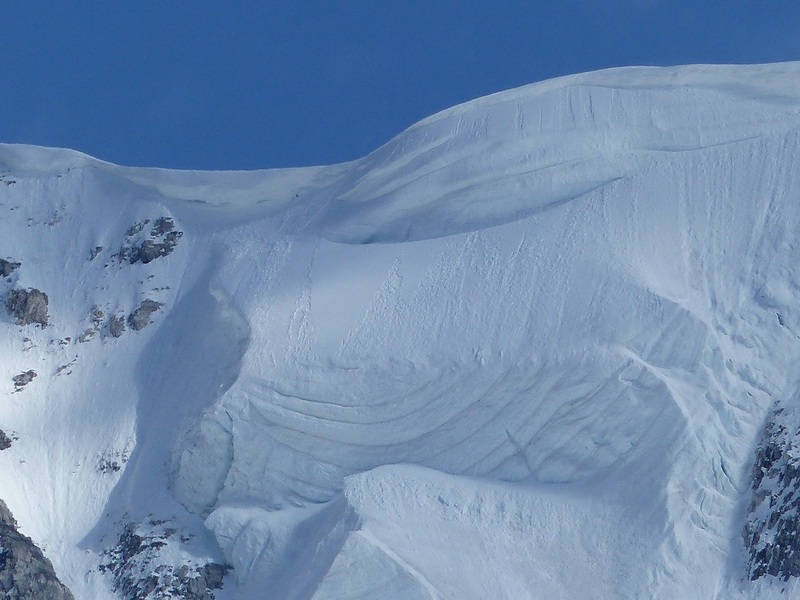 We could also see formations of snow, built up over a number of seasons and beginning to form a top heavy peak which will fall and cause an avalanche sometime in the future. We were fascinated by these formations. Several seasons of snow creating a avalanche sometime in the future. 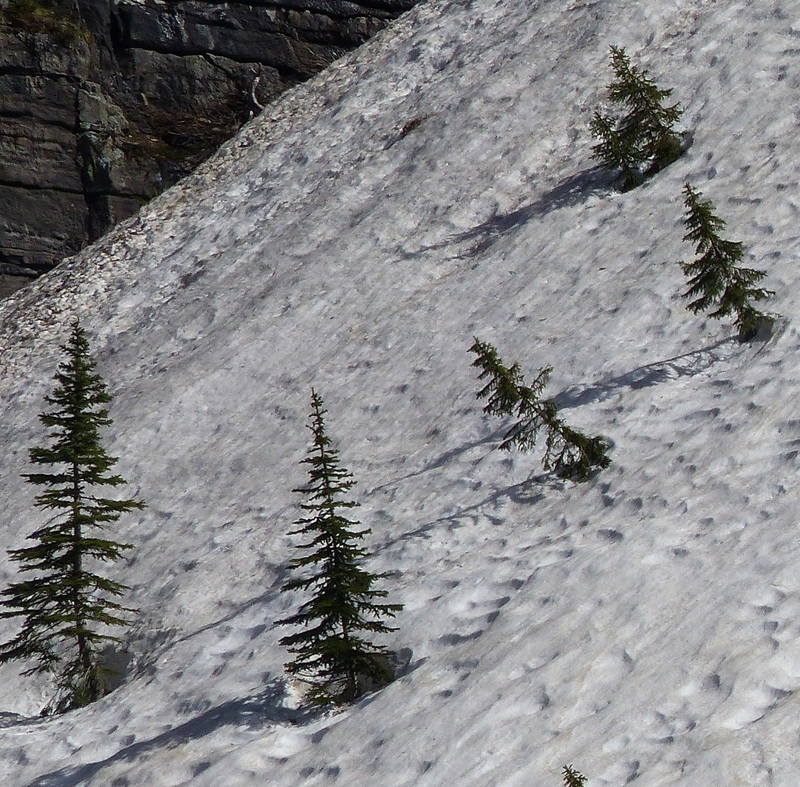 Spring always brings on a flurry of avalanche activity. It was another long and busy day.